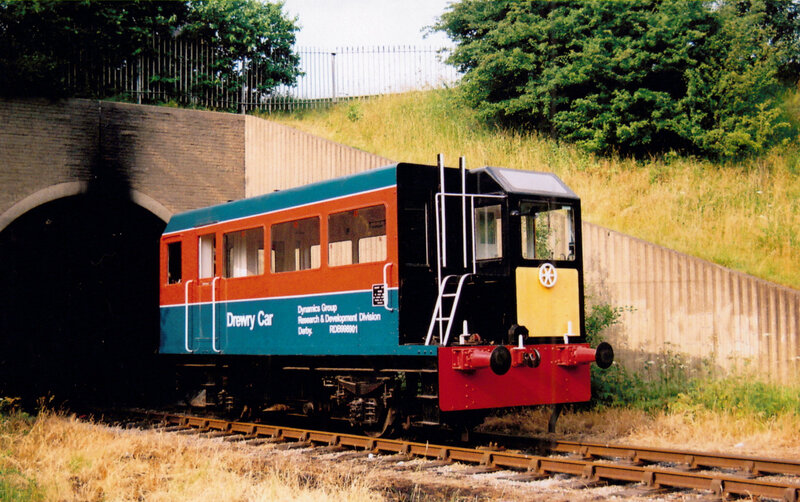 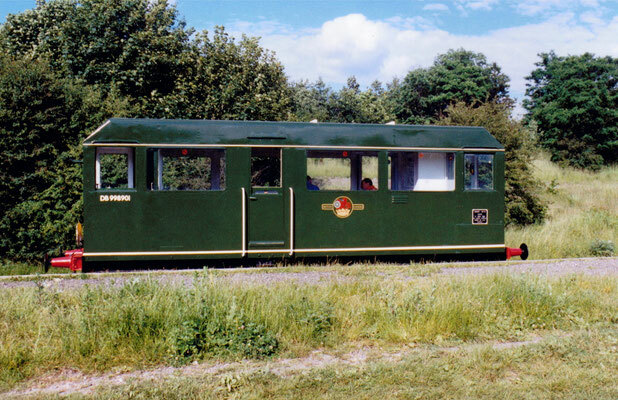 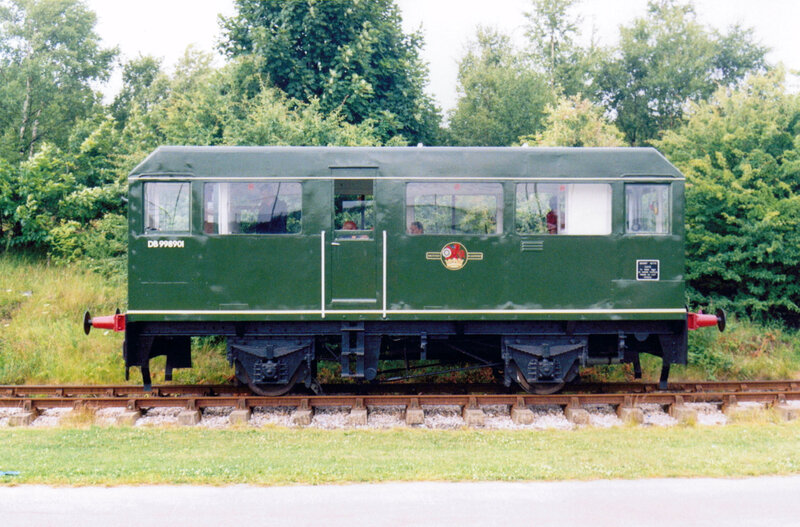 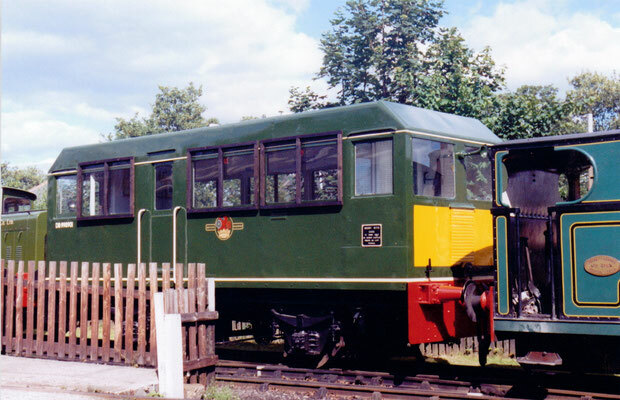 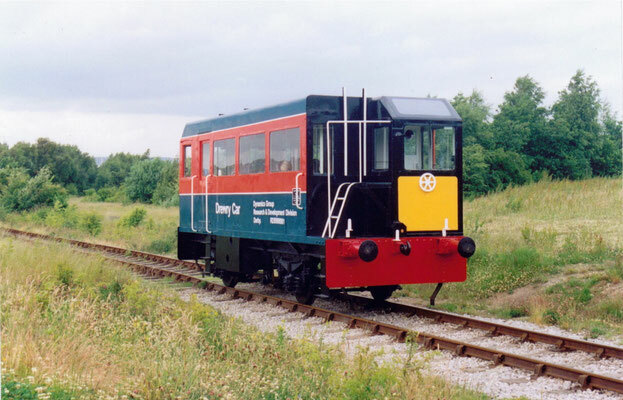 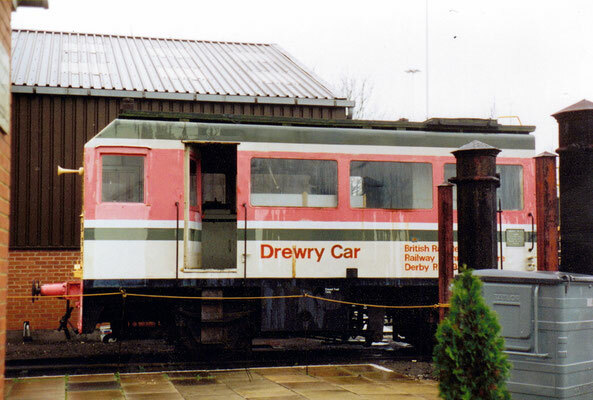 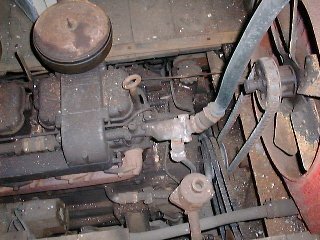 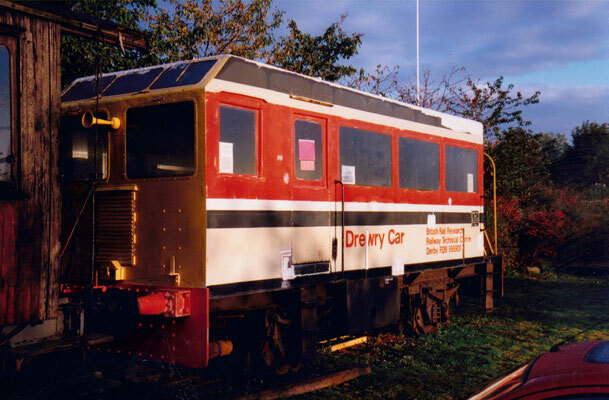 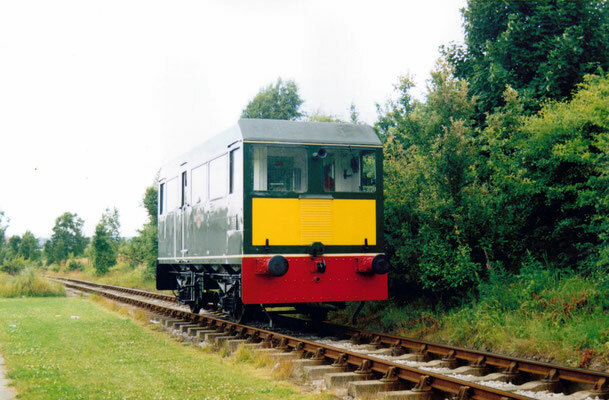 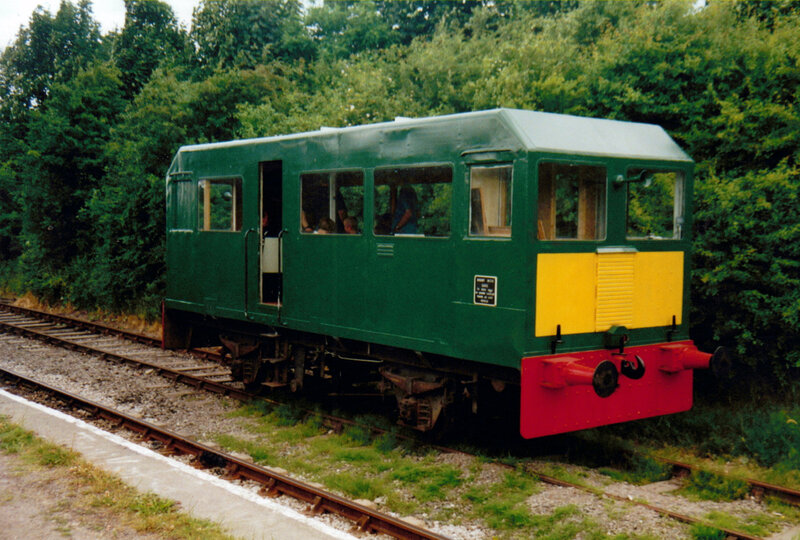 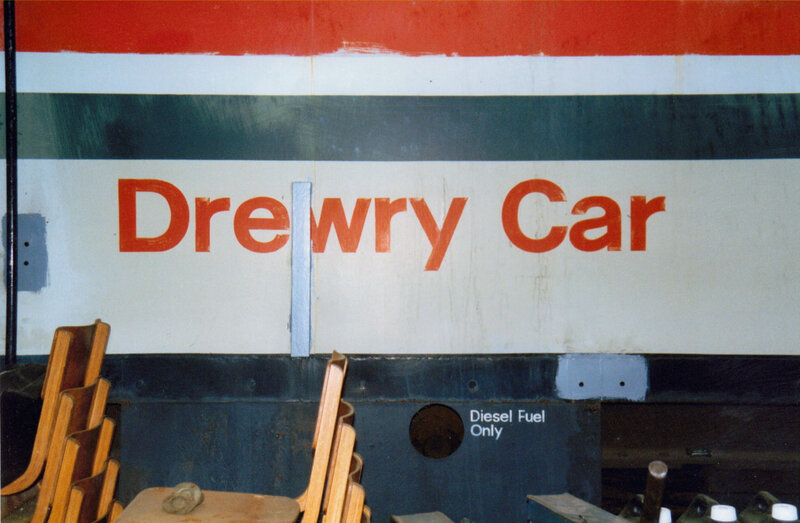 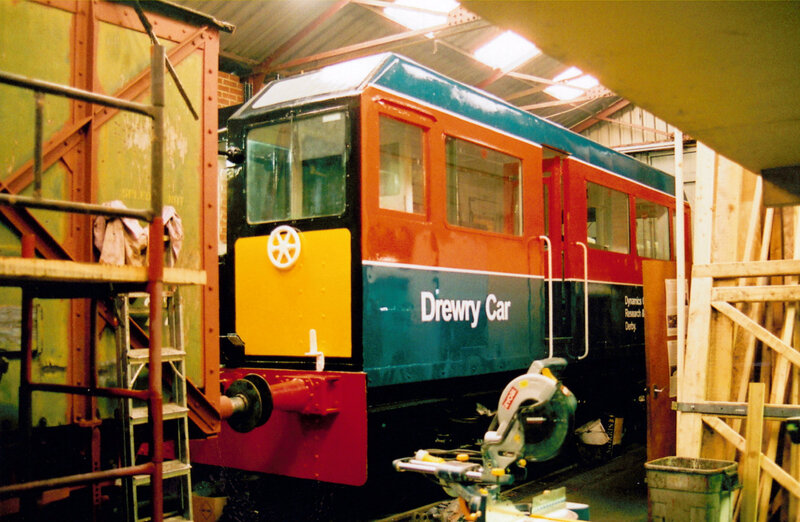 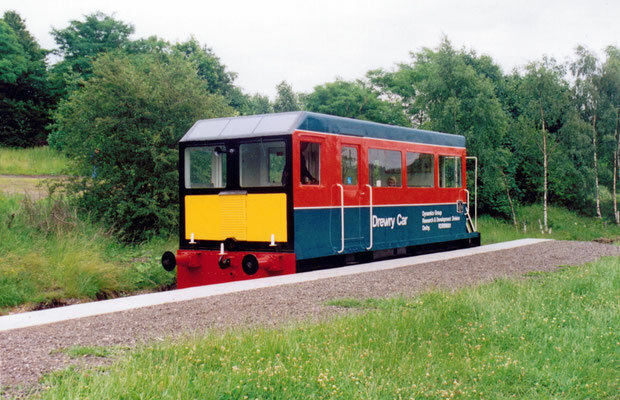 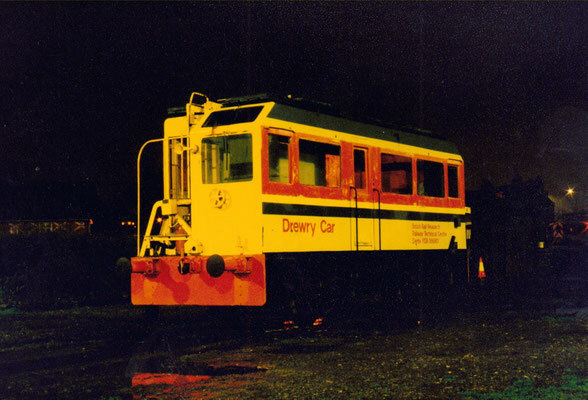 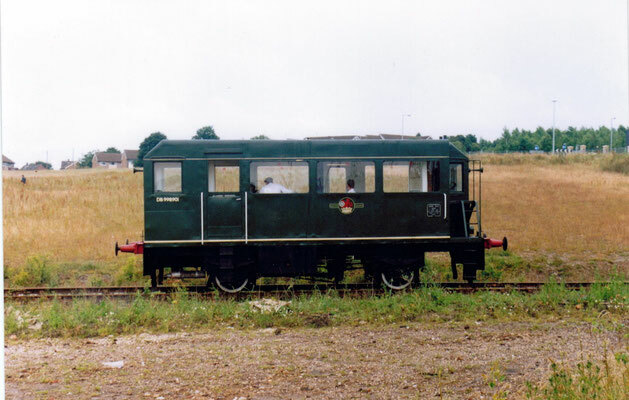 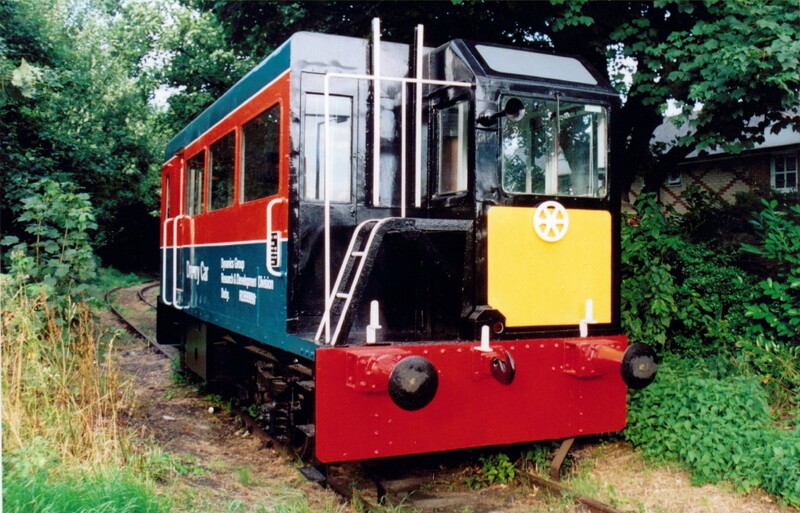 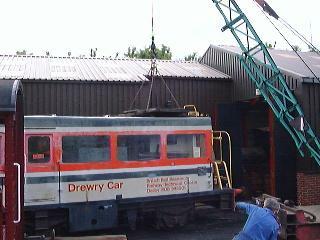 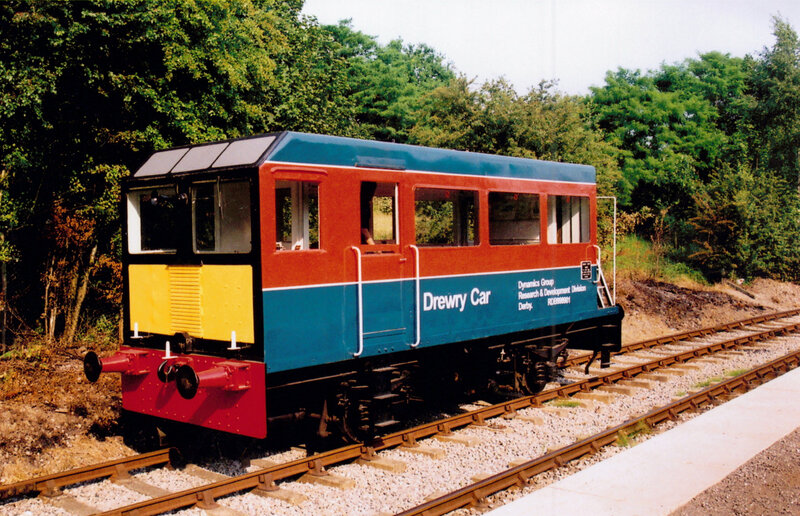 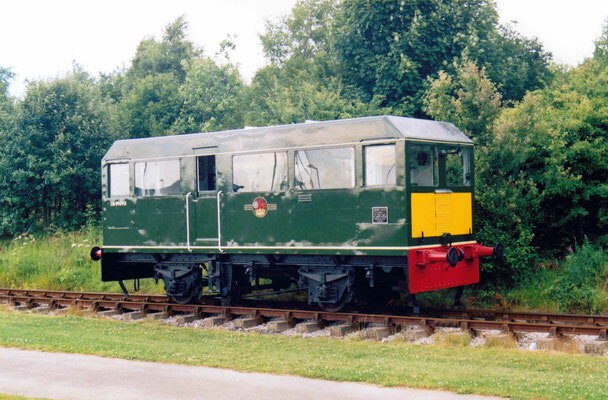 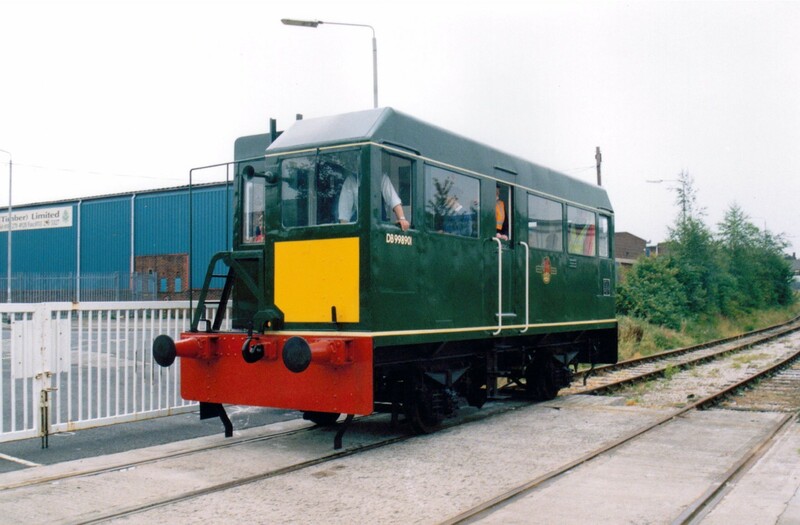 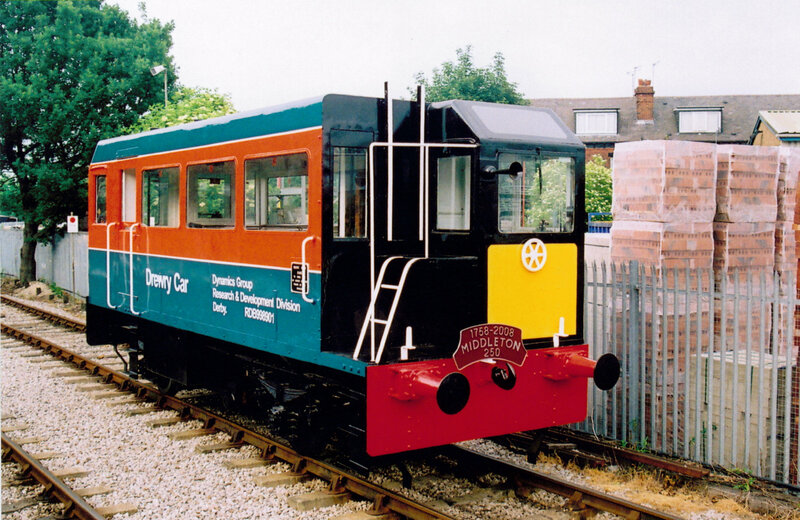 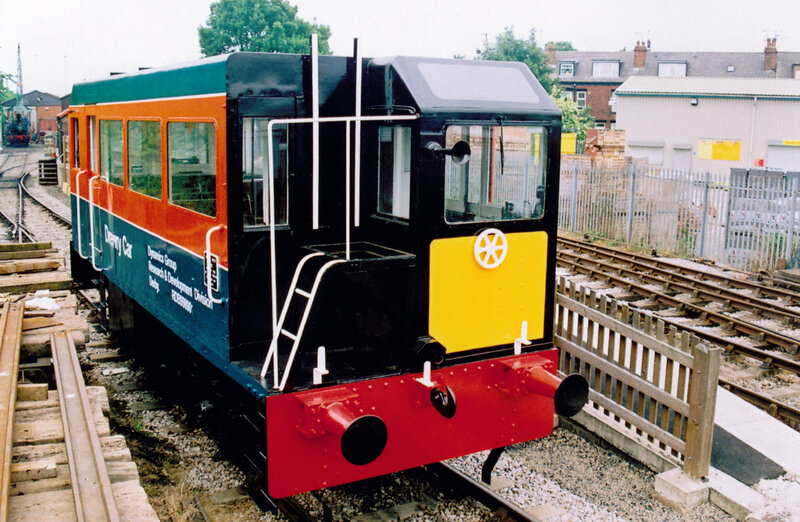 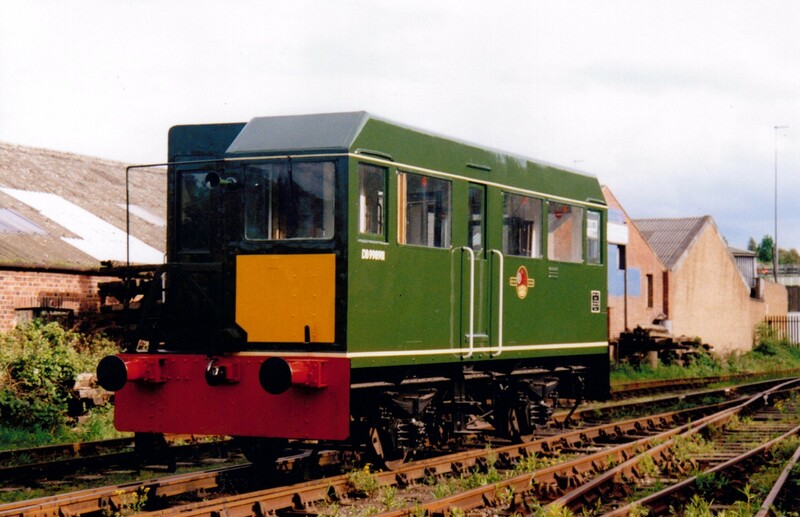 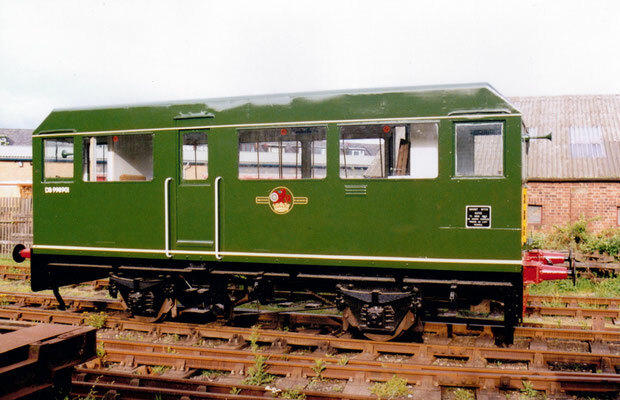 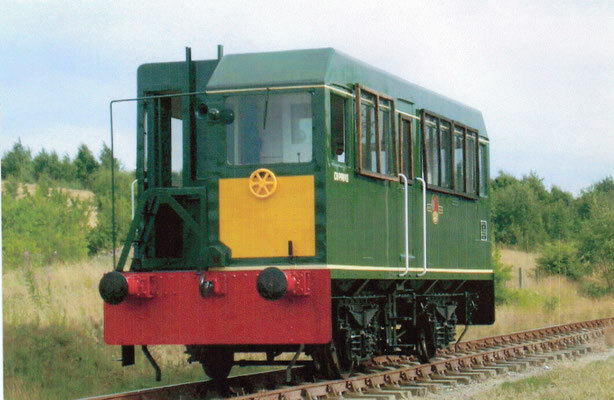 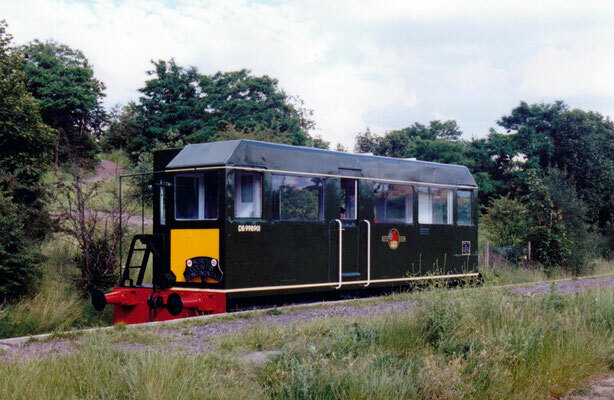 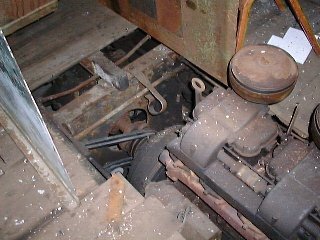 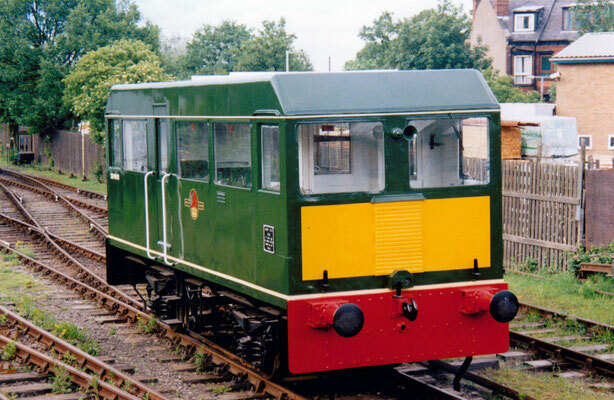 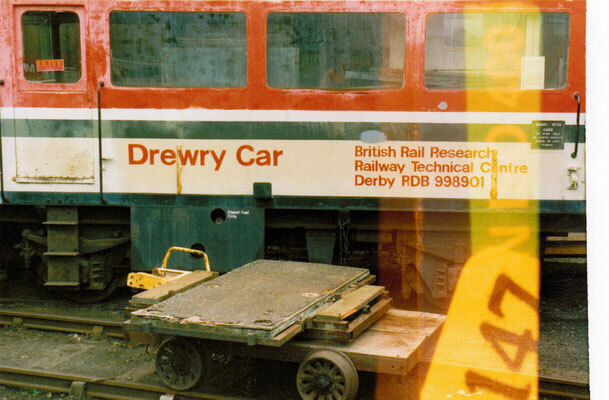 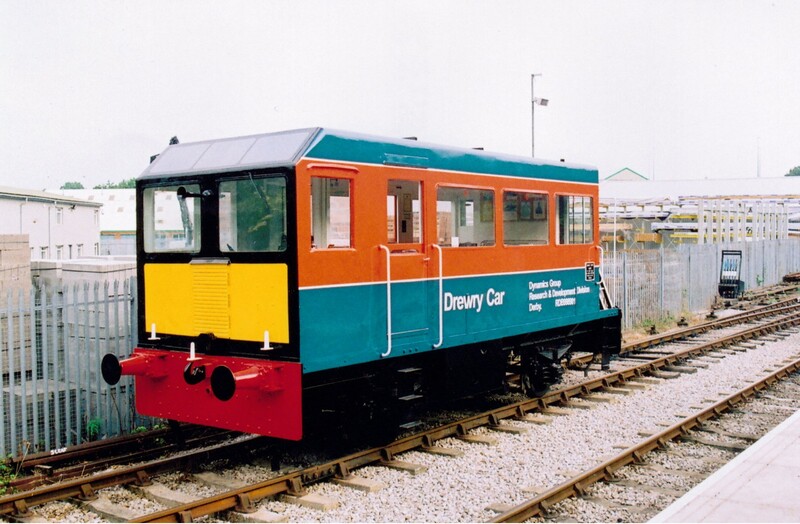 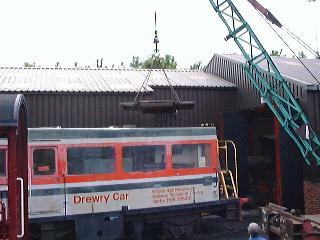 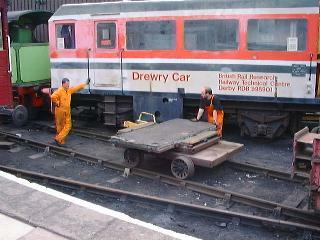 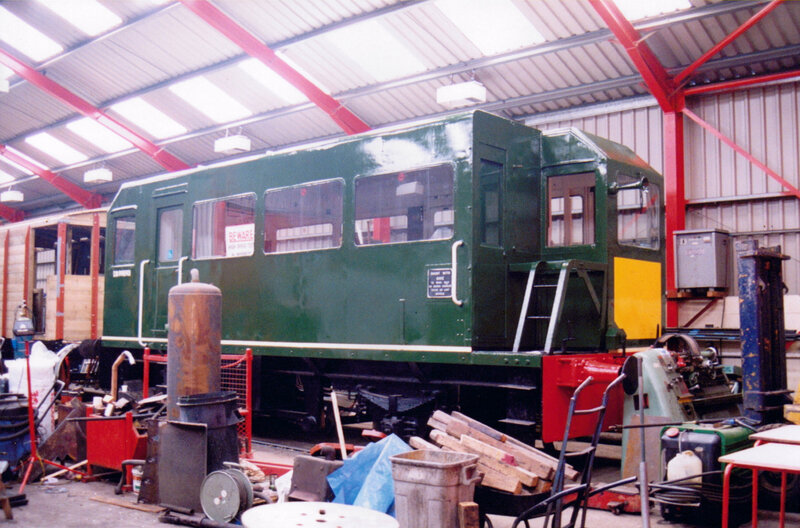 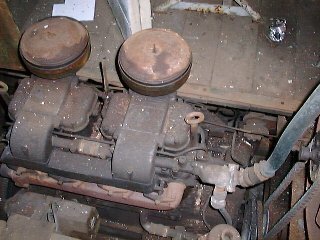 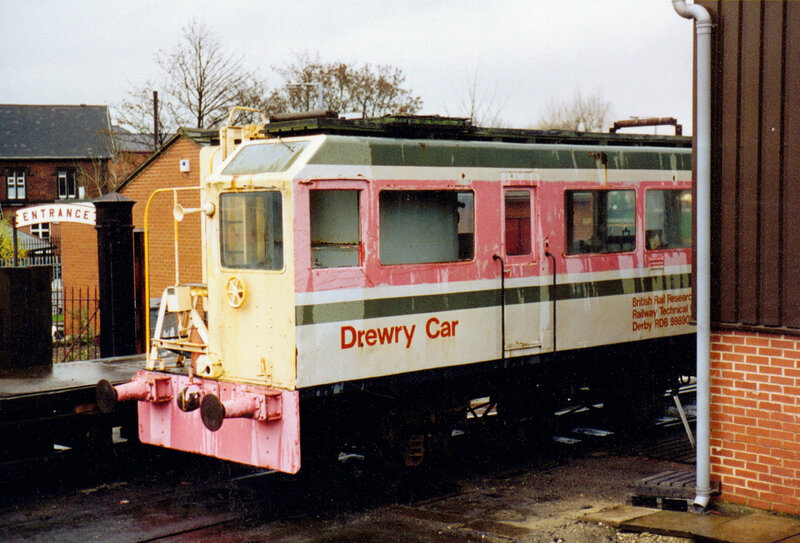 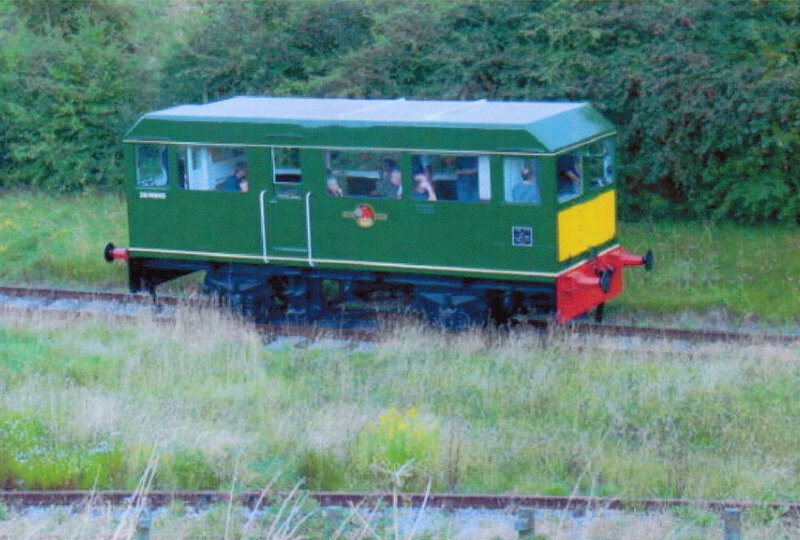 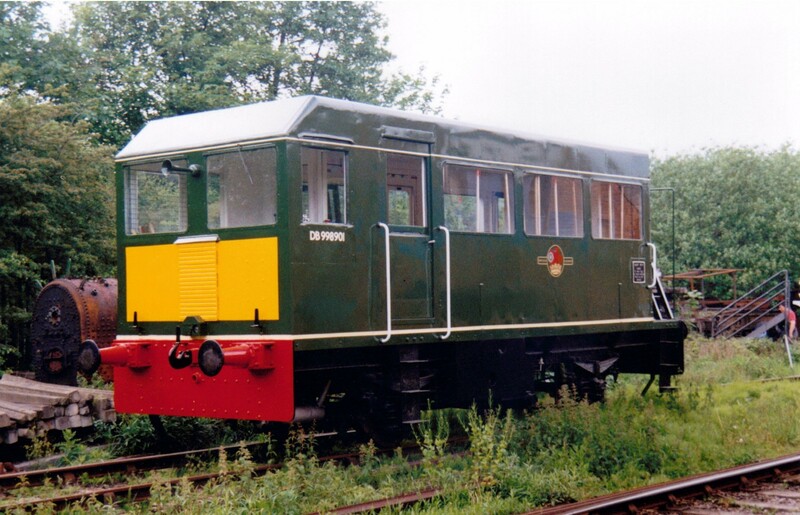 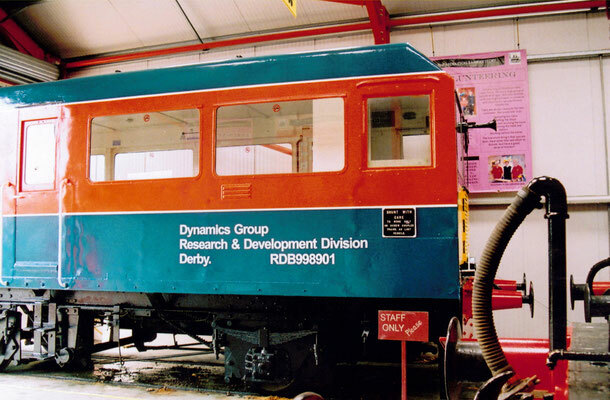 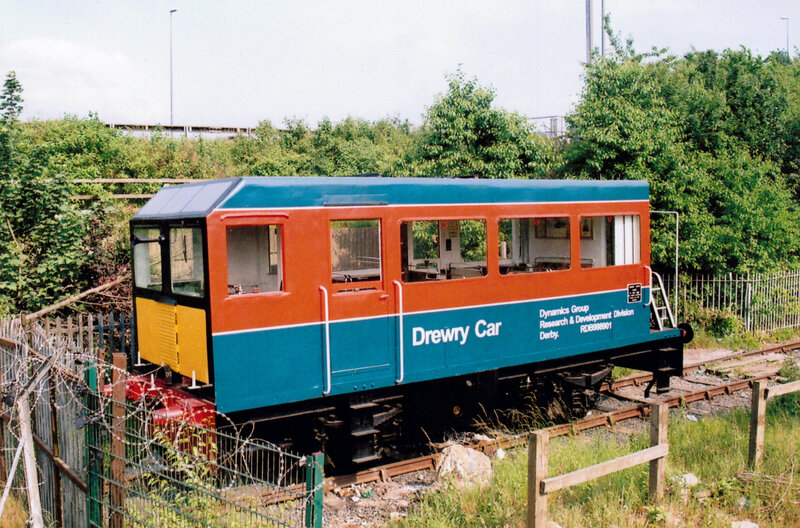 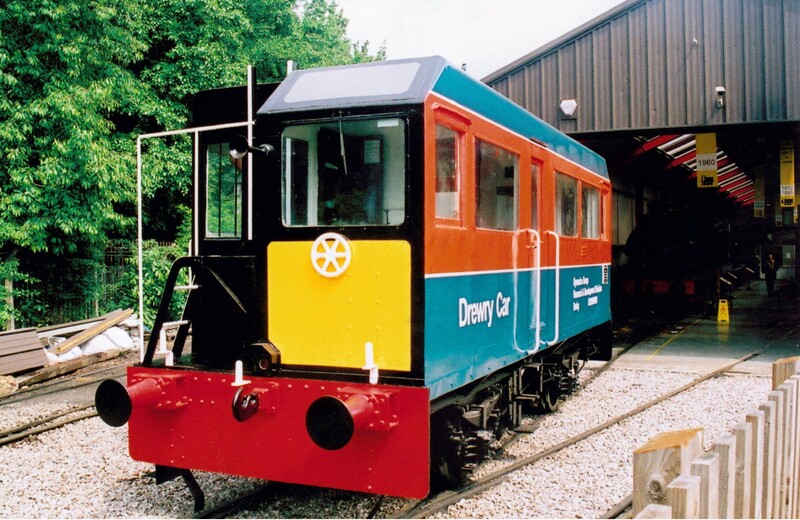 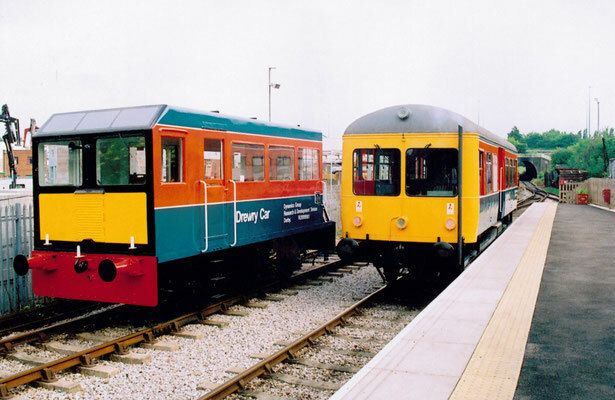 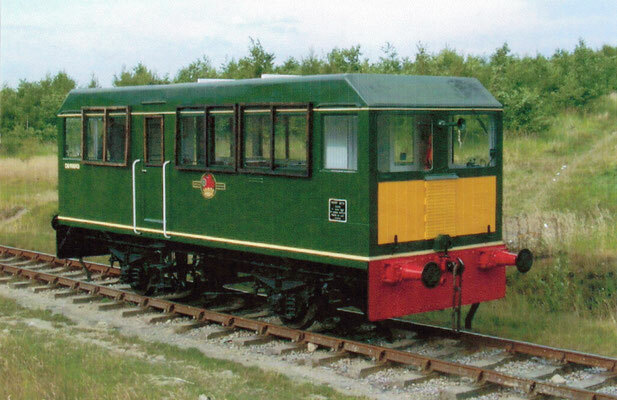 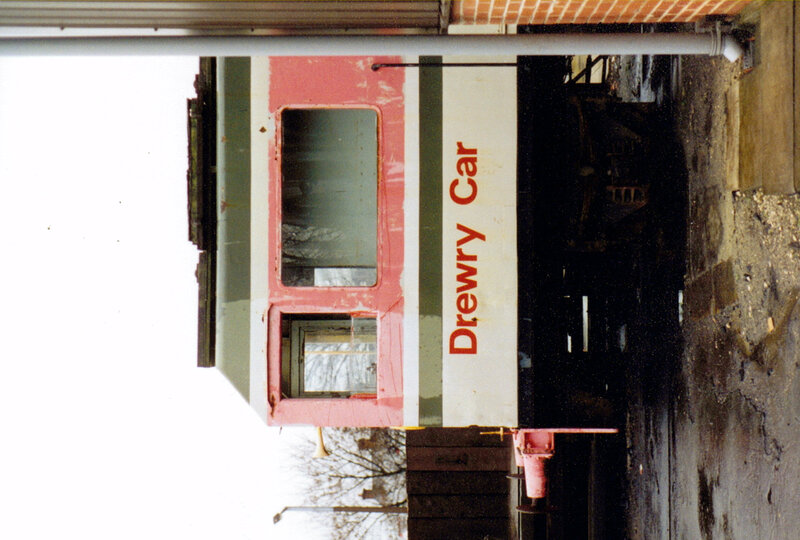 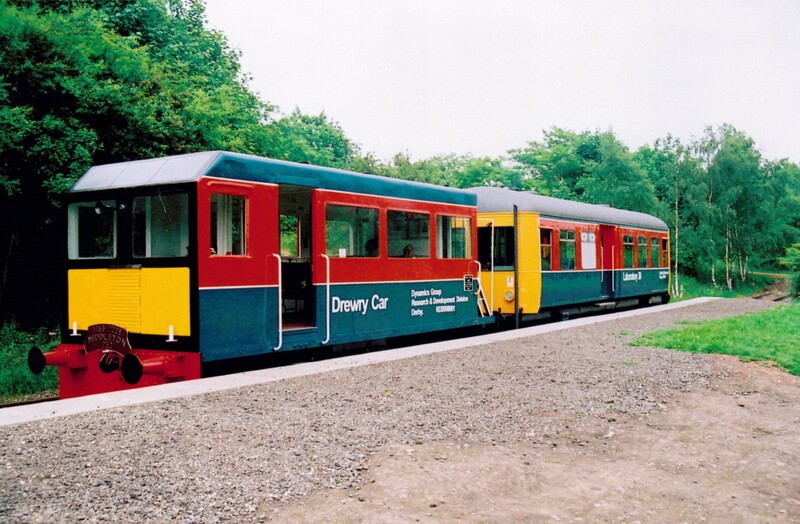 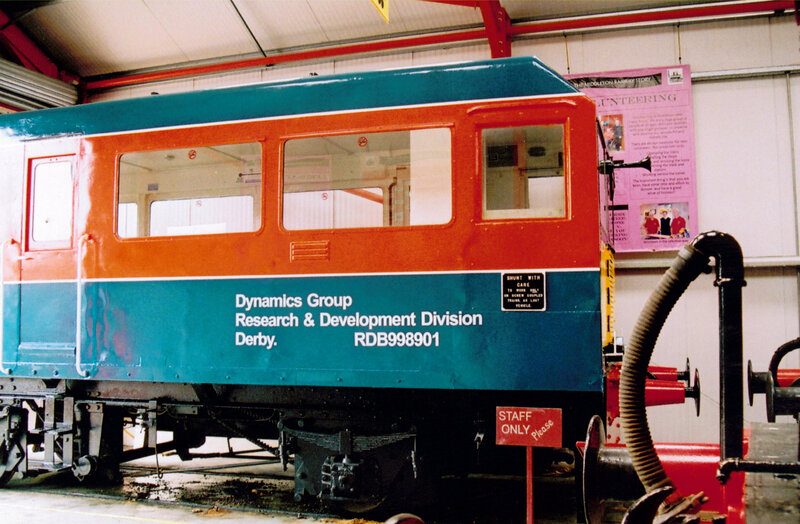 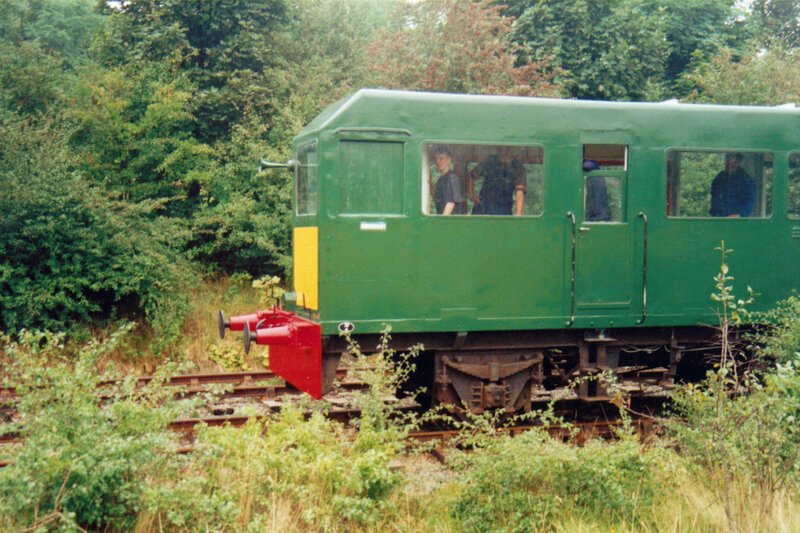 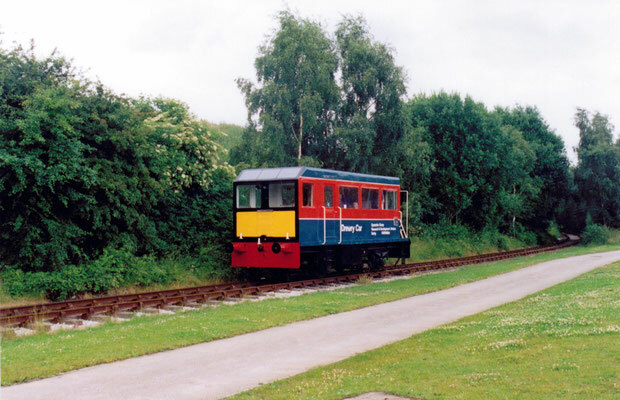 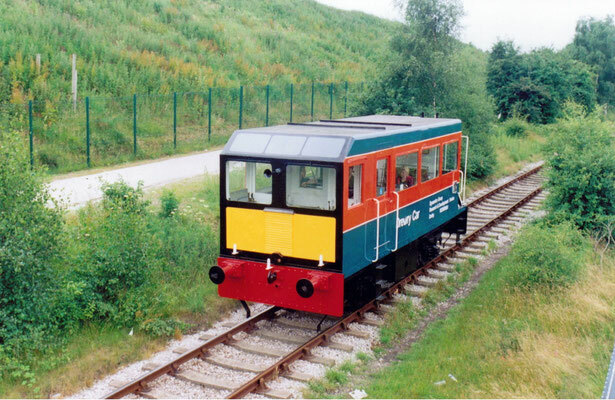 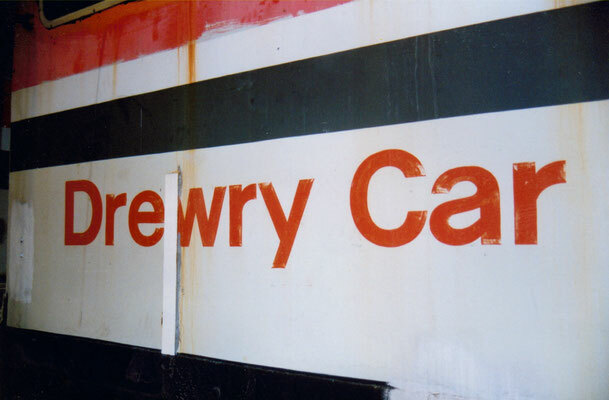 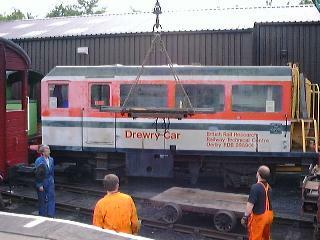 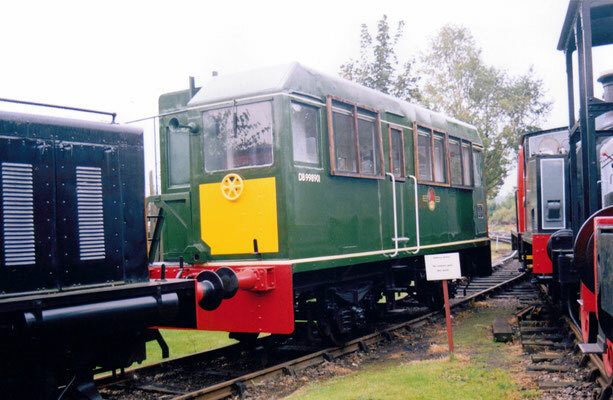 This is one of two vehicles built by the Drewry Car Company in 1950 for British Railways for overhead line inspection and maintenance. 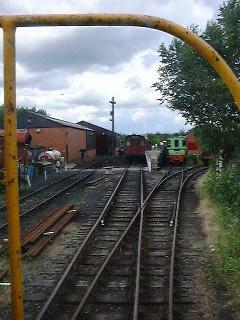 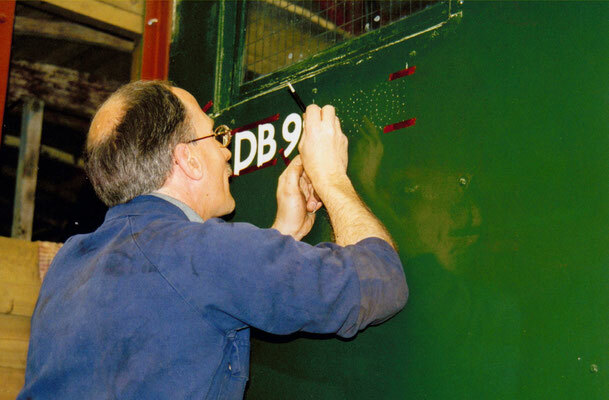 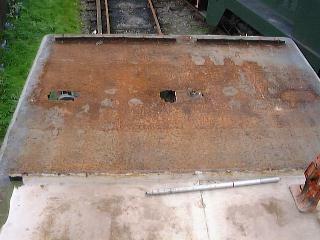 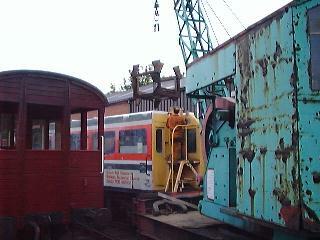 They were works numbers 2267 & 2268, and were given the numbers DB998900 & DB998901 by British Railways. 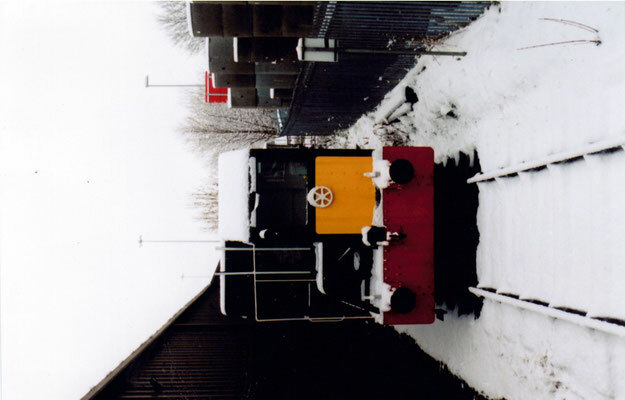 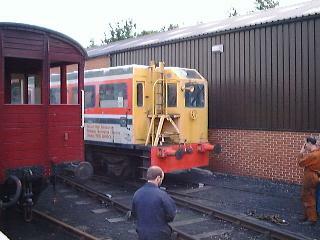 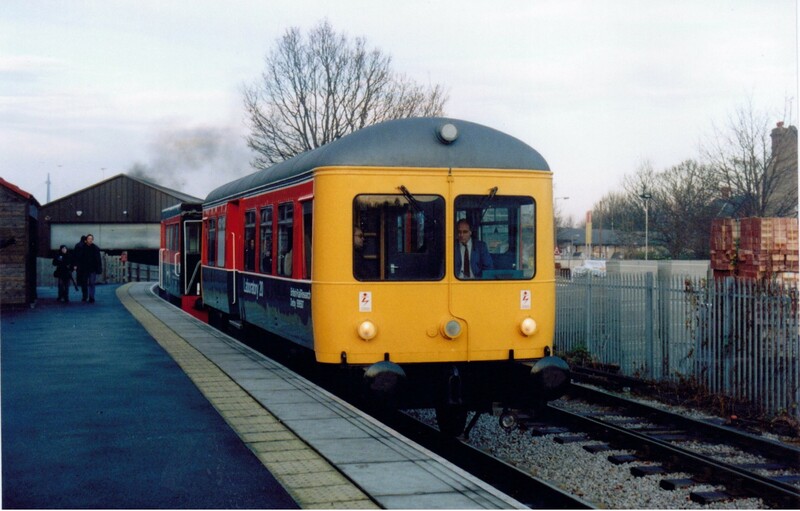 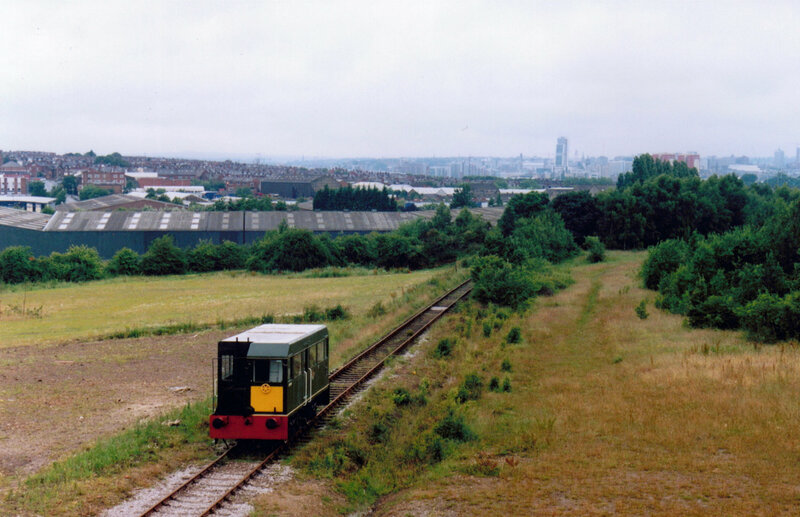 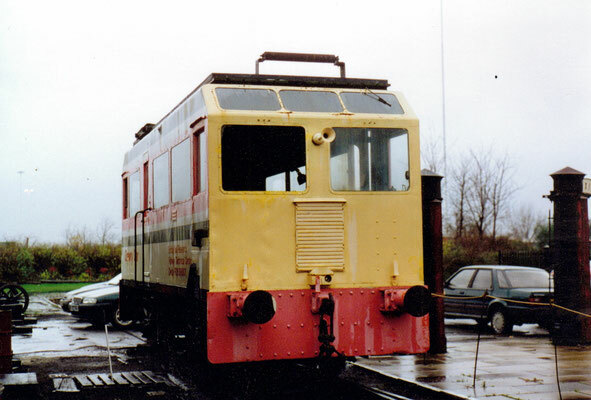 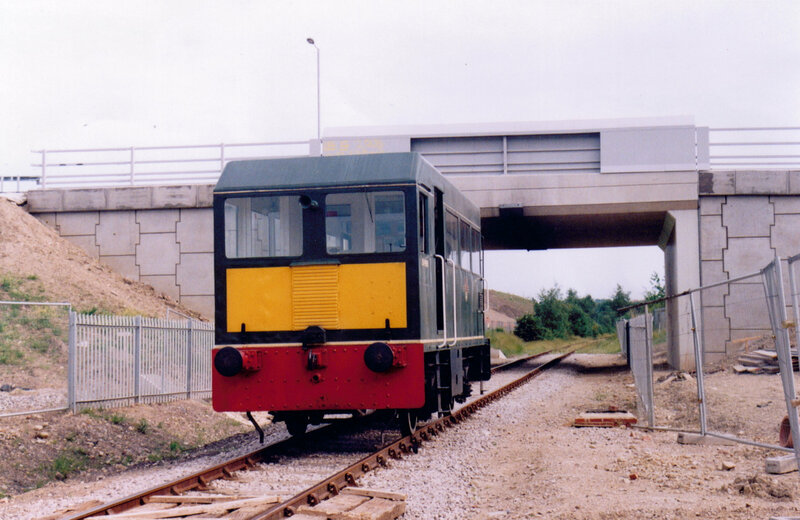 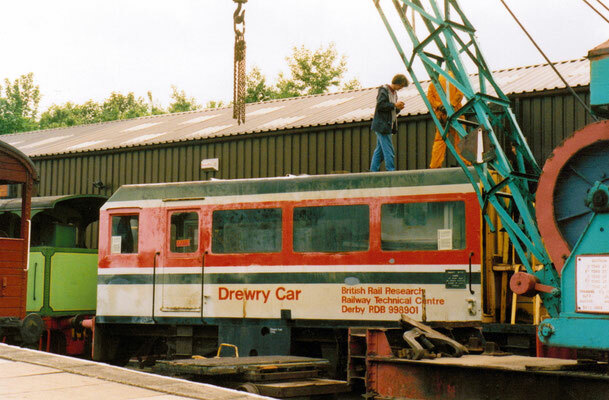 This vehicle (DB998901) was originally used on the Manchester - Sheffield - Wath (Woodhead) and its sister was used on the Great Eastern electrification scheme. 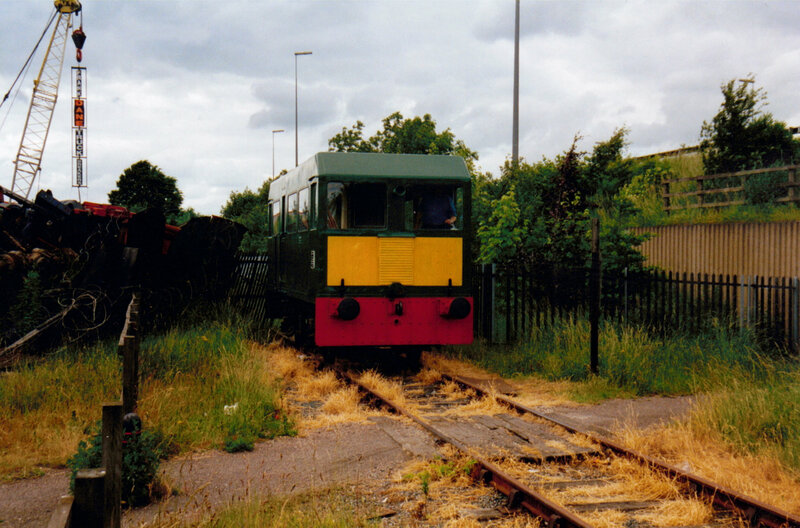 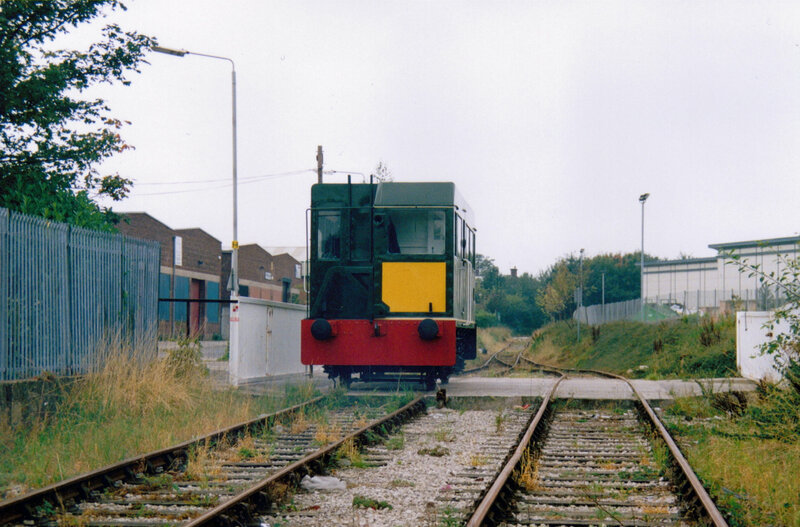 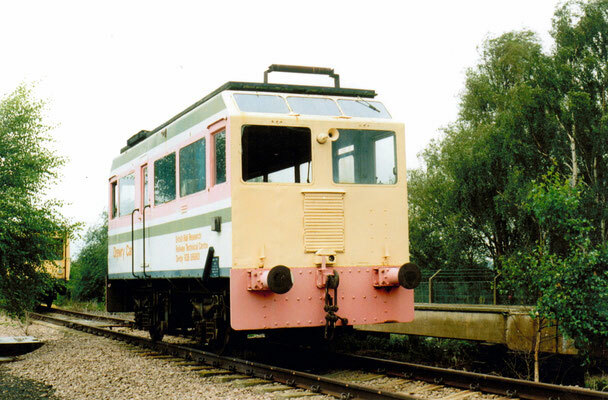 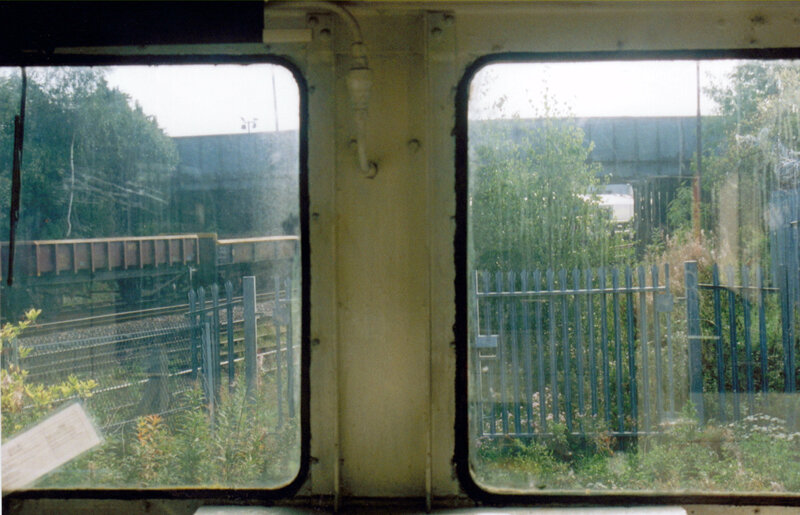 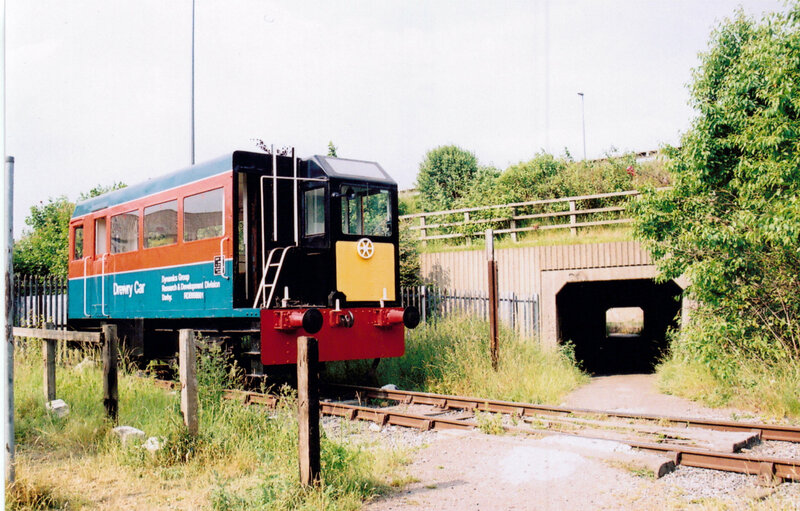 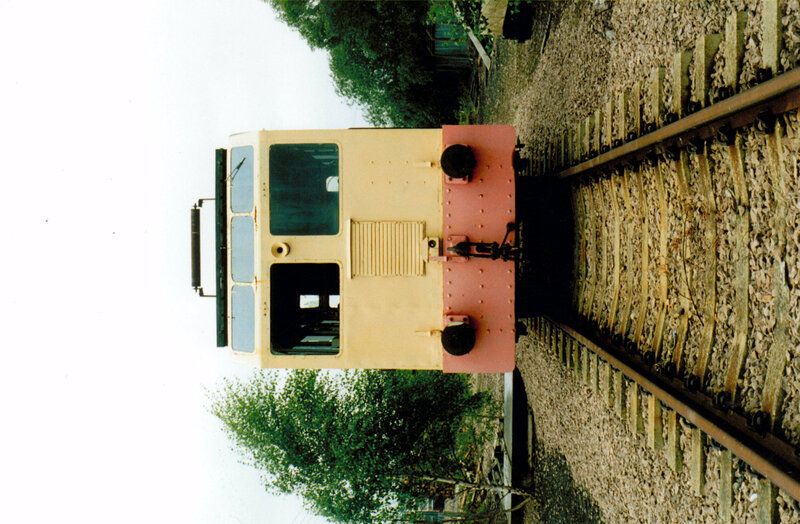 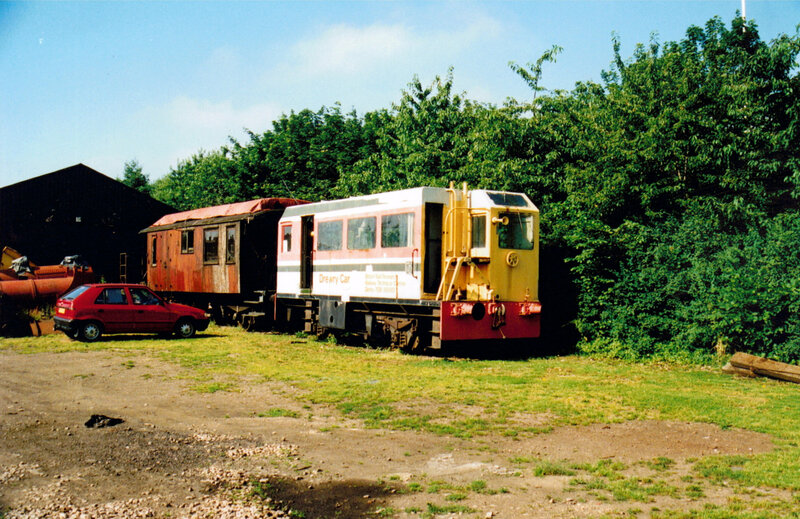 By 1968 both vehicles had gravitated on Colchester overhead line depot, neither being used outside the depot since that date, although 998901 had been used in the depot sidings "on the odd occasion" up to 1975. 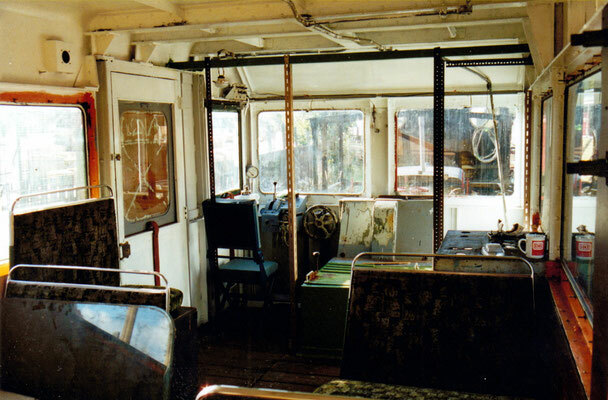 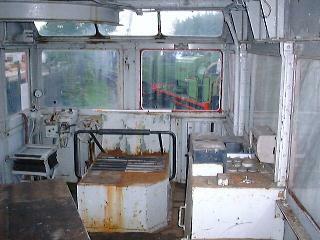 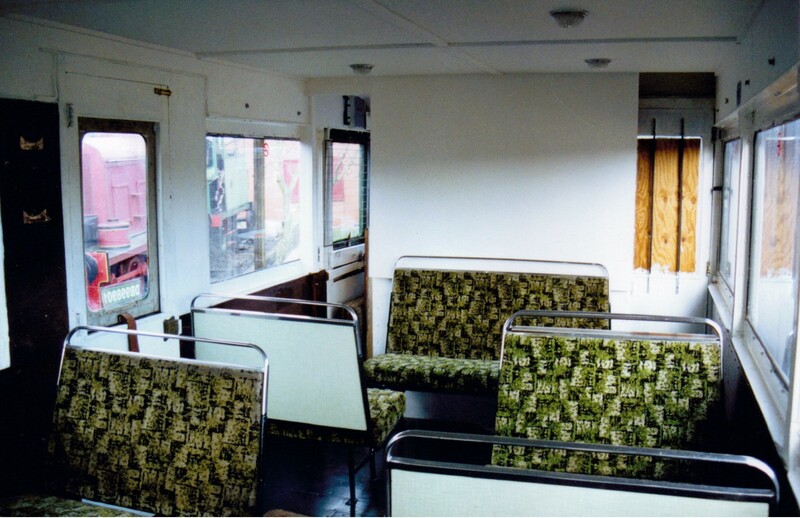 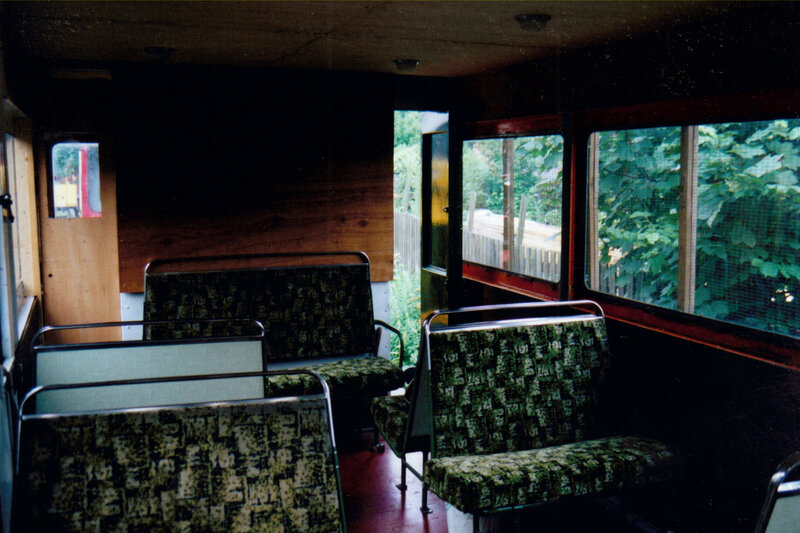 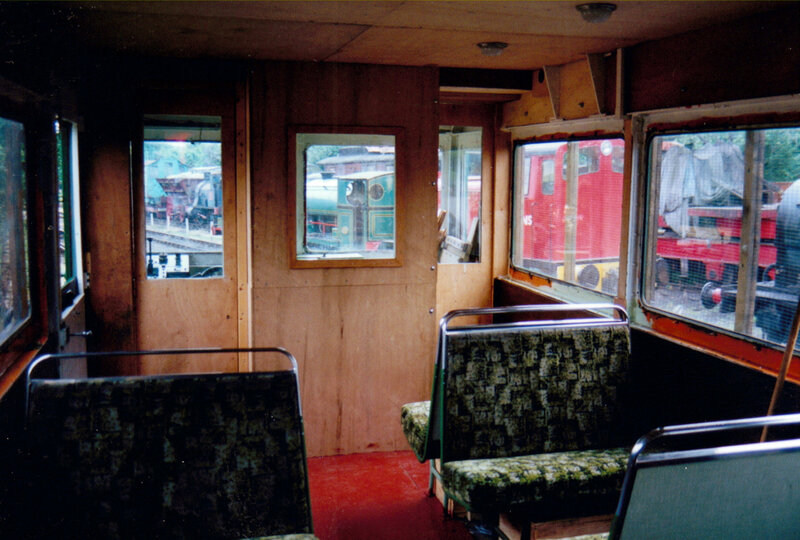 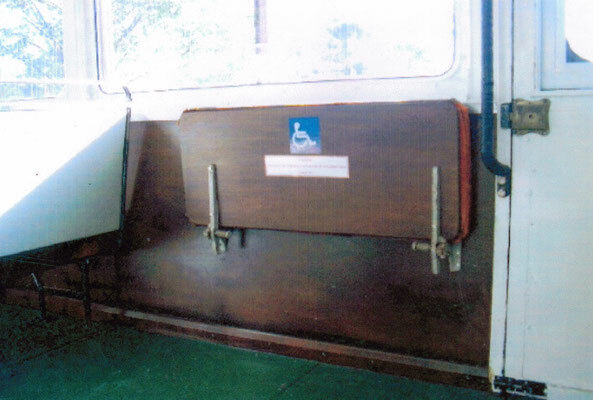 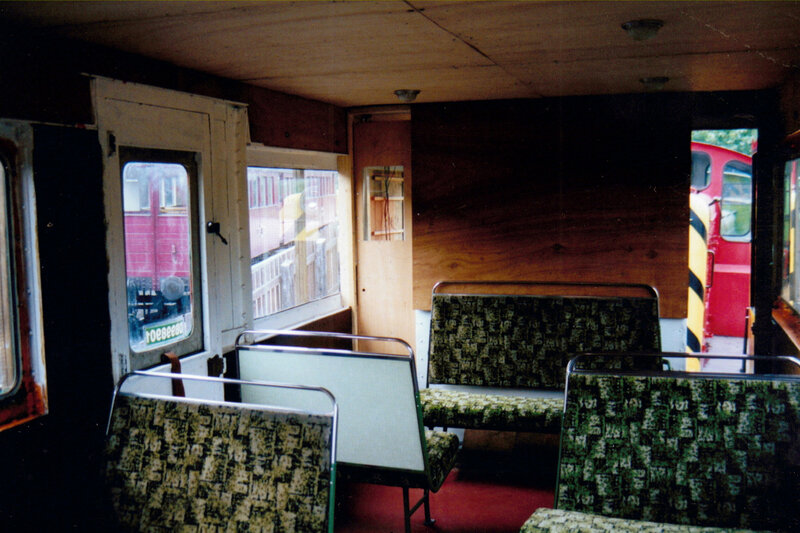 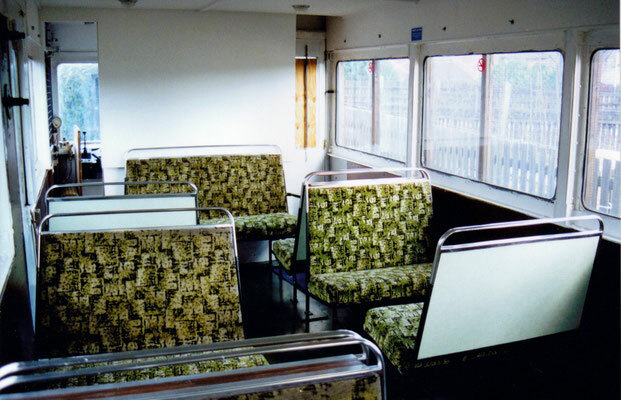 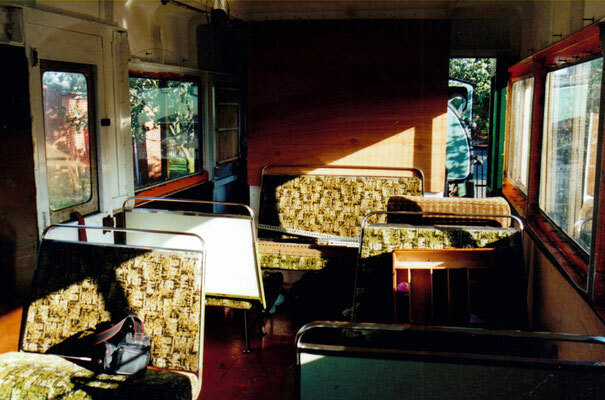 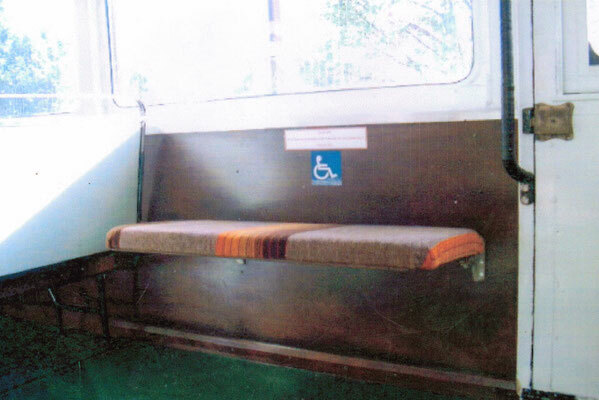 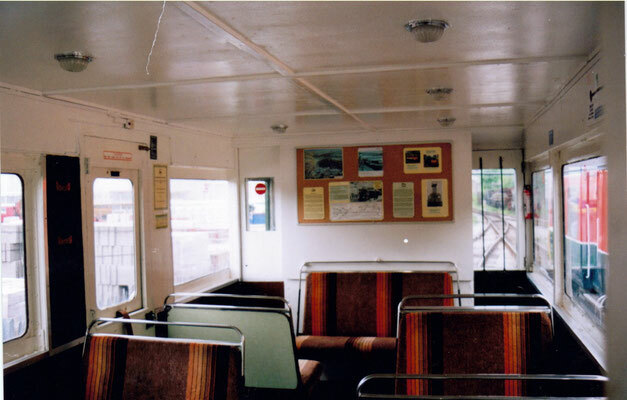 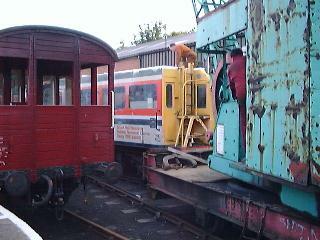 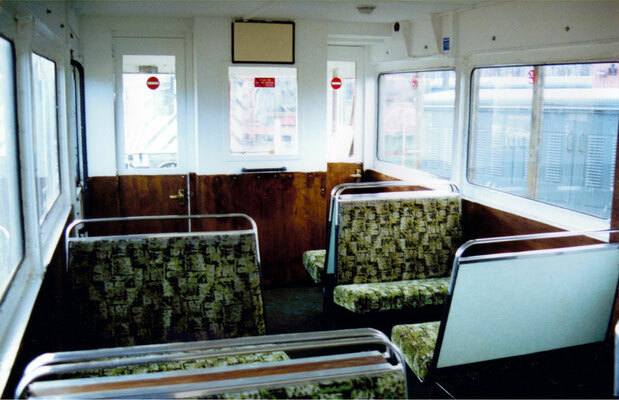 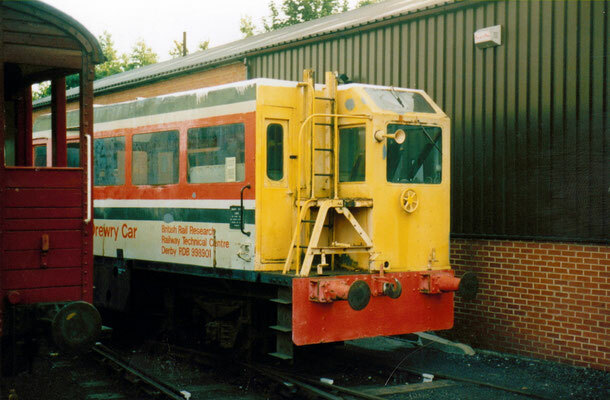 The vehicles were offered for disposal on the Eastern Region 'surplus to requirements' list in late 1976. 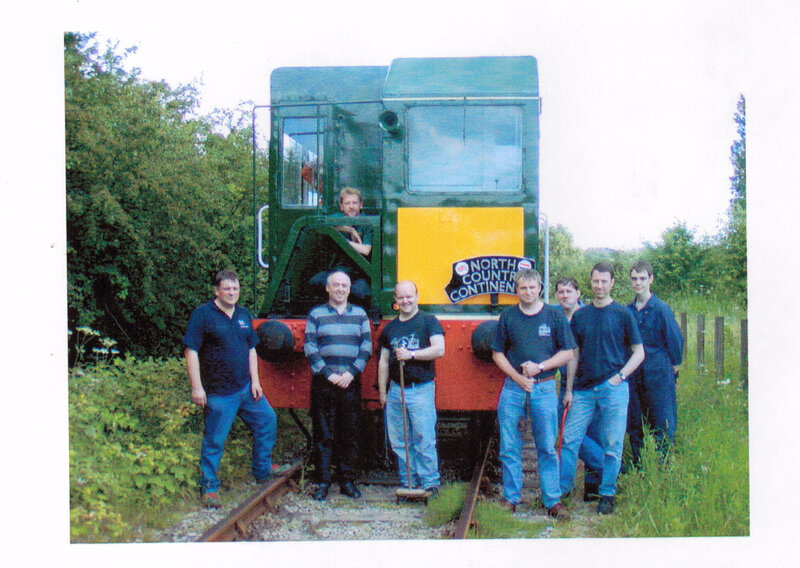 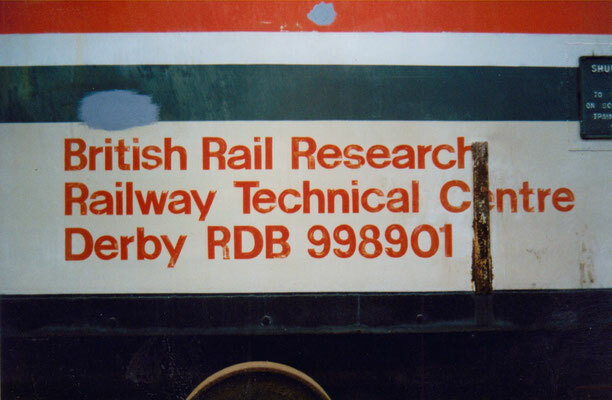 They were duly inspected by Derby Technical Centre staff, who were erecting non-operational overhead line equipment on their test track at Old Dalby in Leicestershire (in connection with the APT project?). 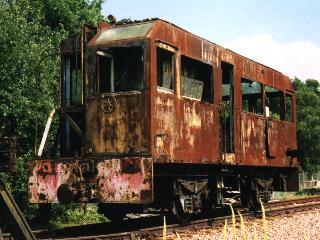 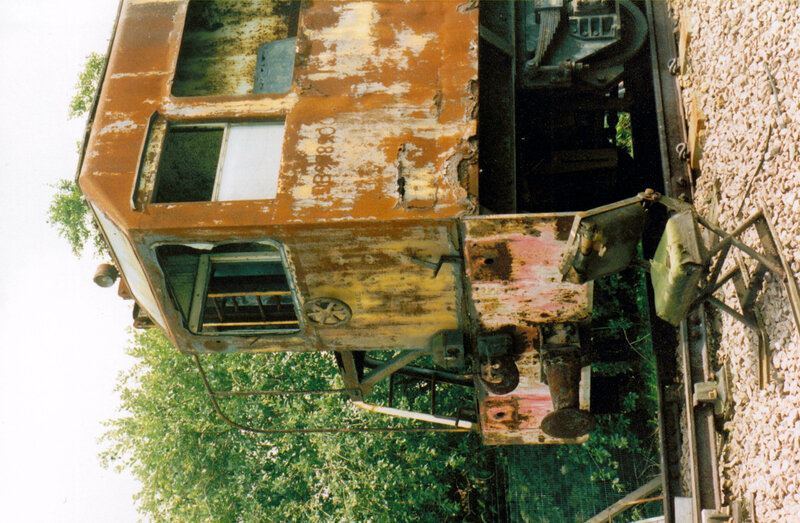 They decided that one good vehicle could be built from the two and the remains scrapped. 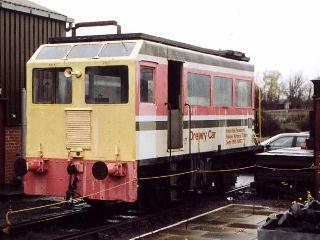 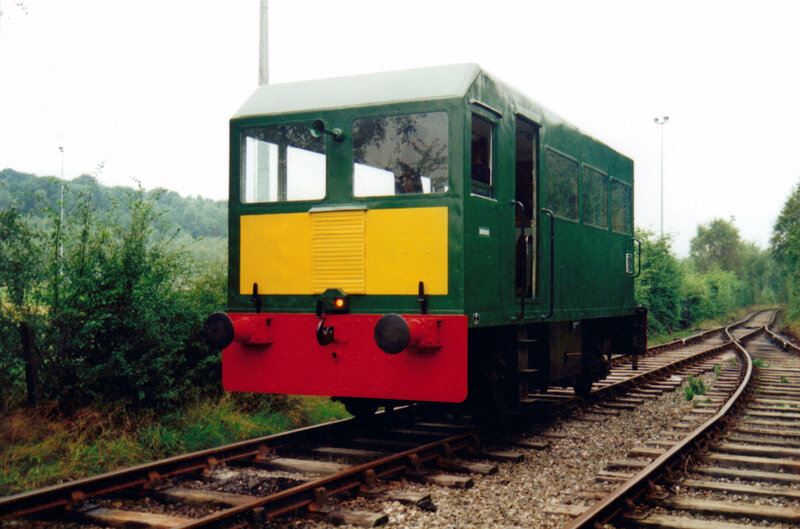 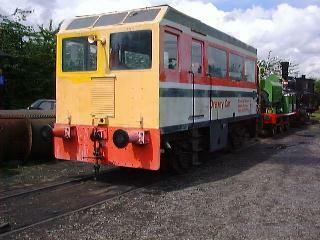 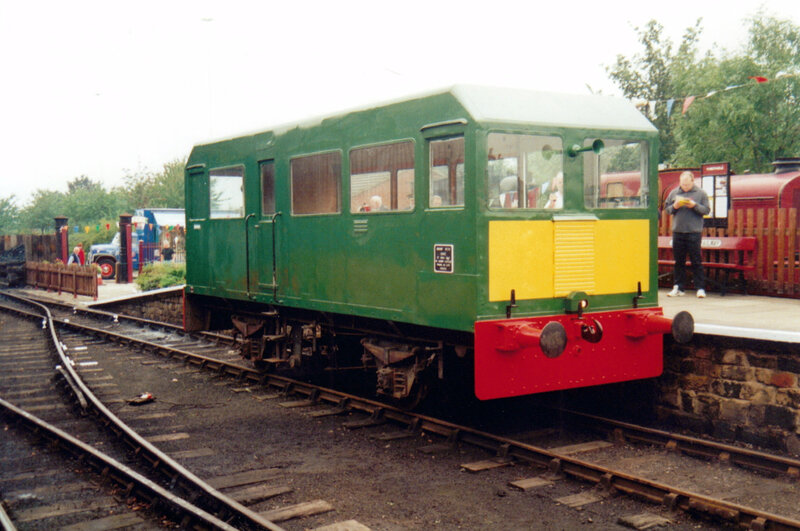 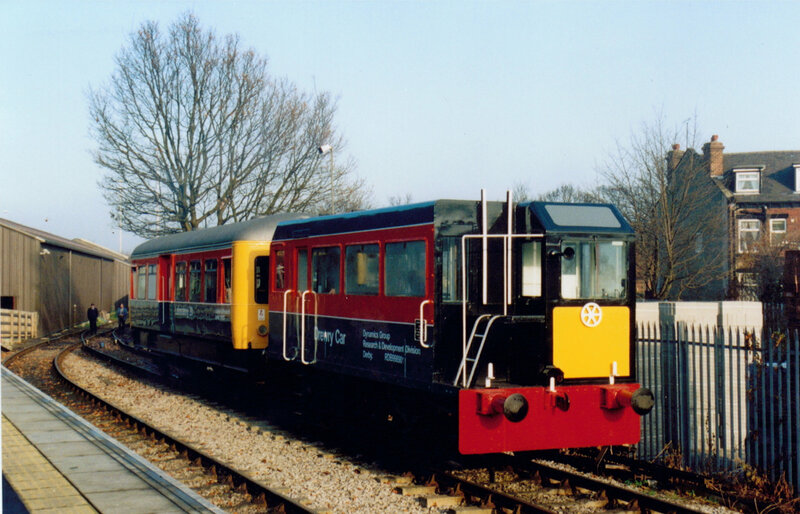 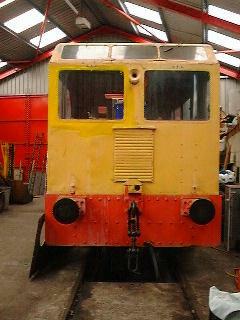 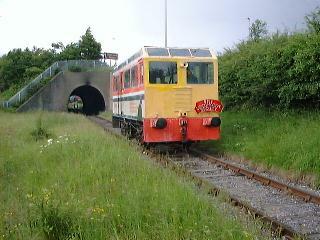 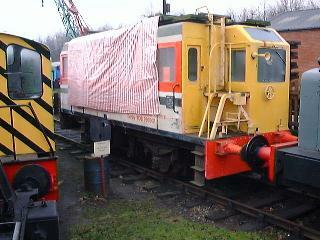 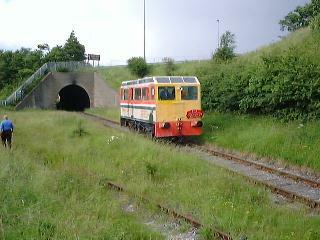 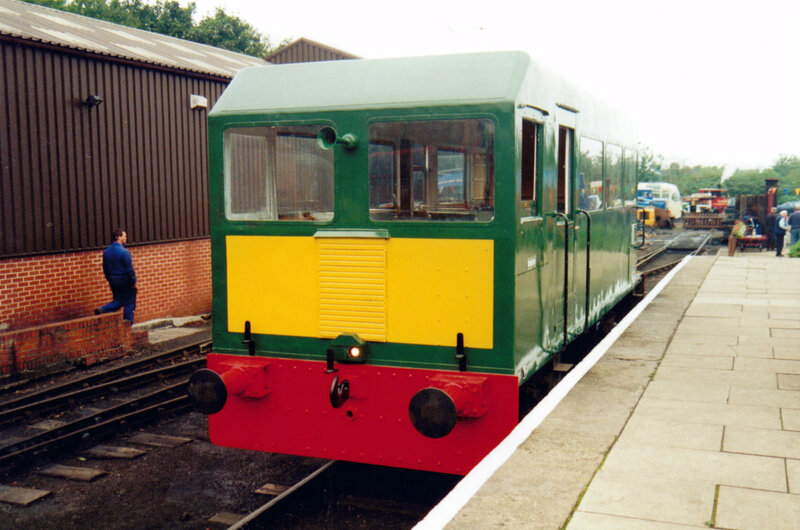 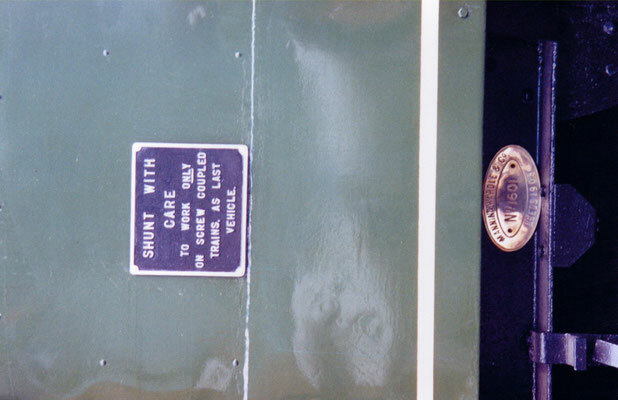 The vehicle would save hiring class 25's and crews, which cost approximately £160 for two shifts back in 1976. 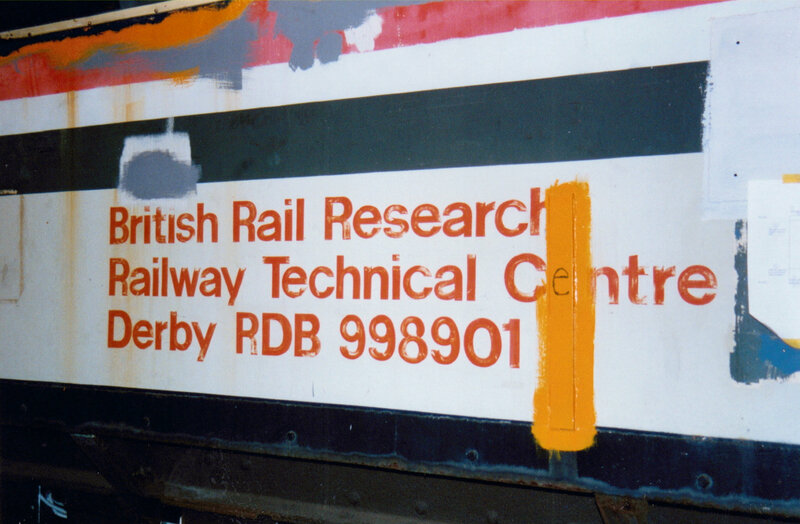 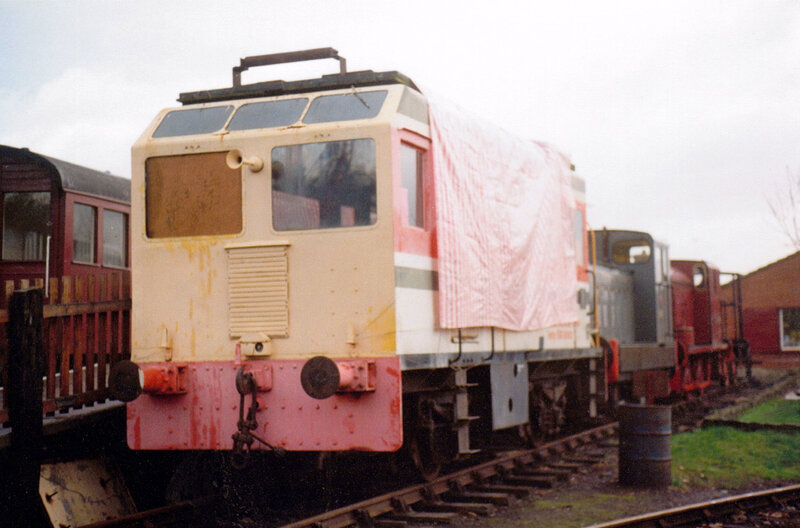 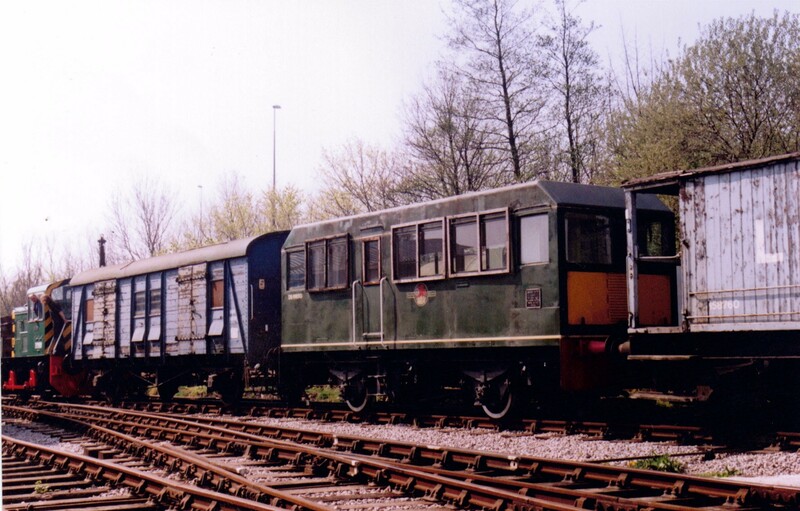 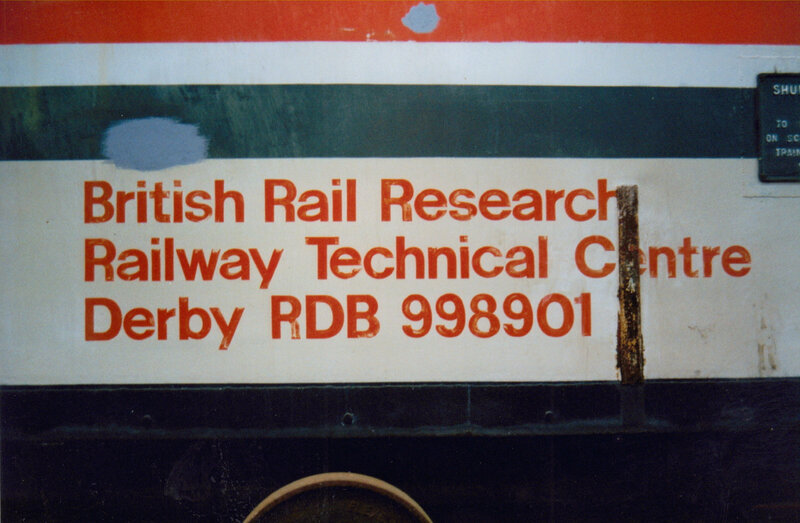 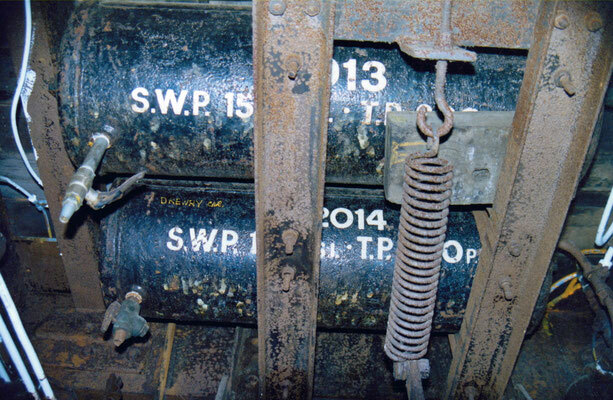 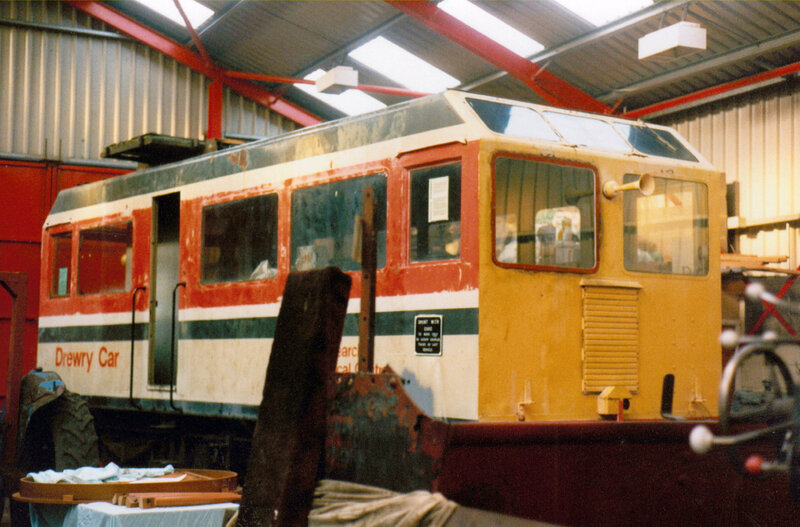 The vehicles are believed to have arrived at Old Dalby early in 1977 and 998901 had its number prefixed with an 'R' to indicate that it was a Research Centre vehicle. It made several visits to Derby works, the last occasion believed to have been in 1987 when it was hauled by 97201 (formerly D5061 & 24061, now preserved on the North Yorkshire Moors Railway) for body repairs and repaint. 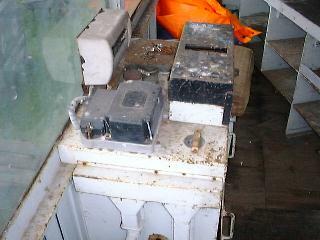 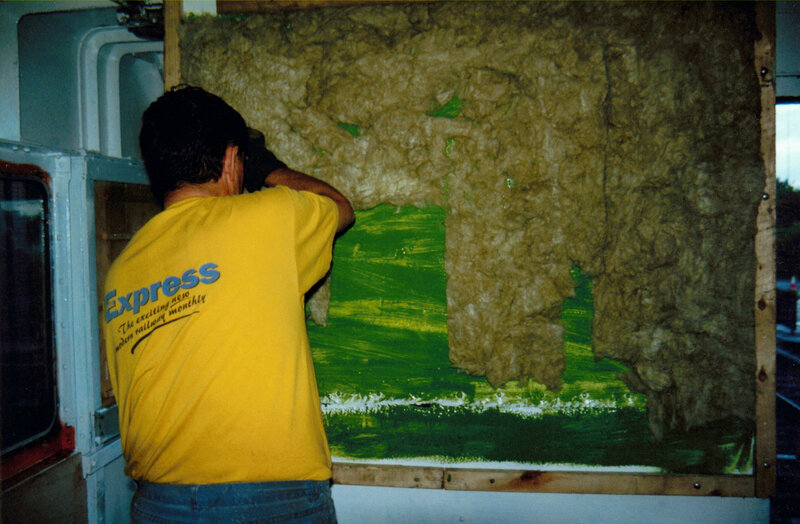 From documents held by the Society it is known that it was in use until October 1990 at the latest. 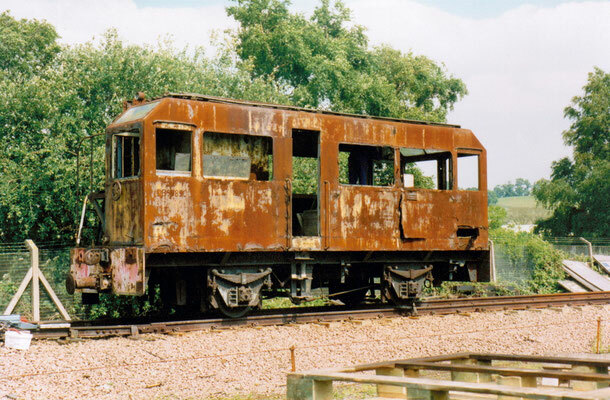 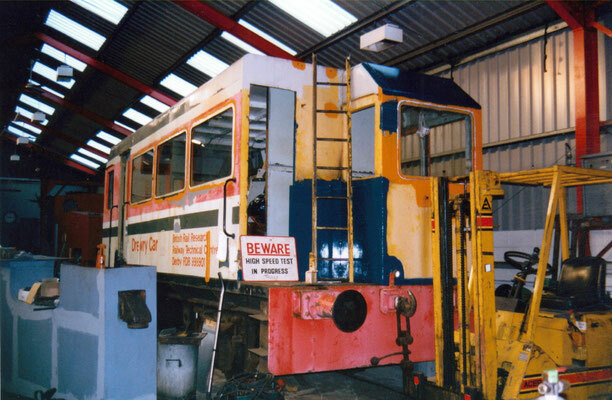 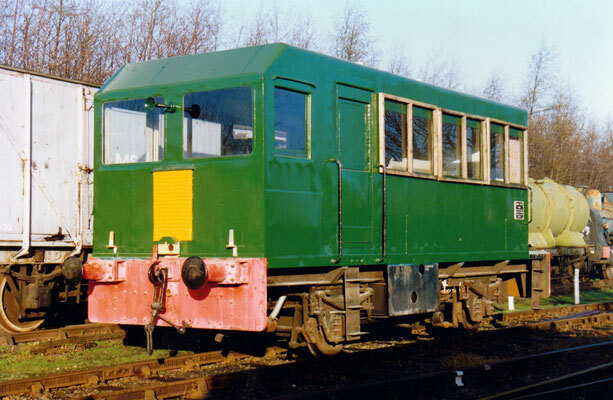 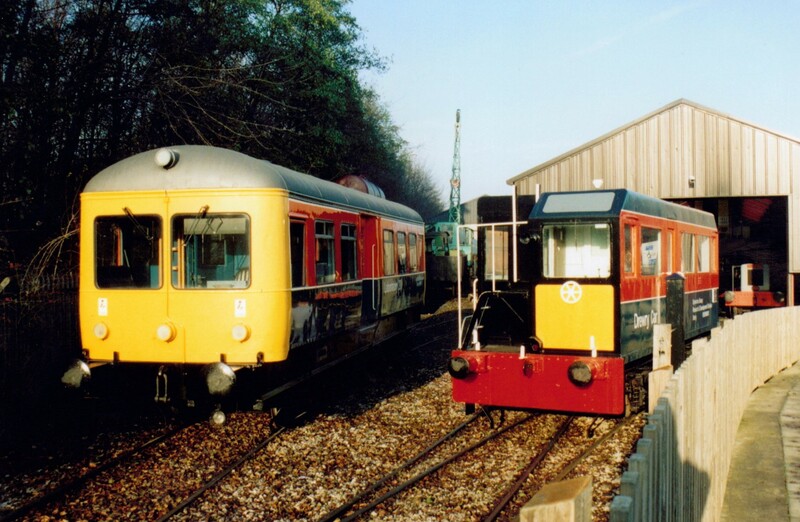 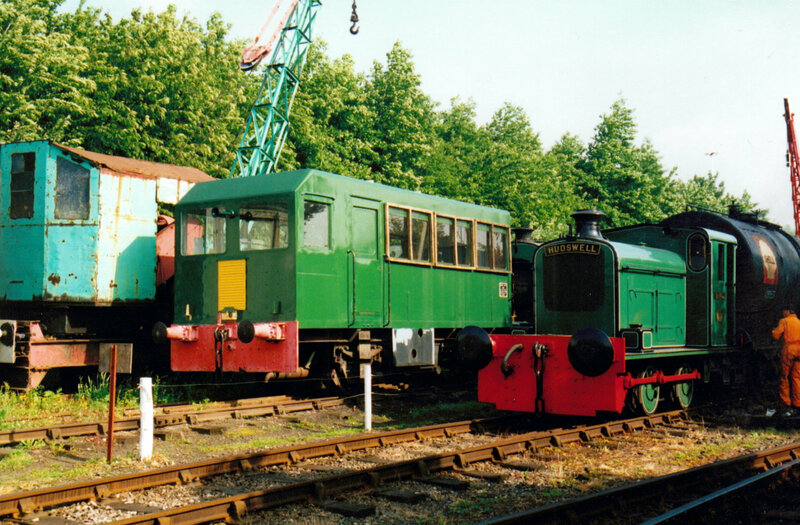 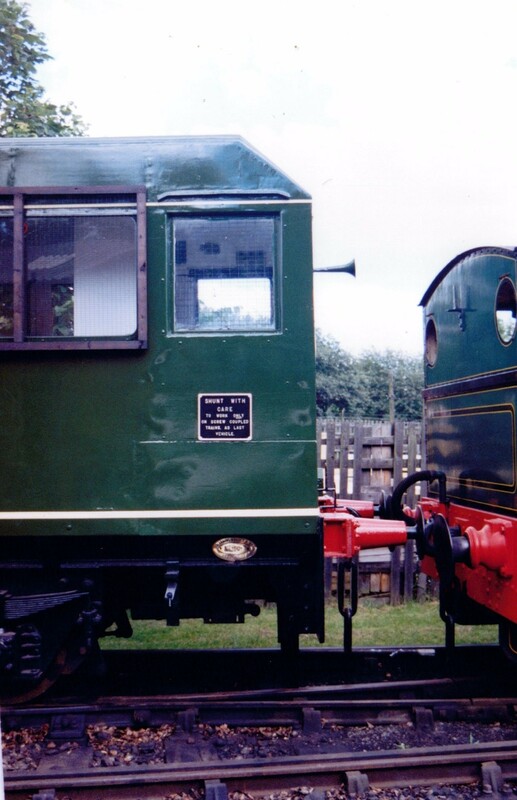 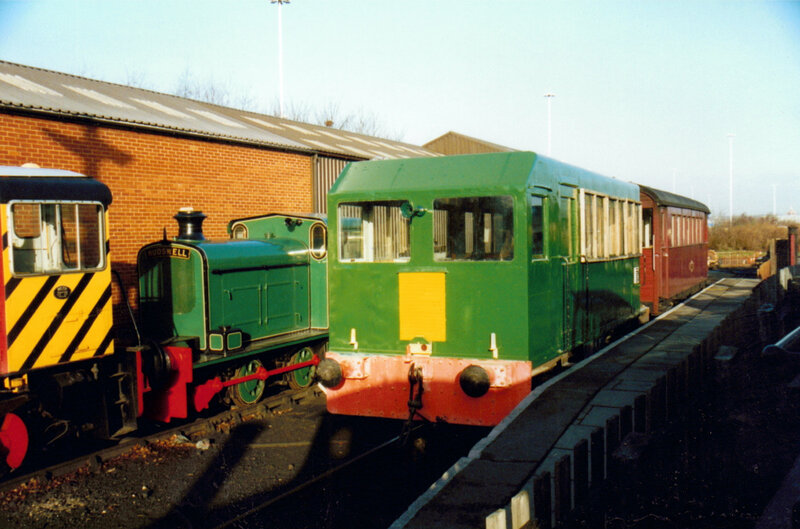 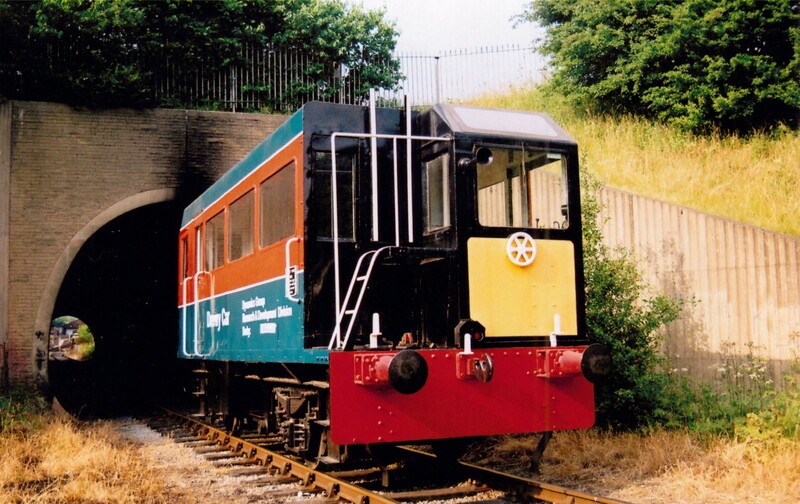 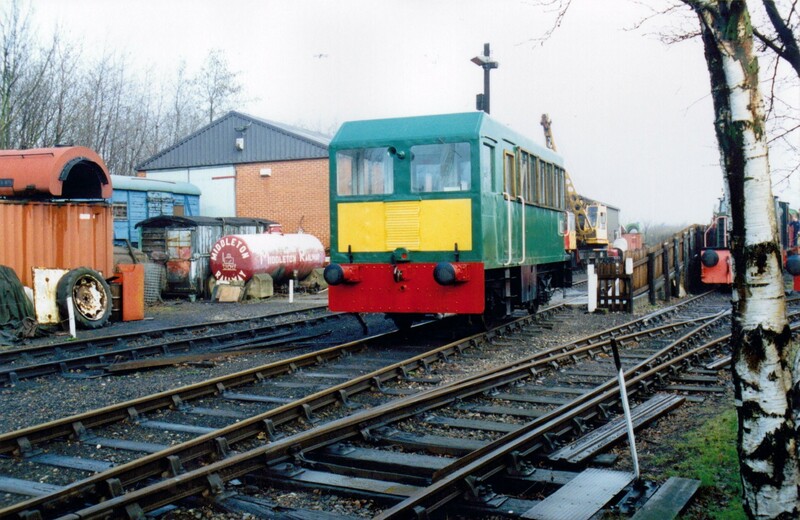 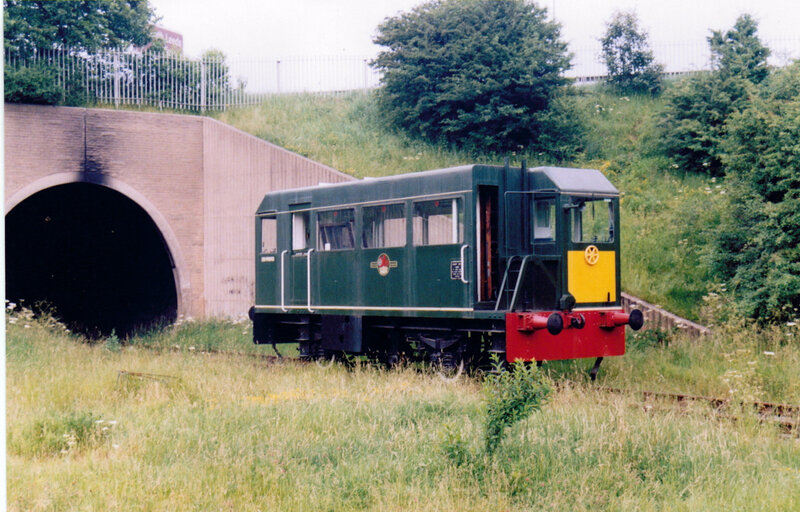 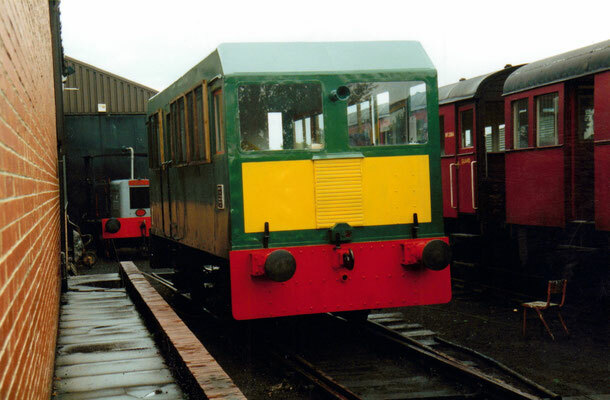 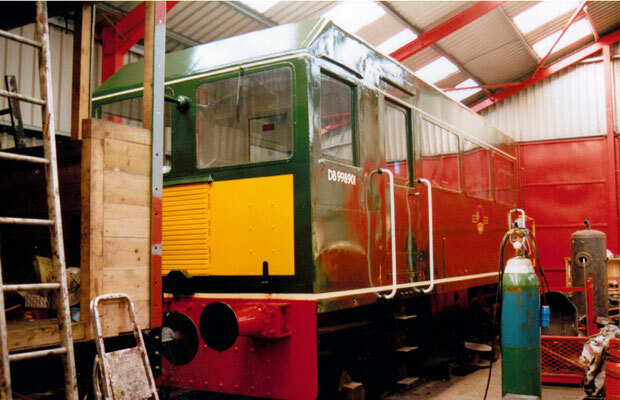 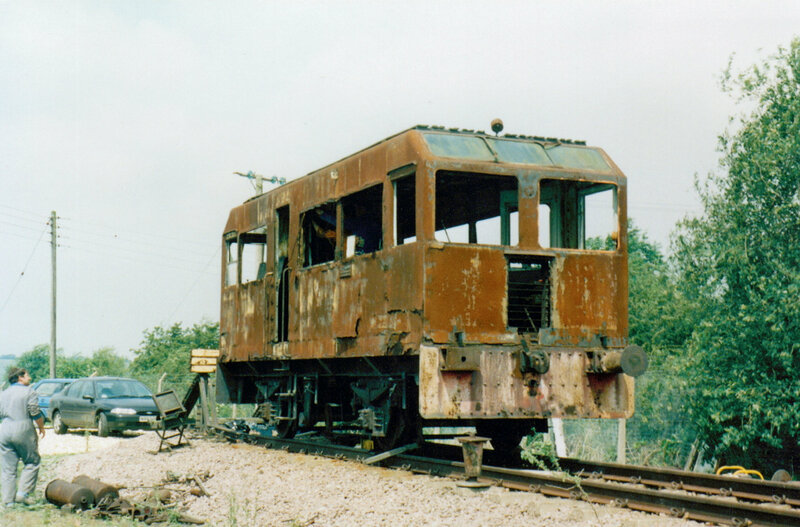 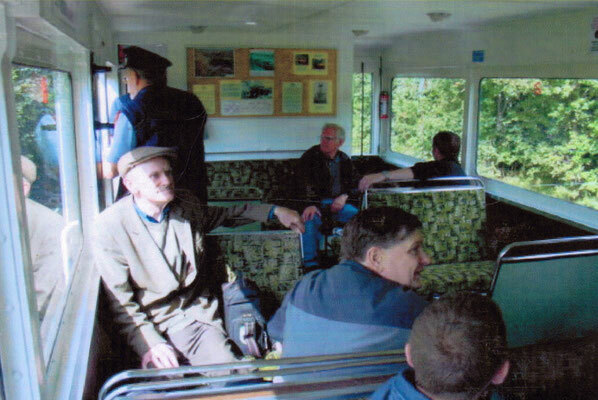 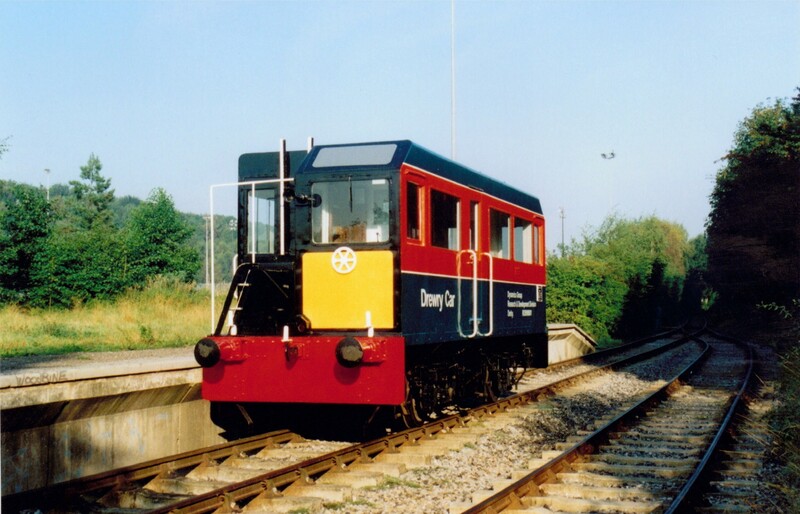 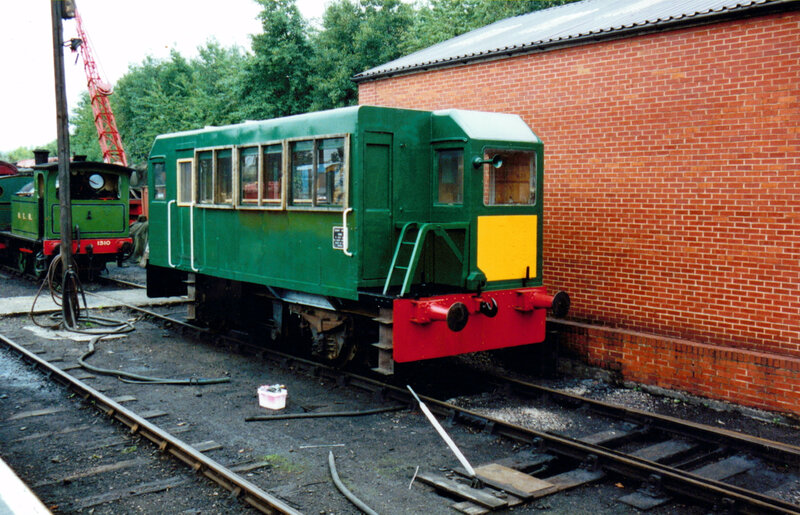 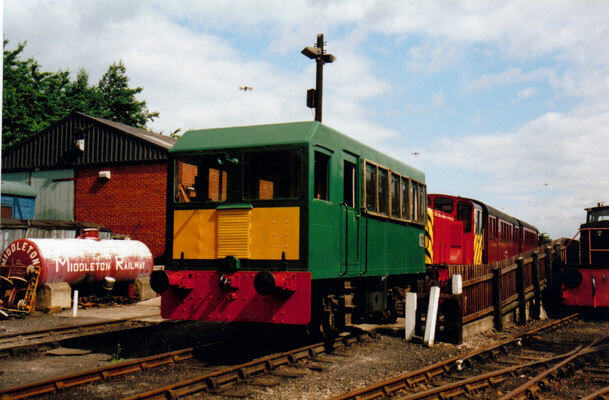 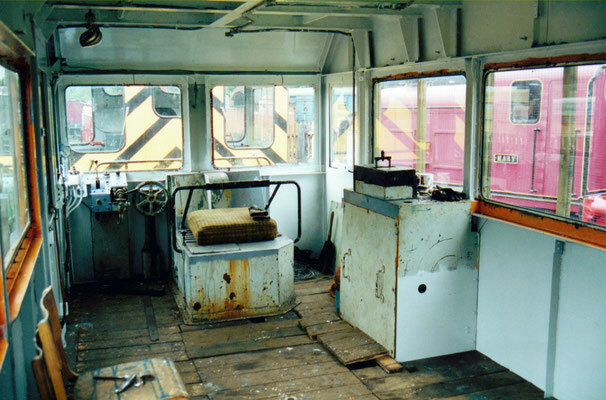 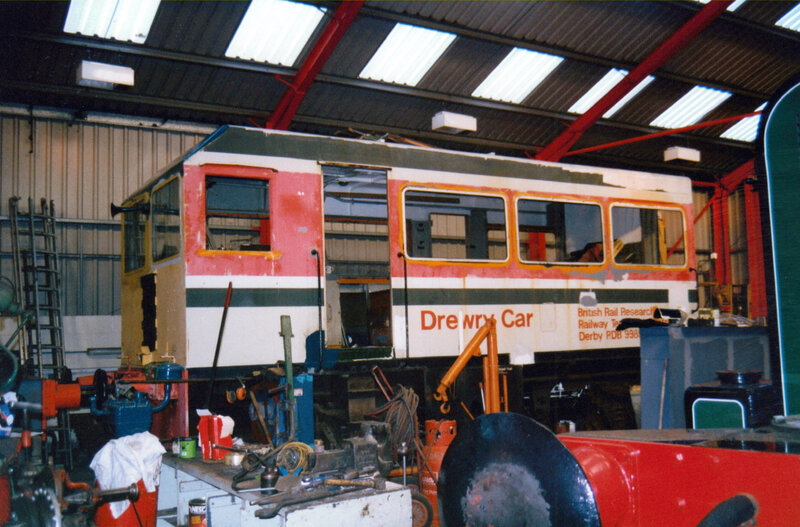 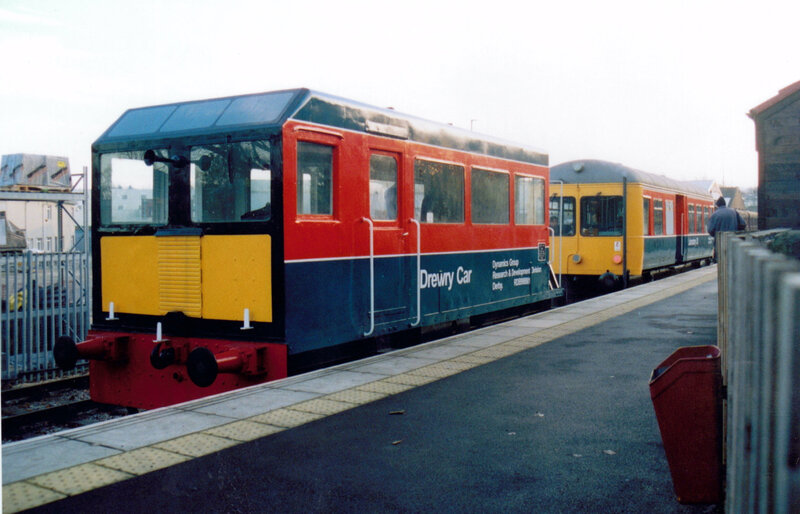 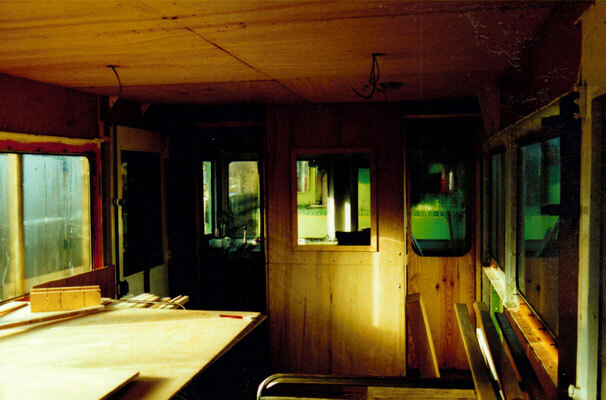 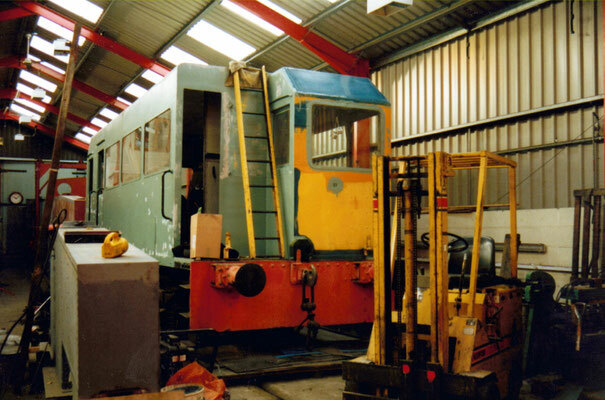 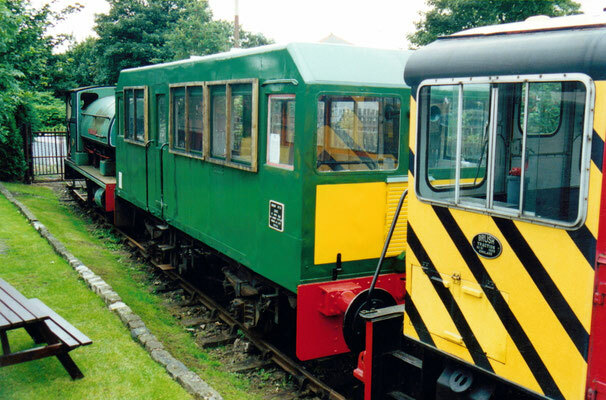 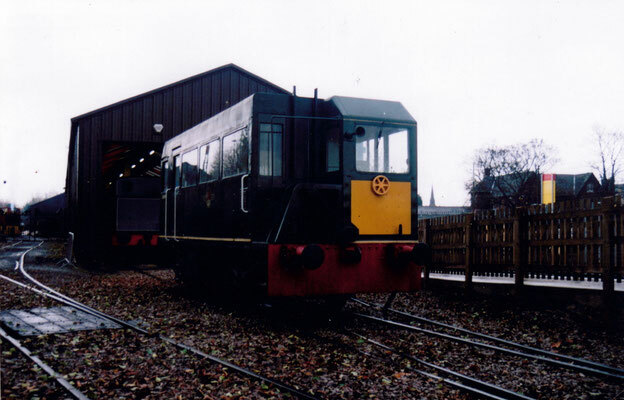 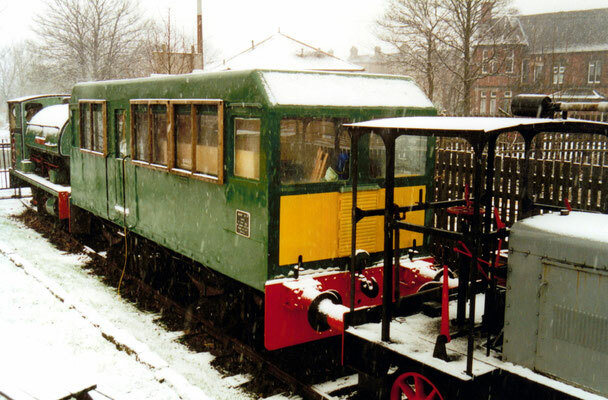 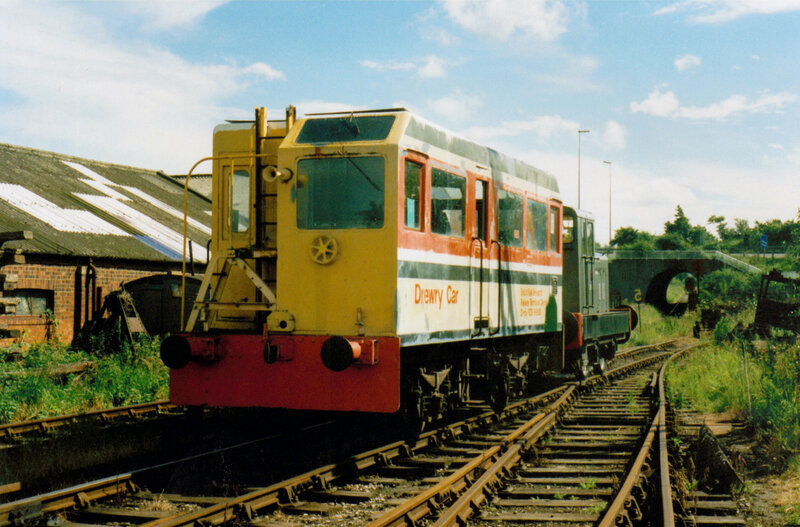 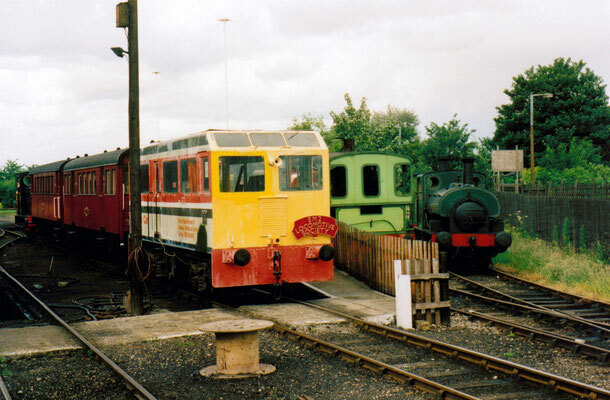 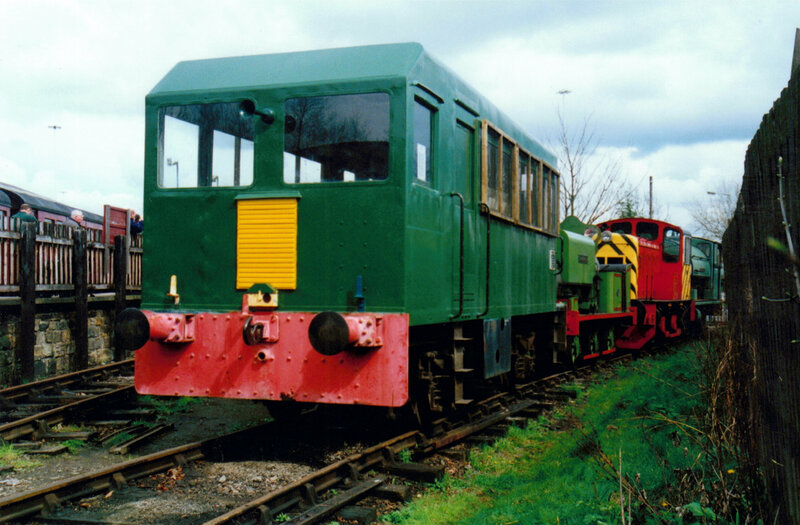 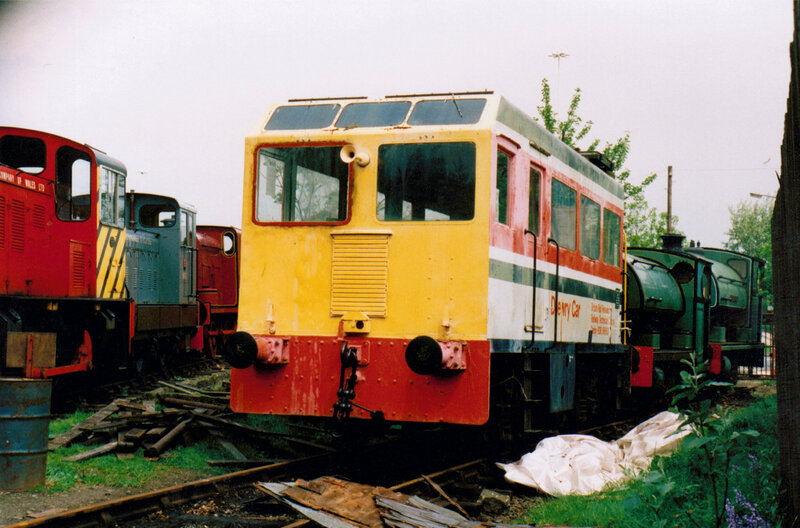 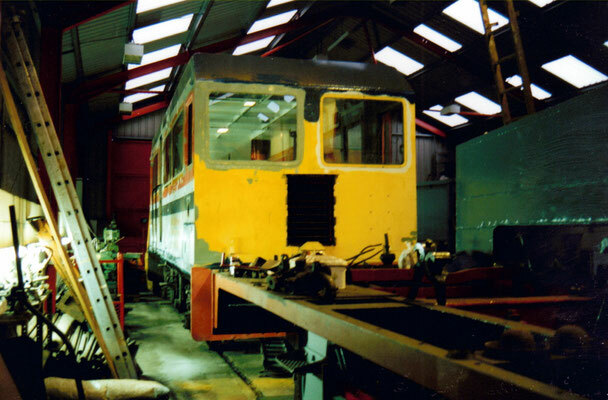 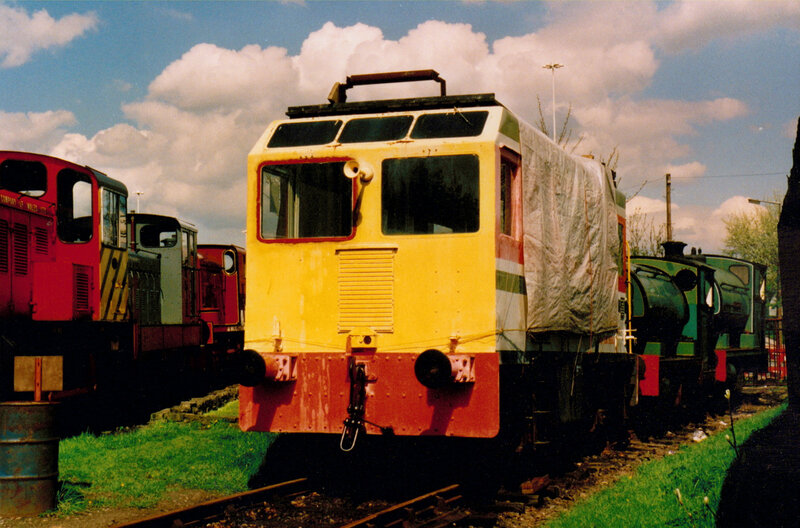 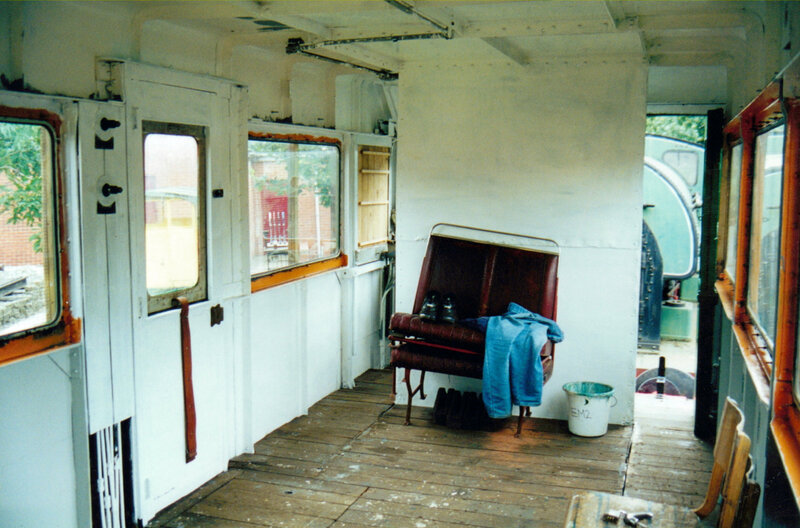 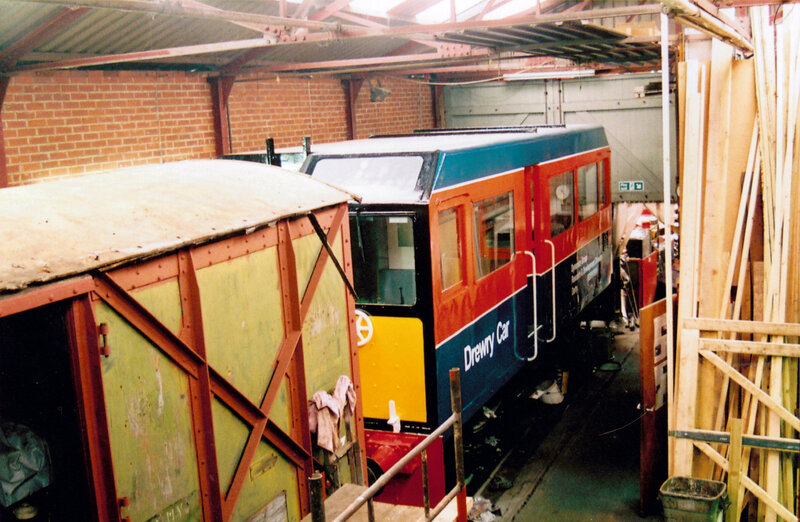 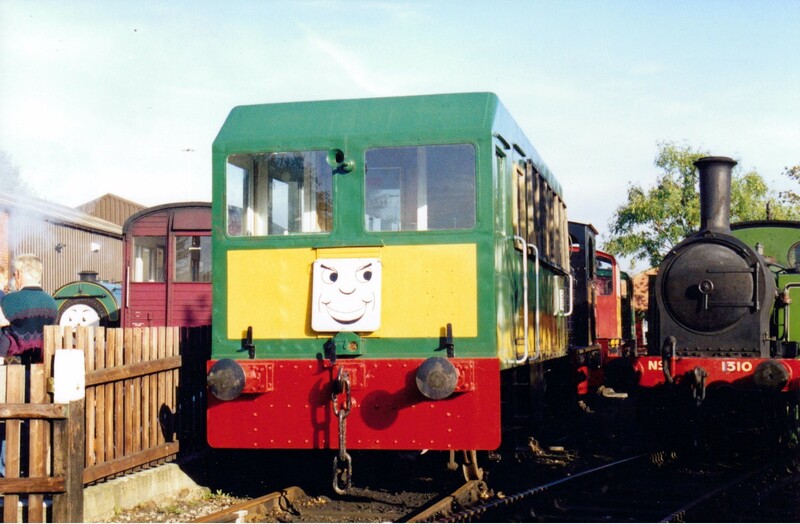 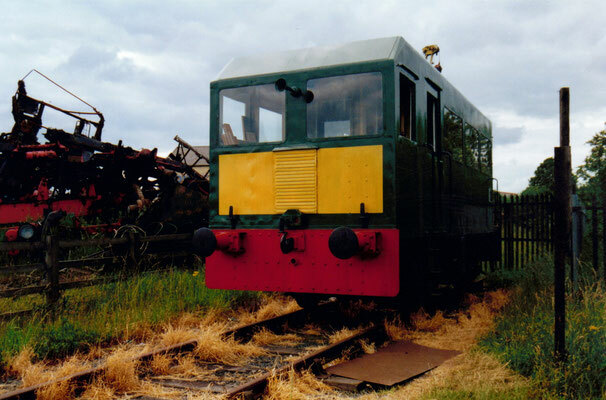 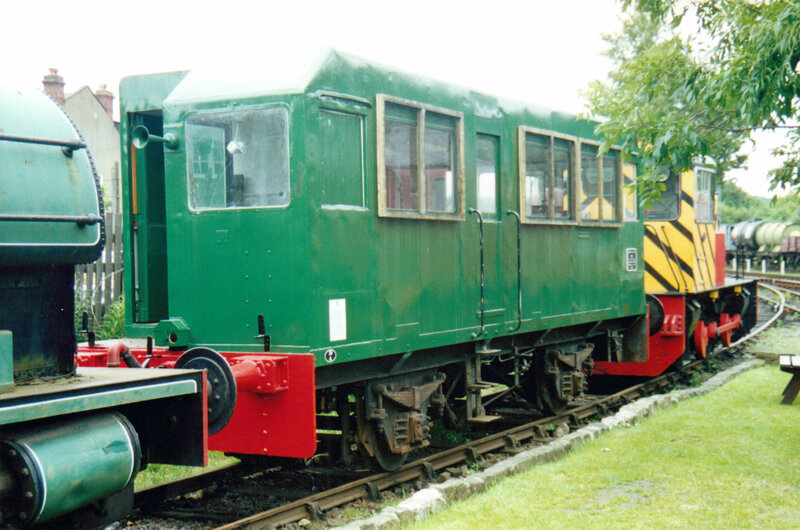 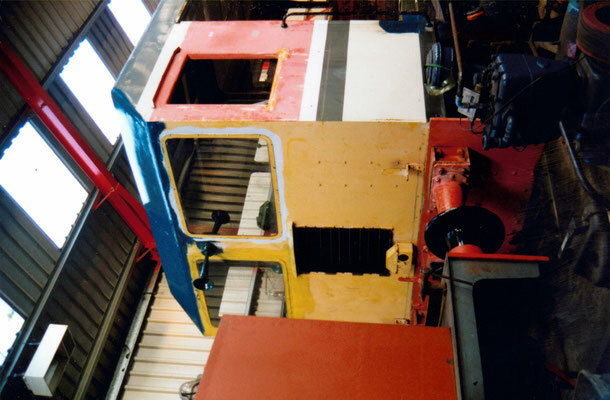 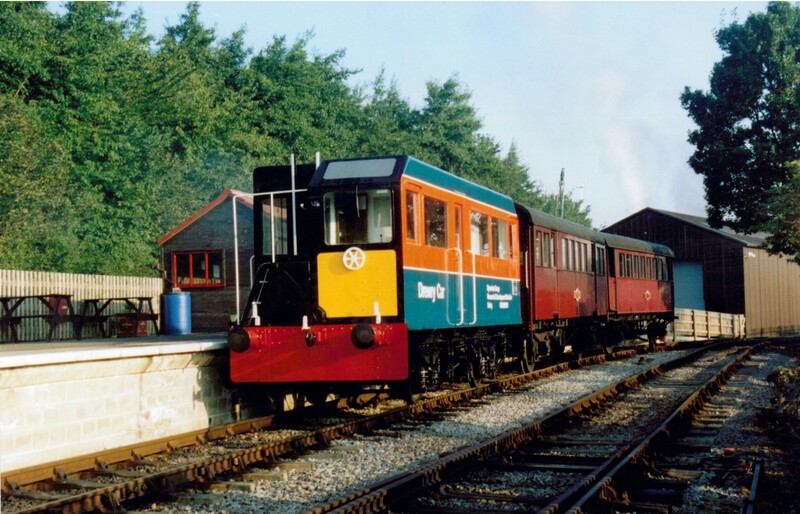 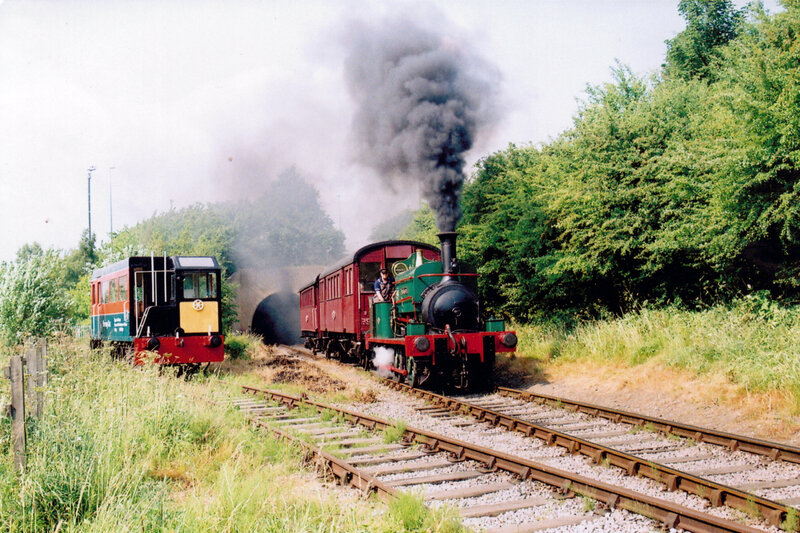 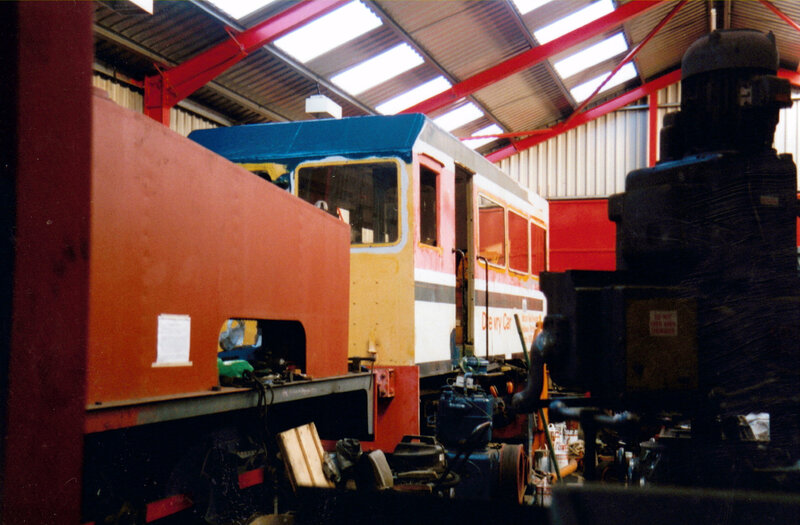 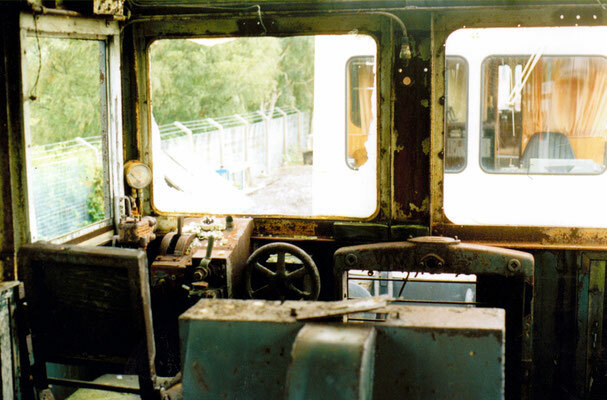 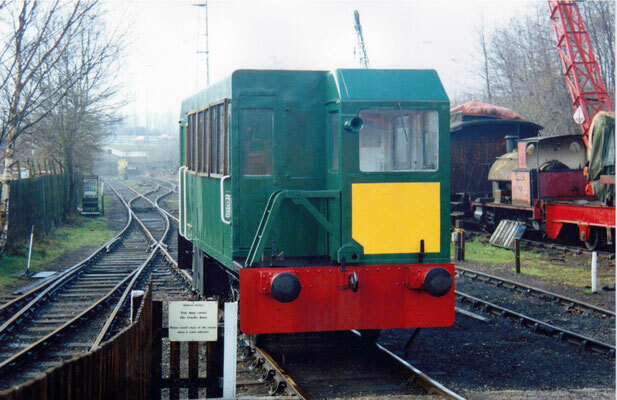 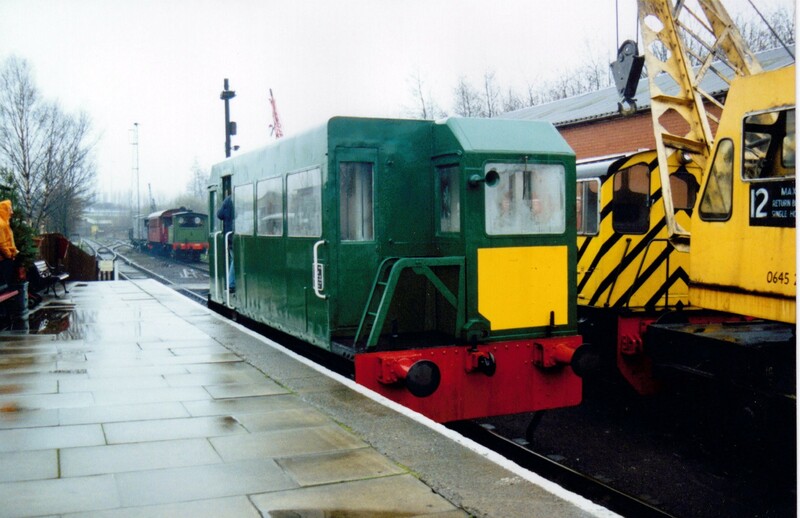 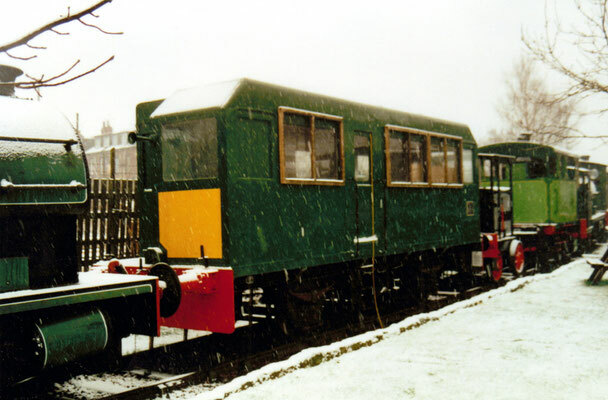 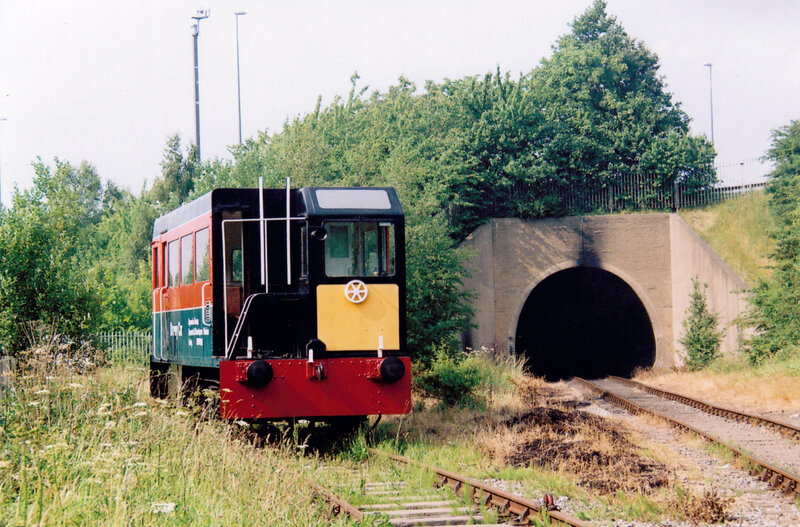 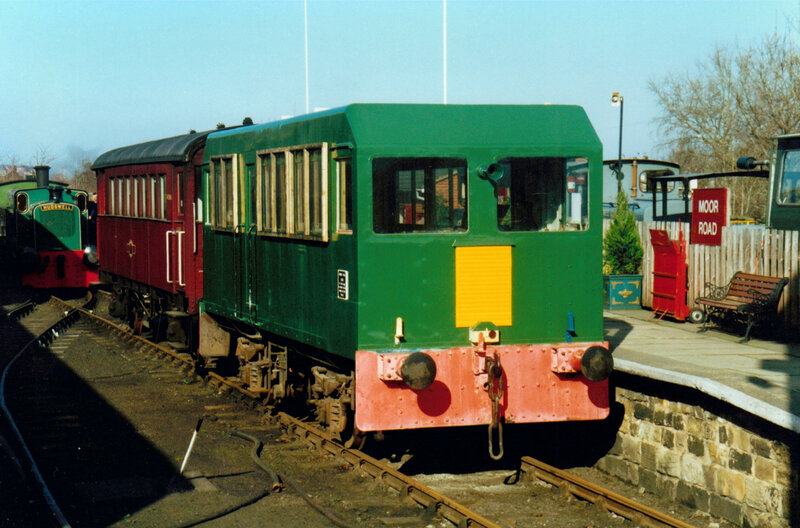 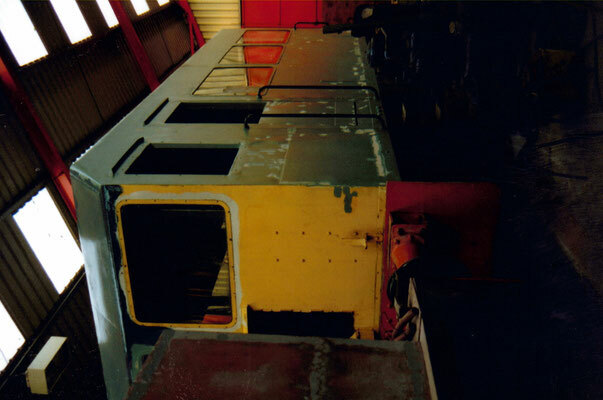 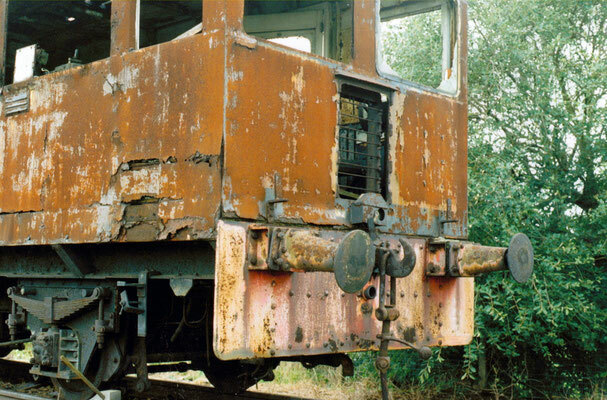 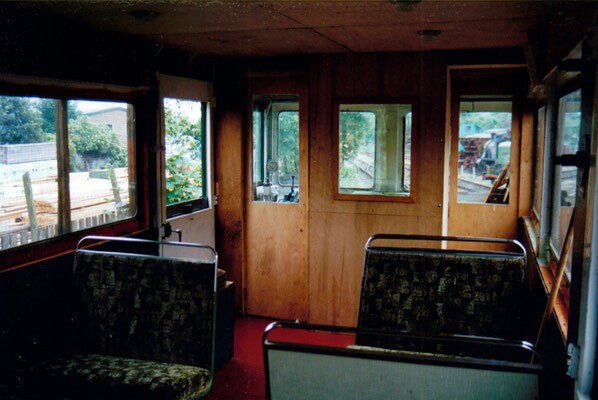 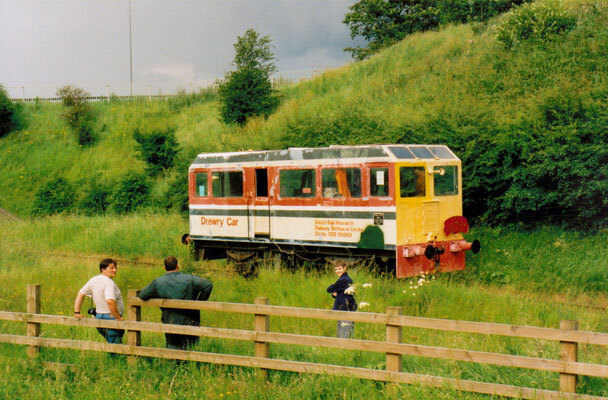 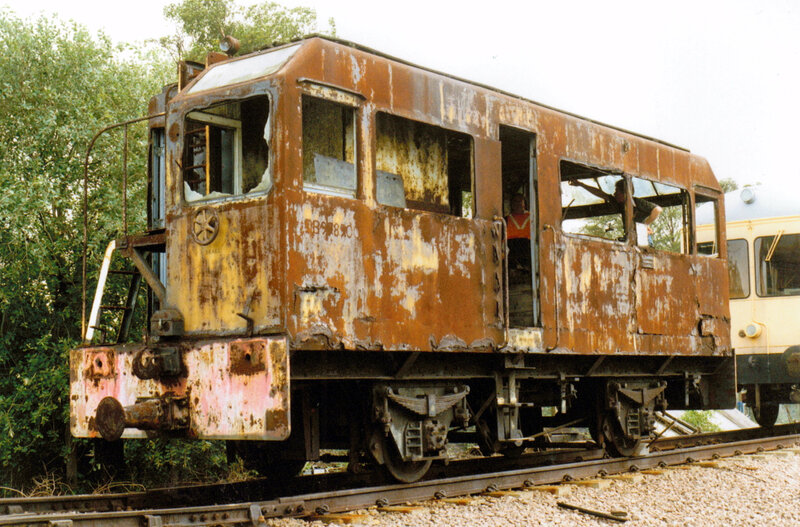 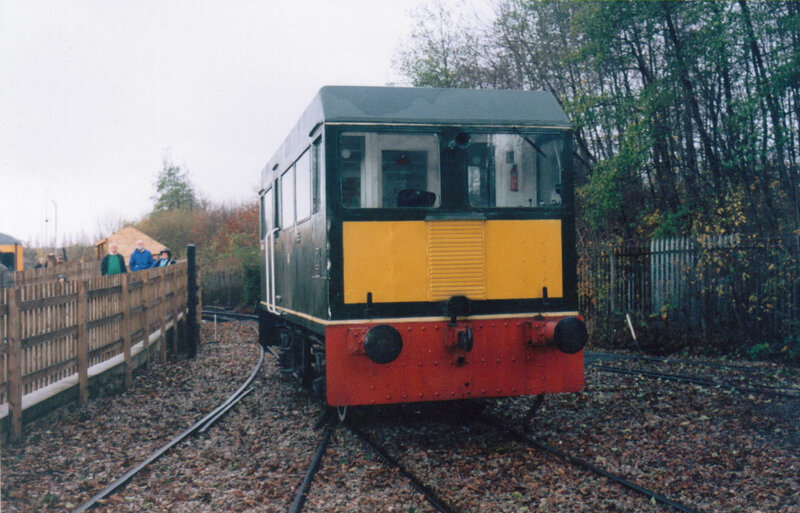 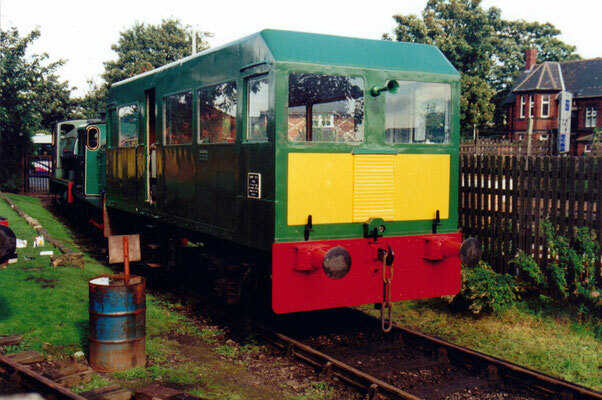 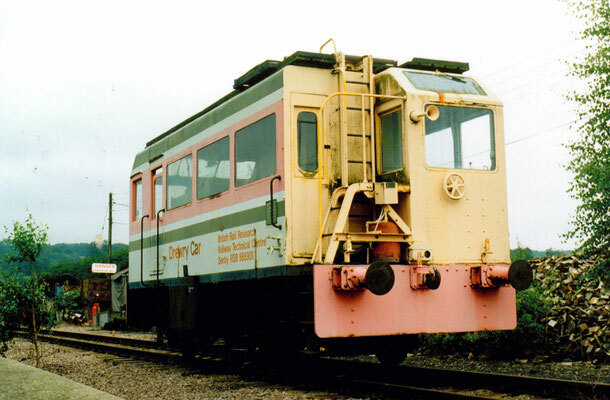 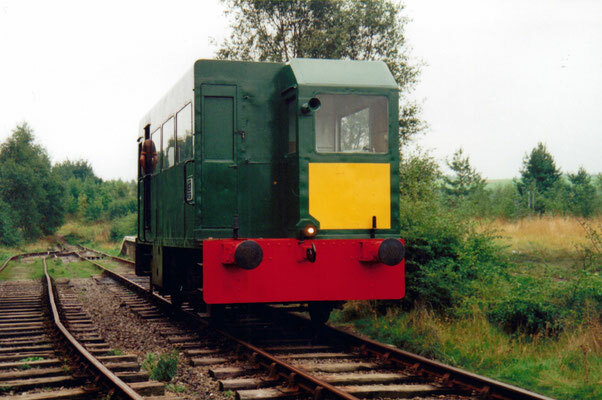 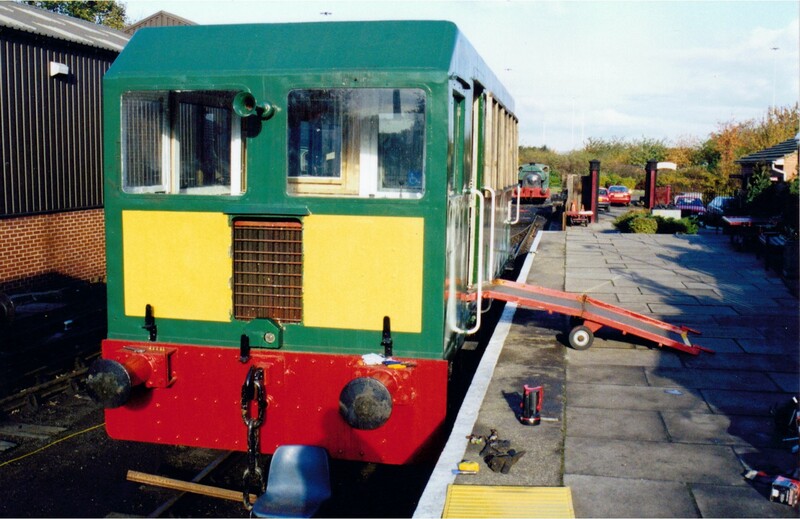 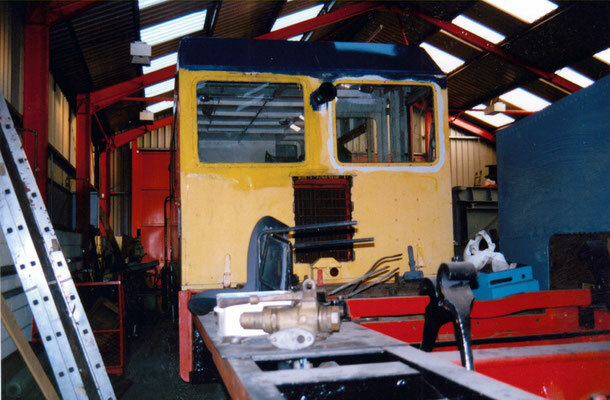 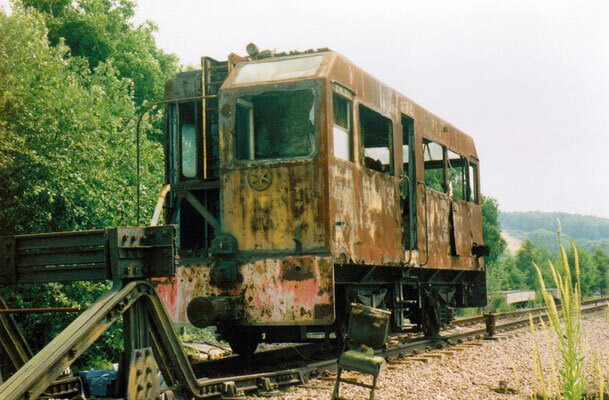 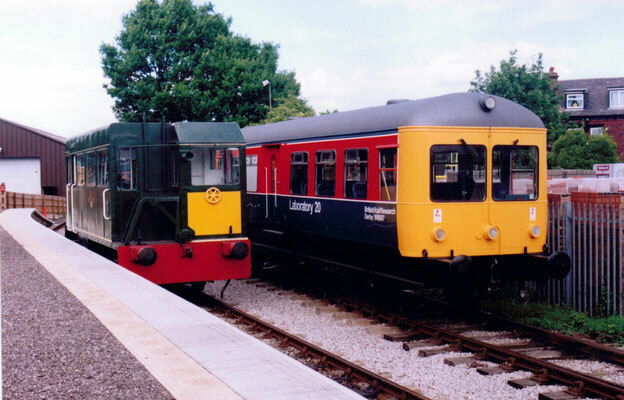 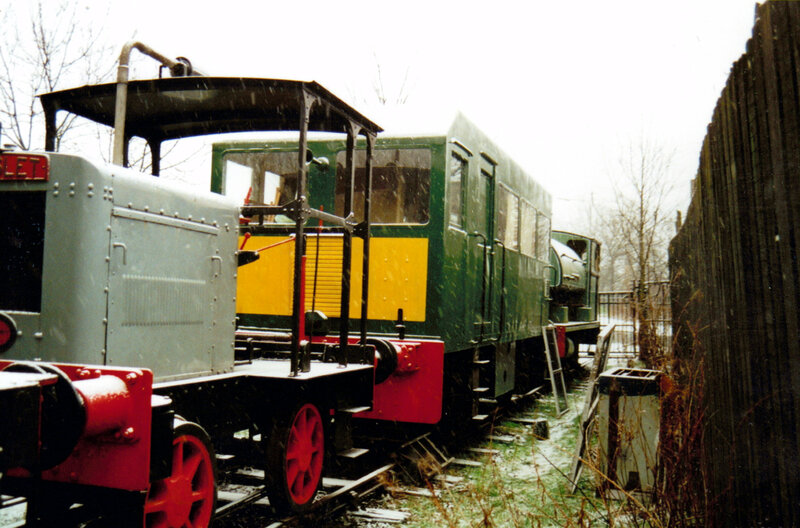 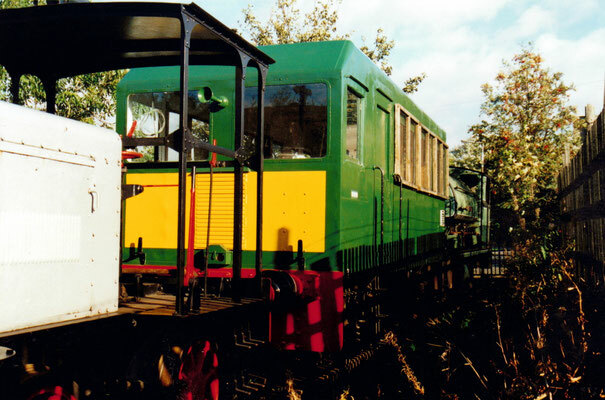 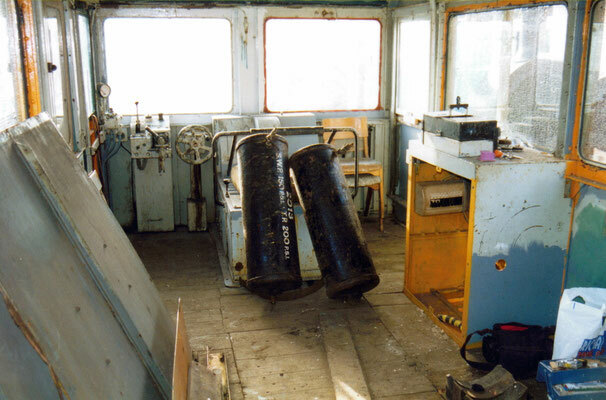 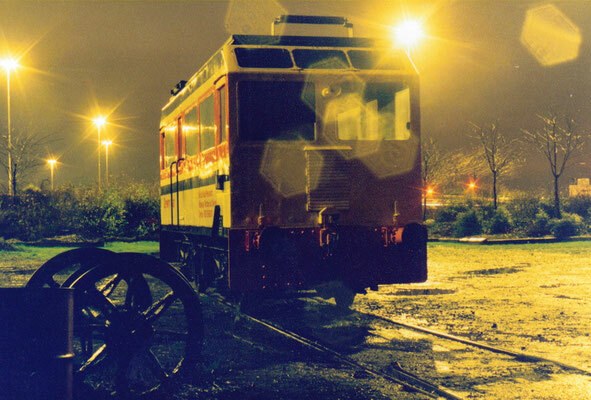 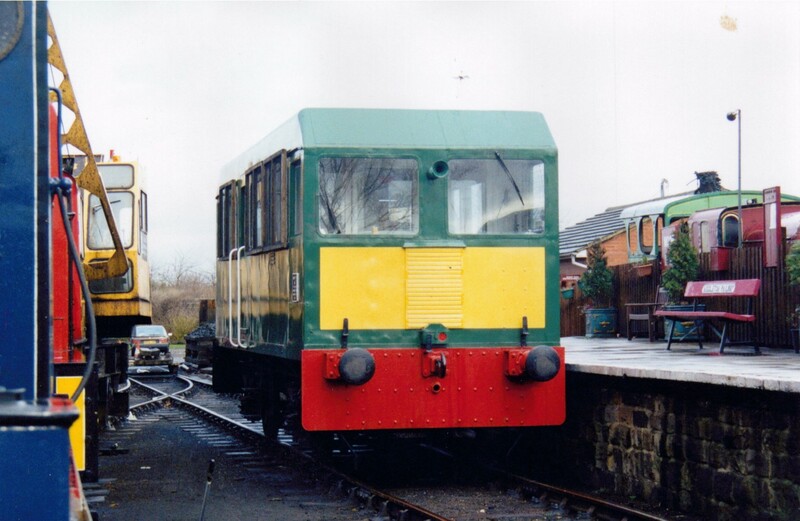 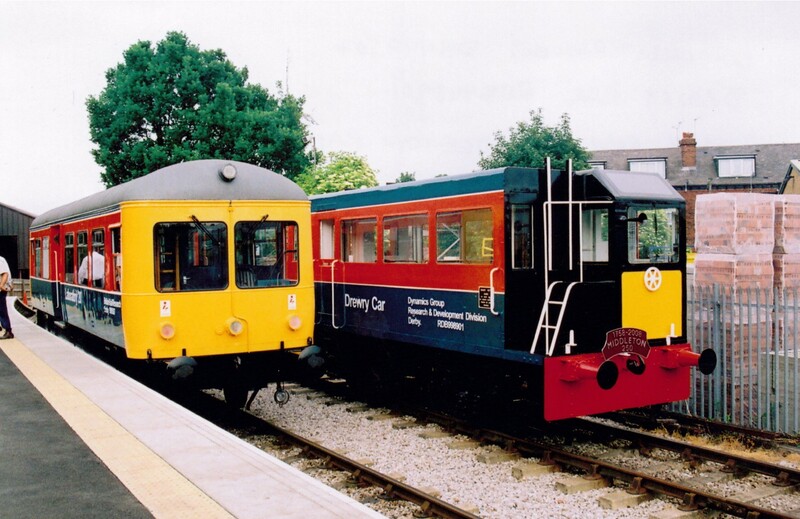 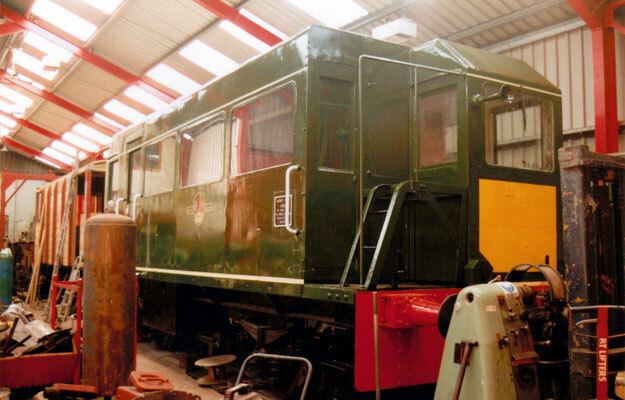 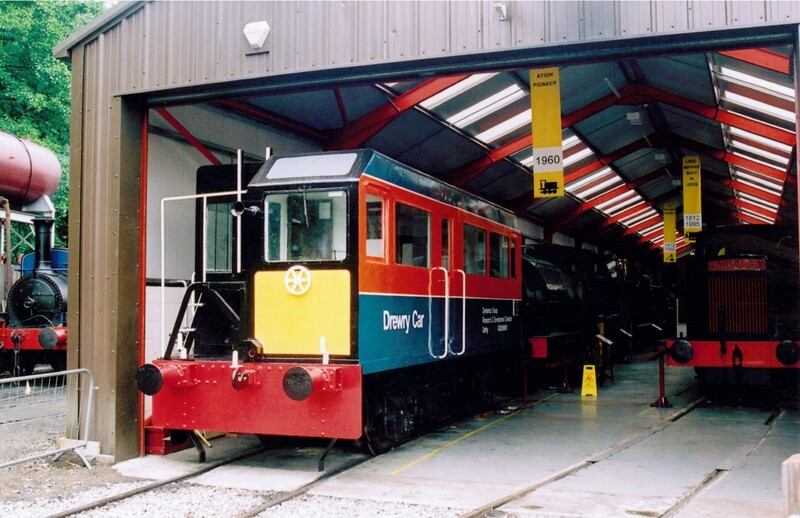 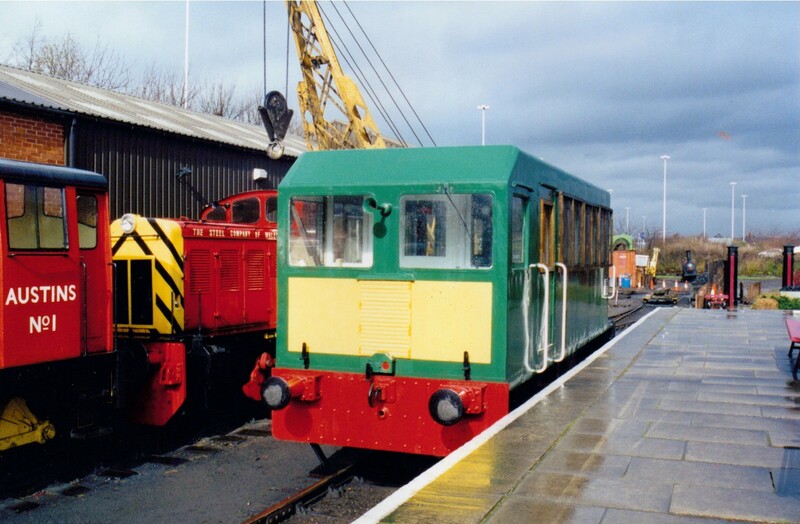 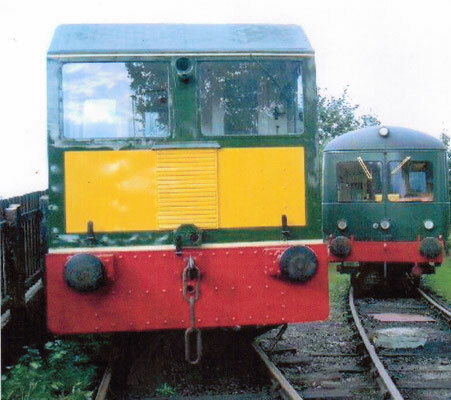 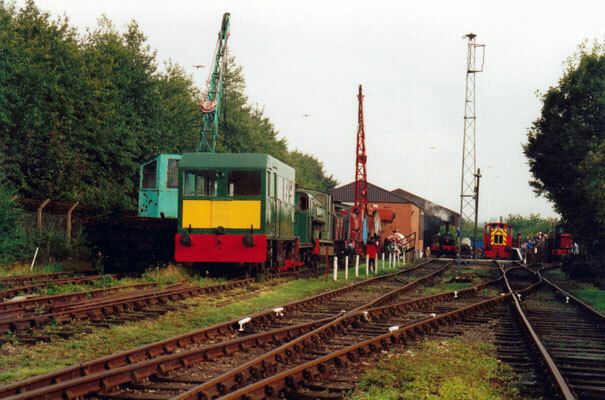 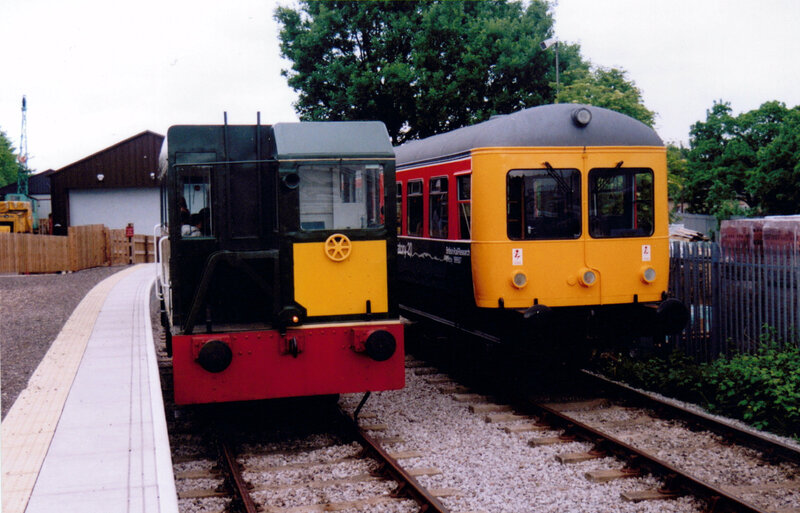 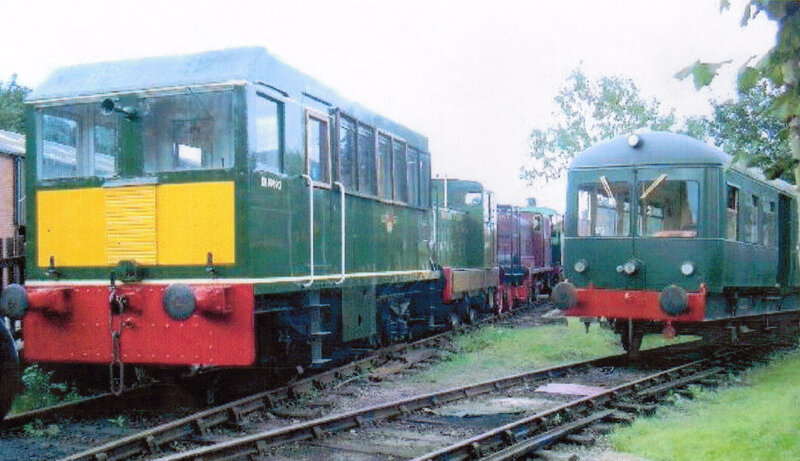 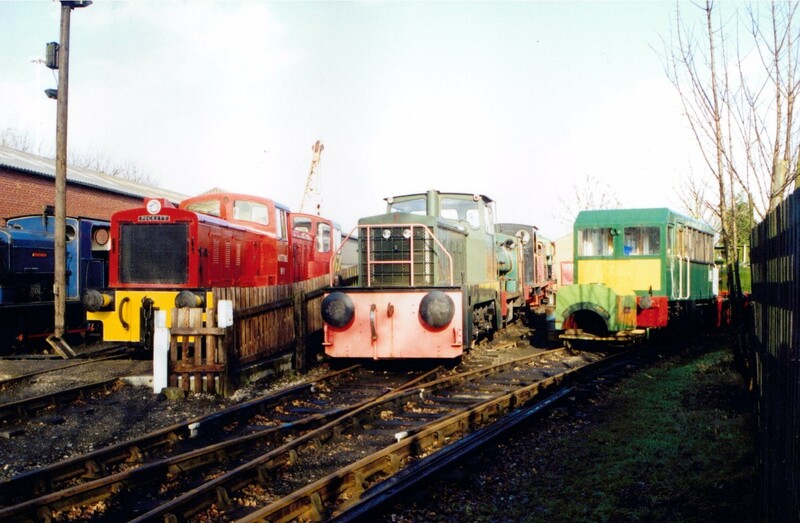 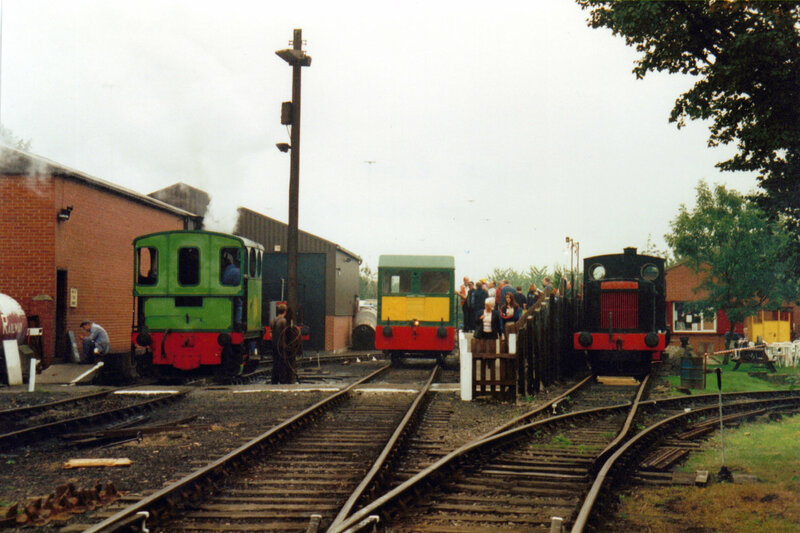 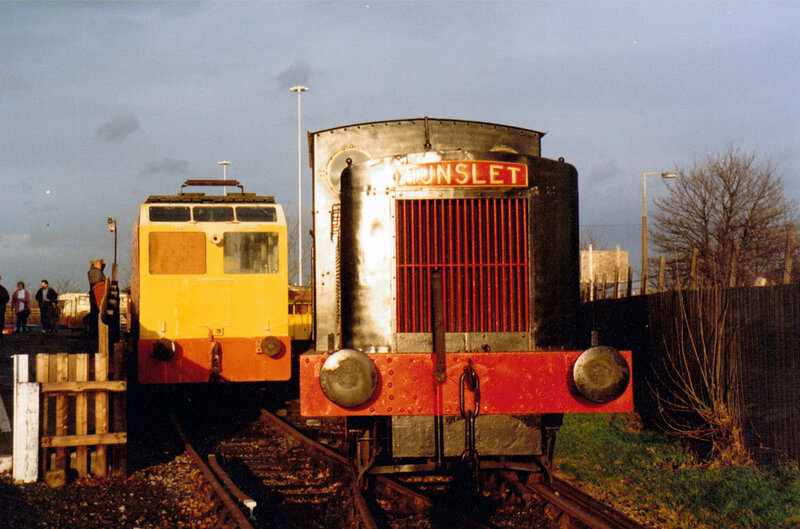 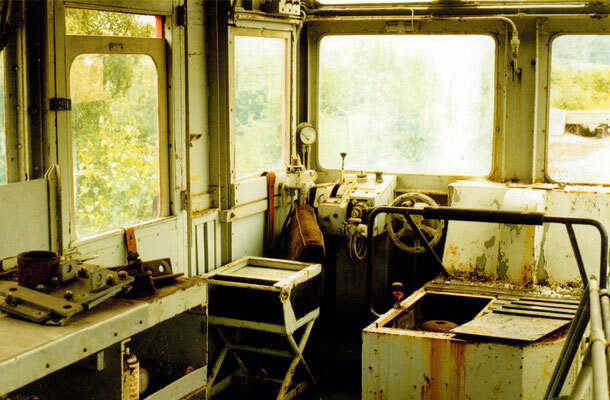 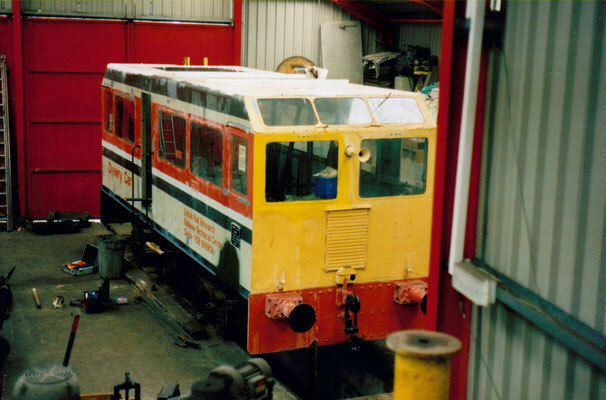 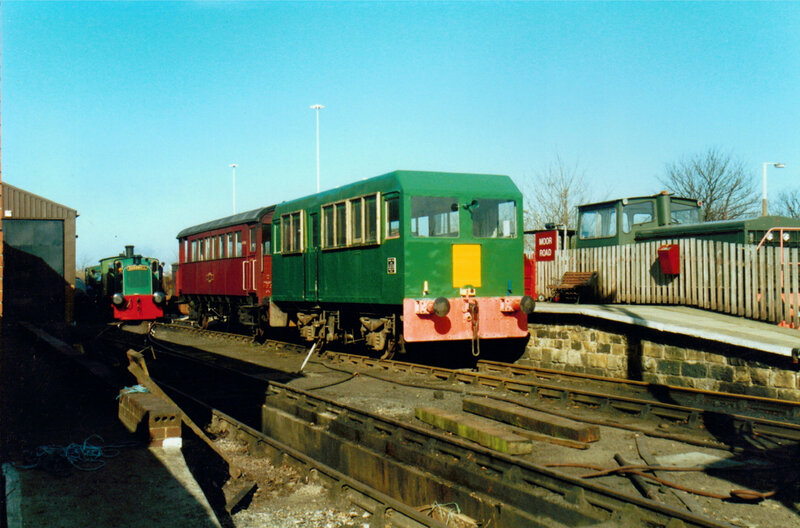 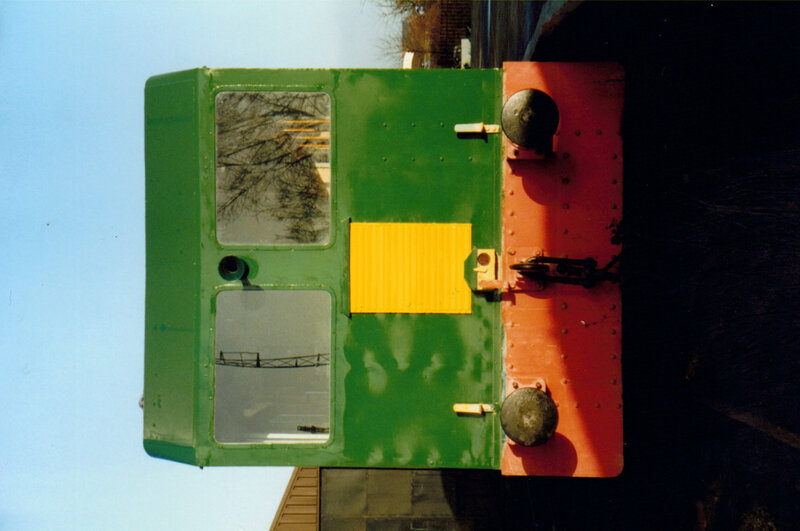 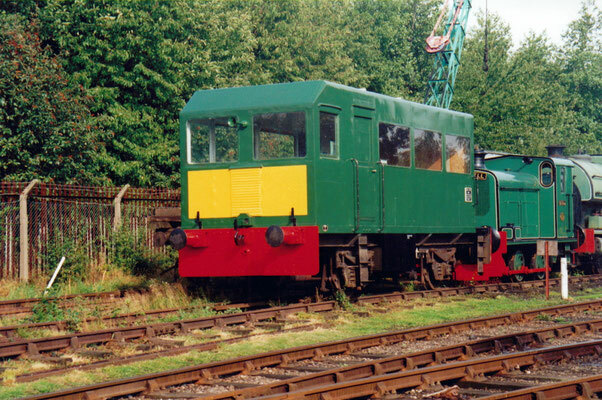 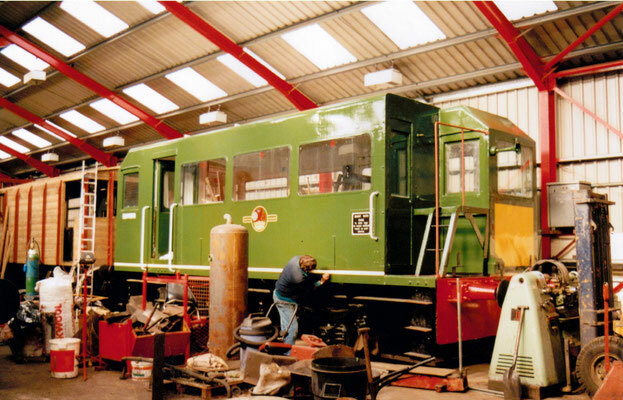 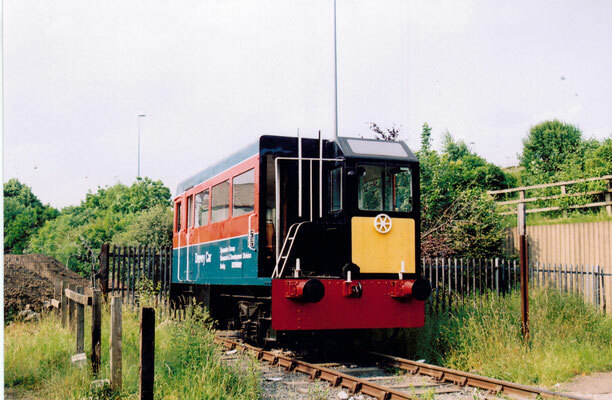 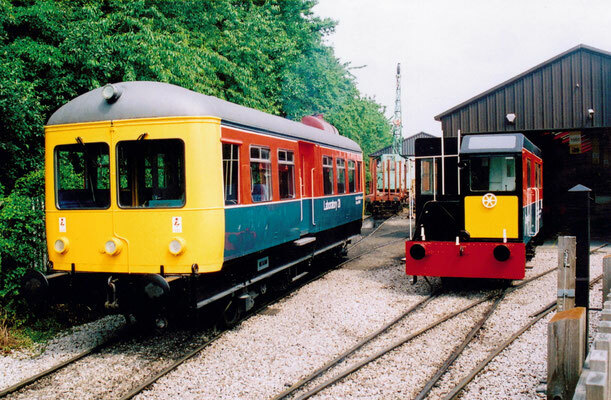 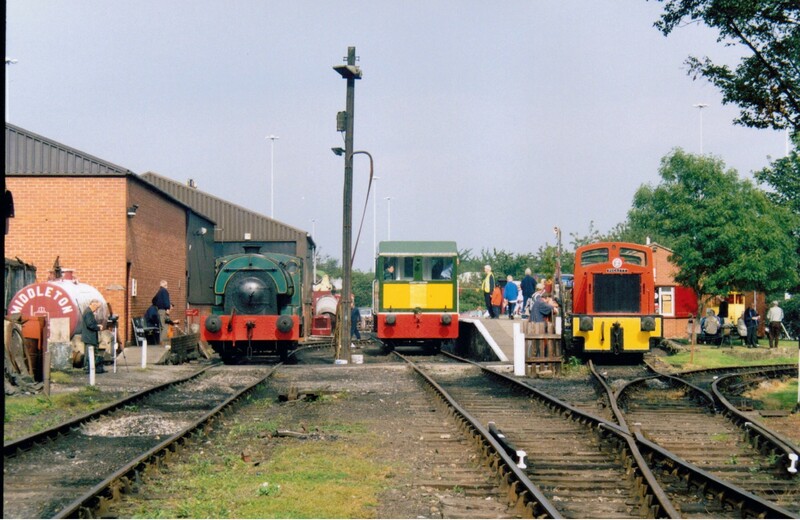 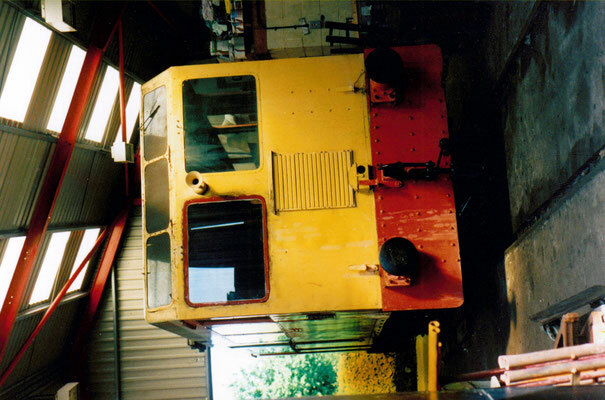 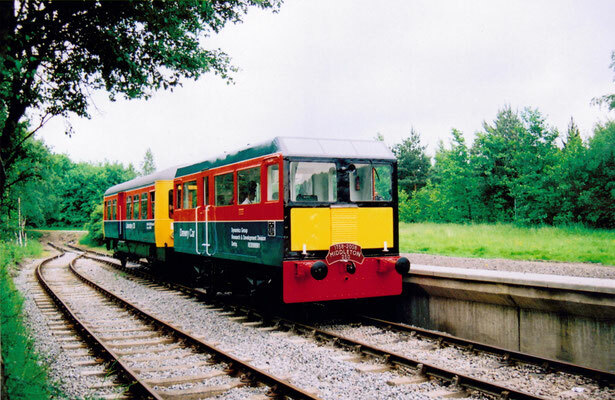 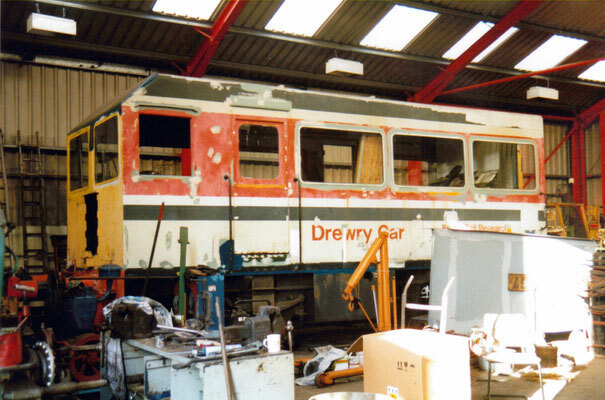 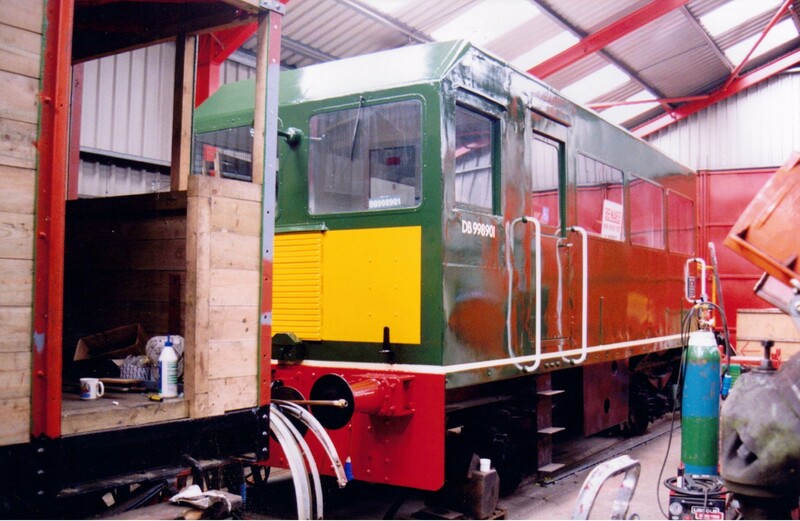 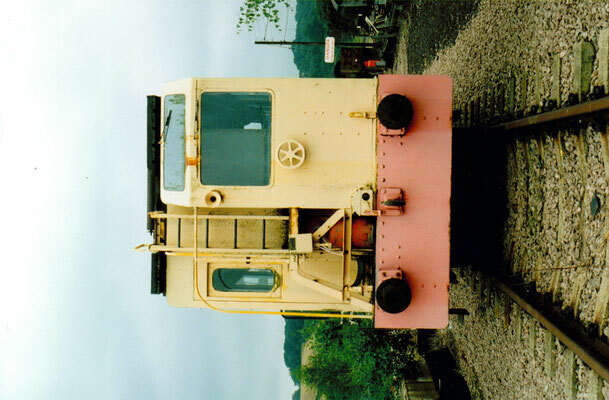 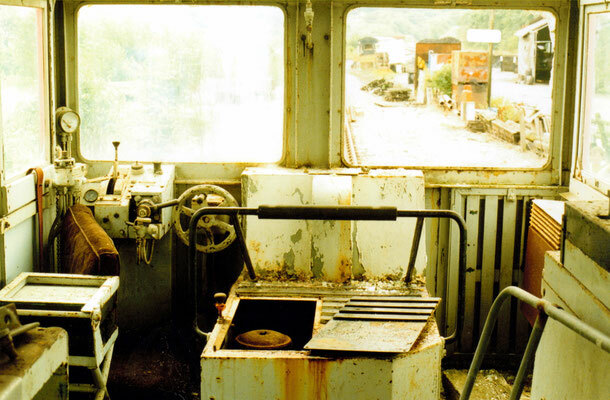 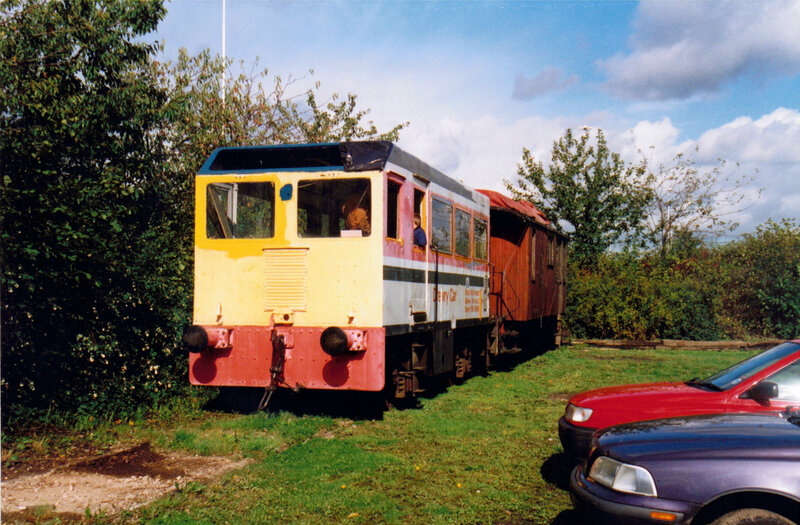 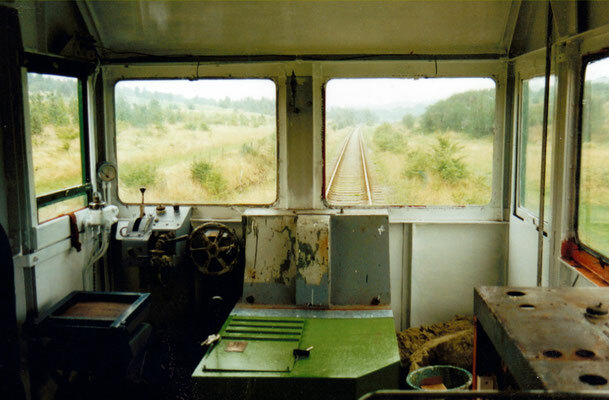 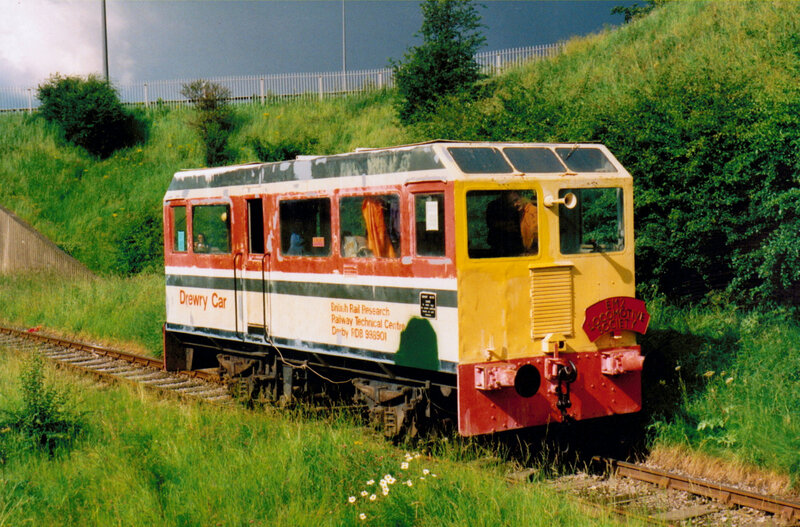 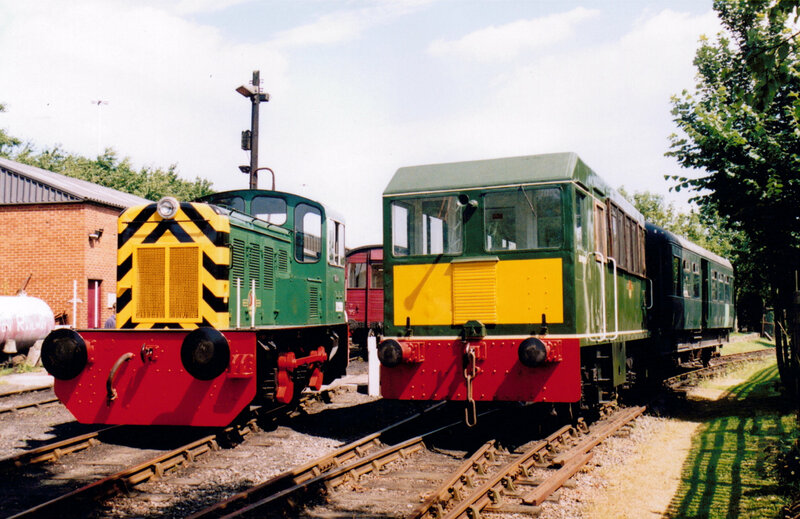 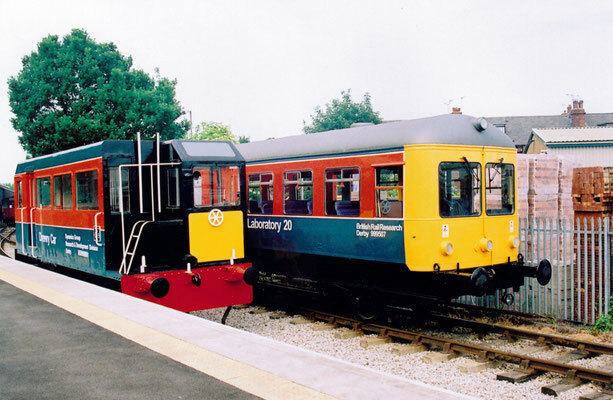 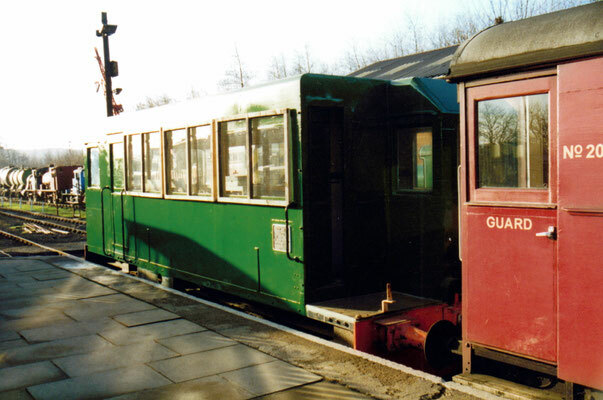 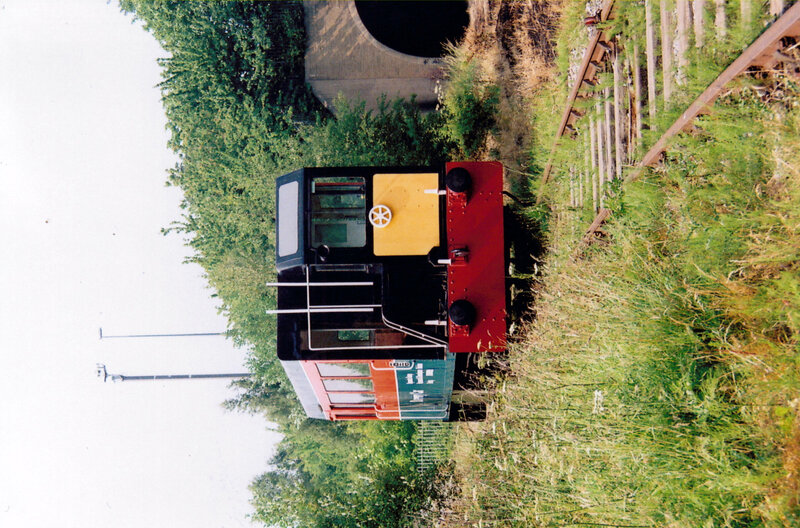 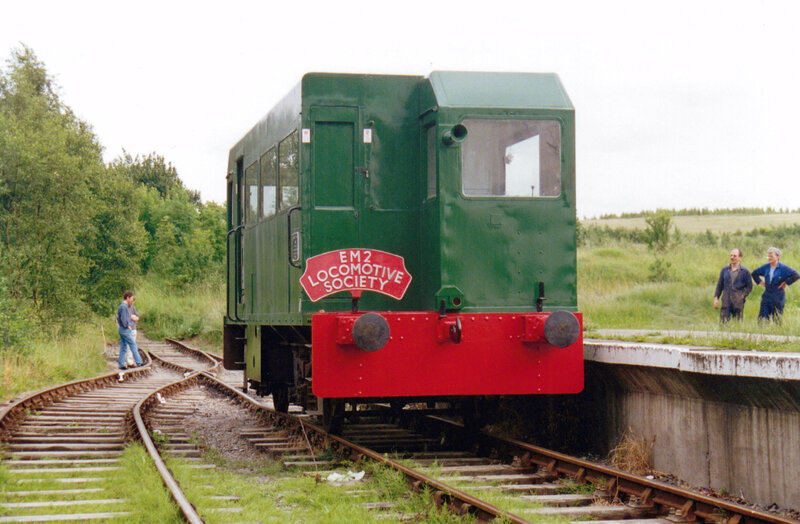 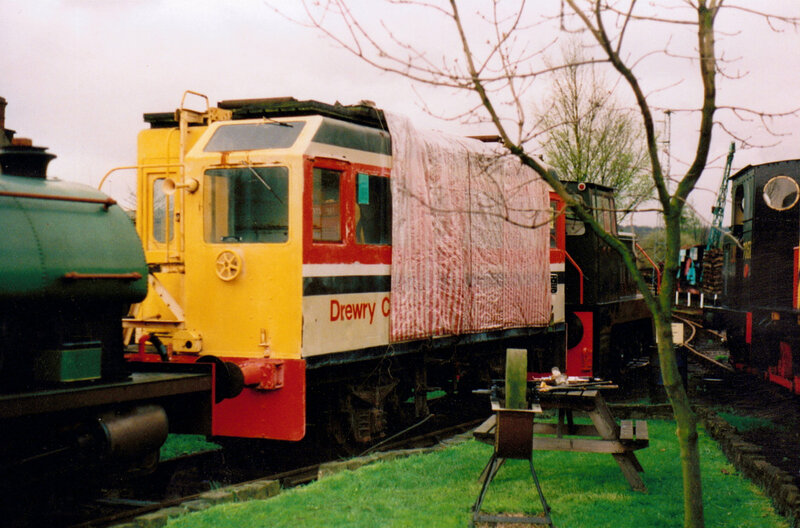 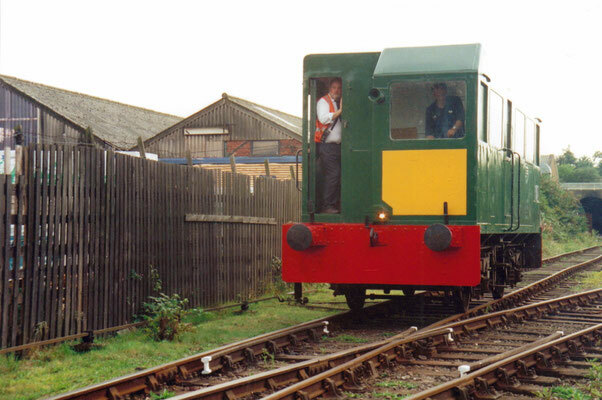 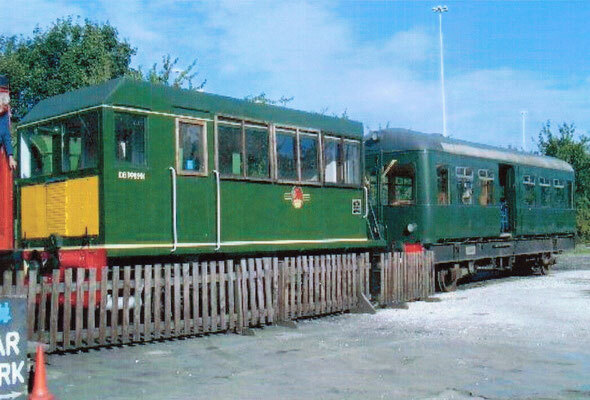 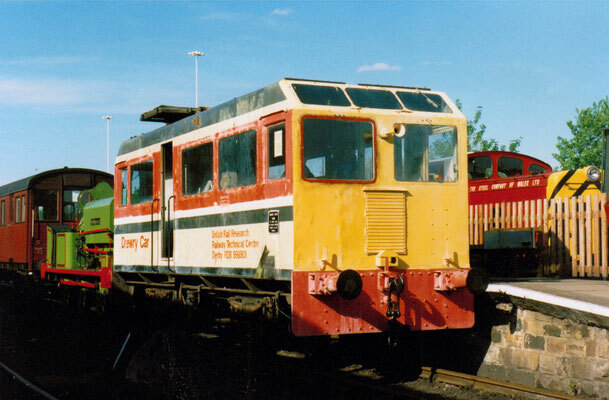 Both vehicles were purchased from Old Dalby by the EM2 Locomotive Society in November 1997, with the same intention as the Technical Centre staff had back in 1976 - make one good vehicle out of the two and scrap the remains. 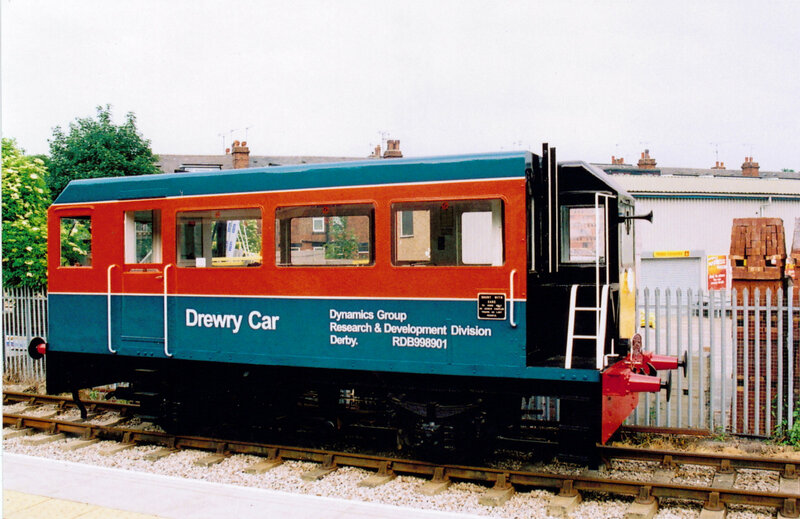 The vehicle is diesel powered and has a maximum speed of 23.1mph! 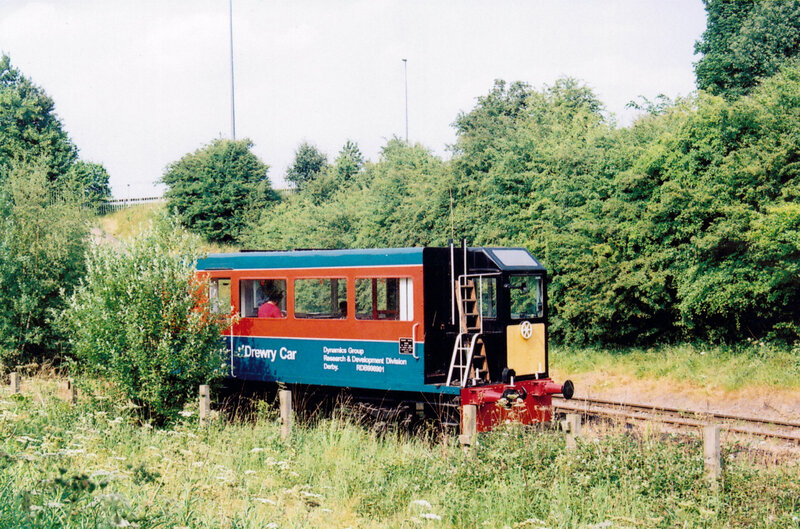 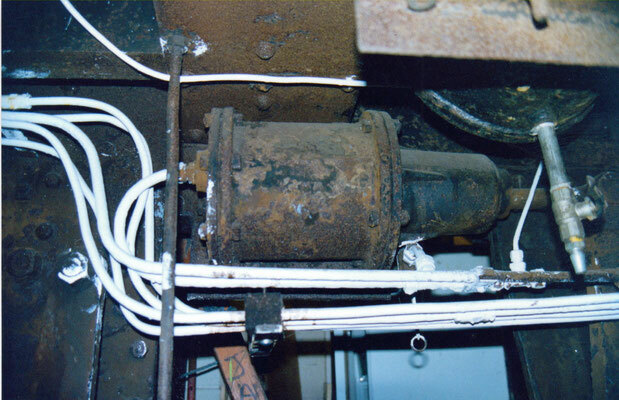 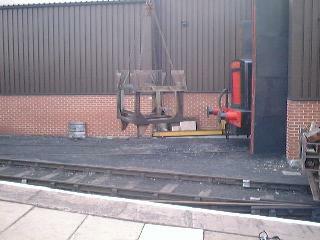 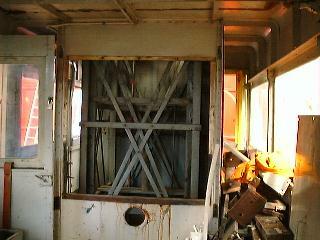 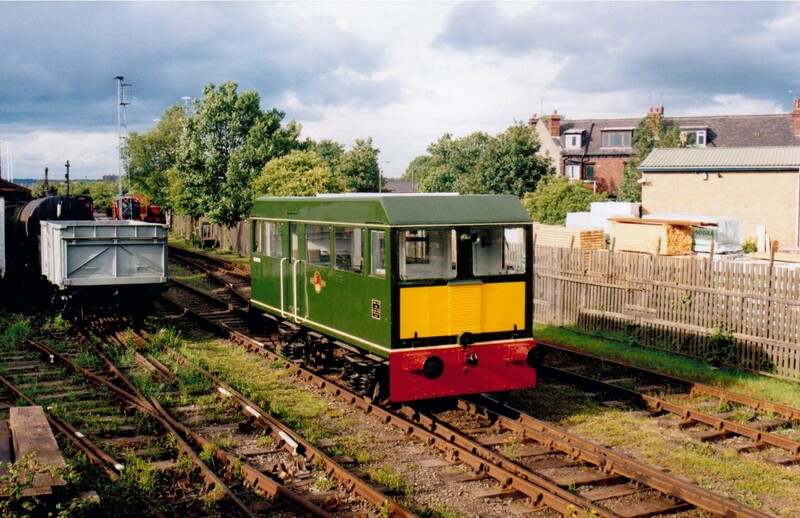 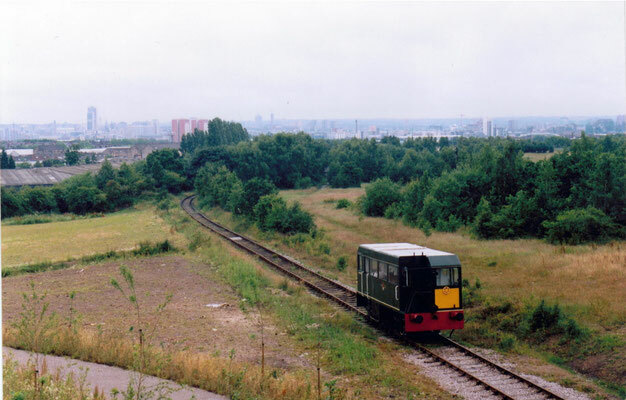 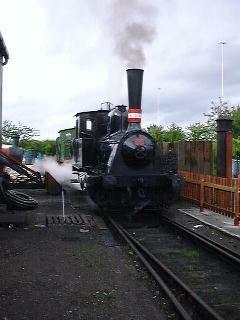 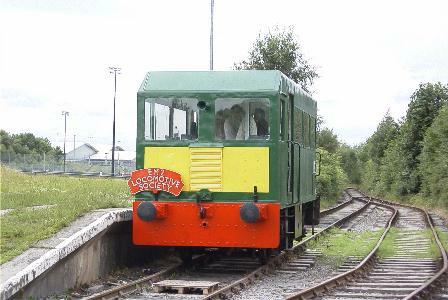 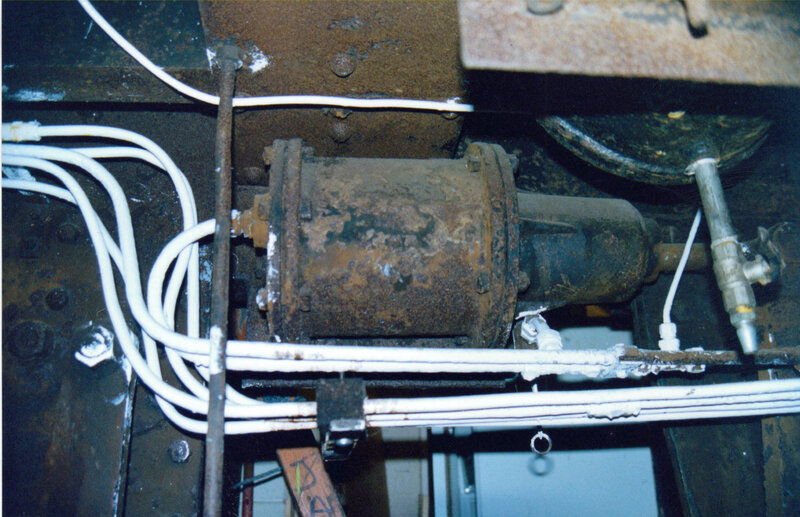 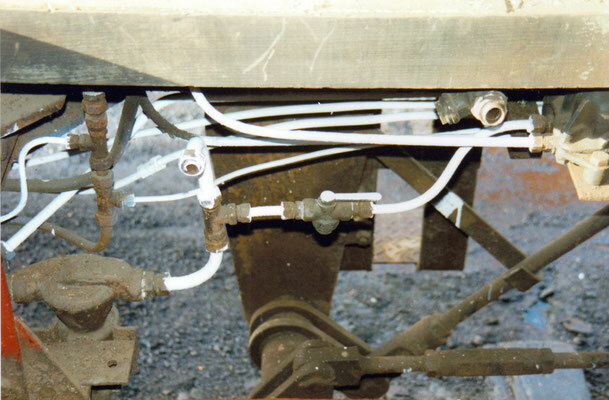 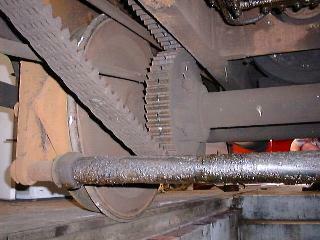 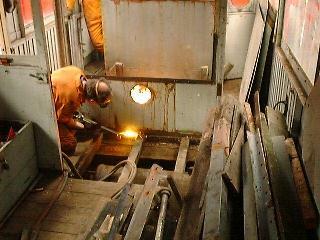 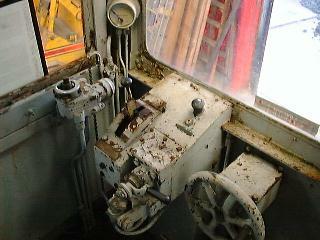 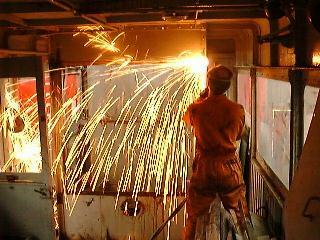 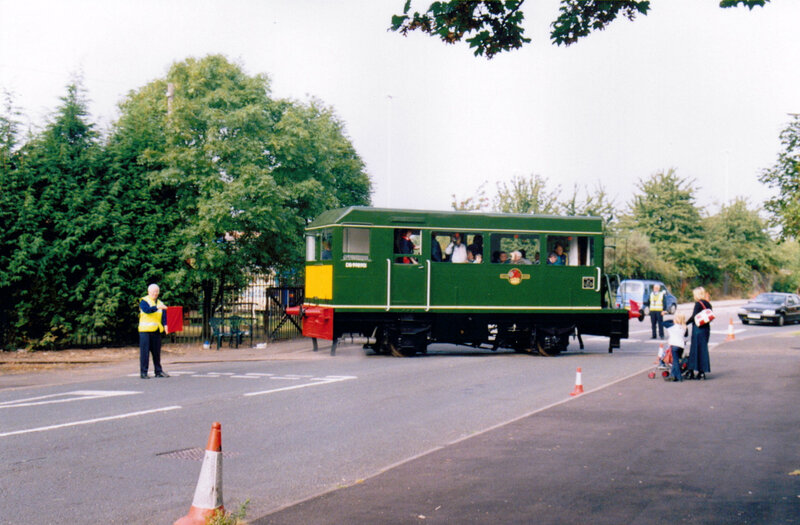 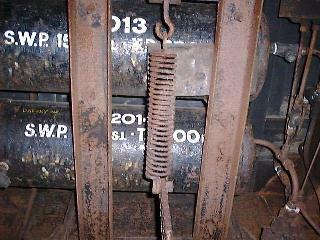 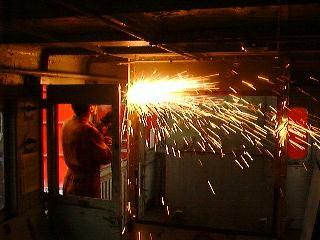 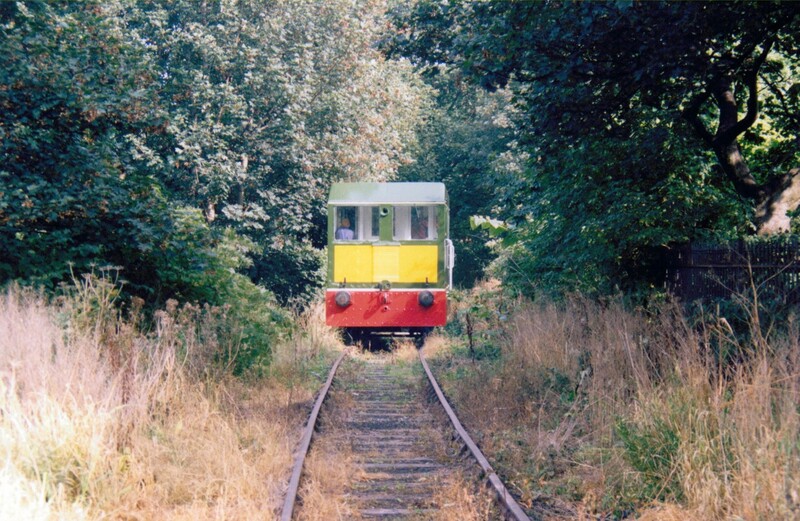 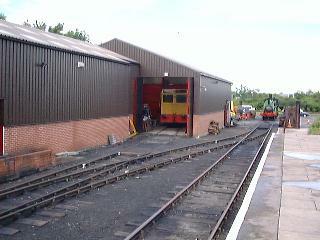 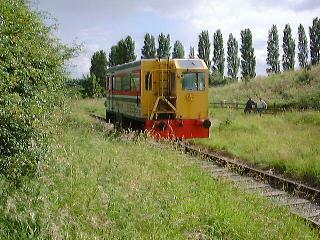 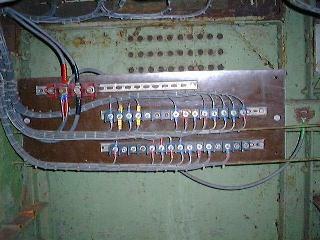 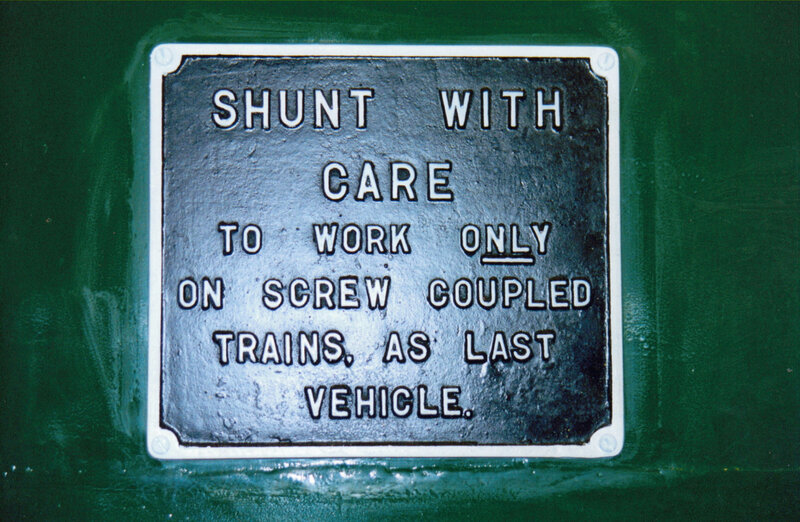 It was originally designed to work at a speed as low as 1.5 mph while inspection of the overhead line is in progress. 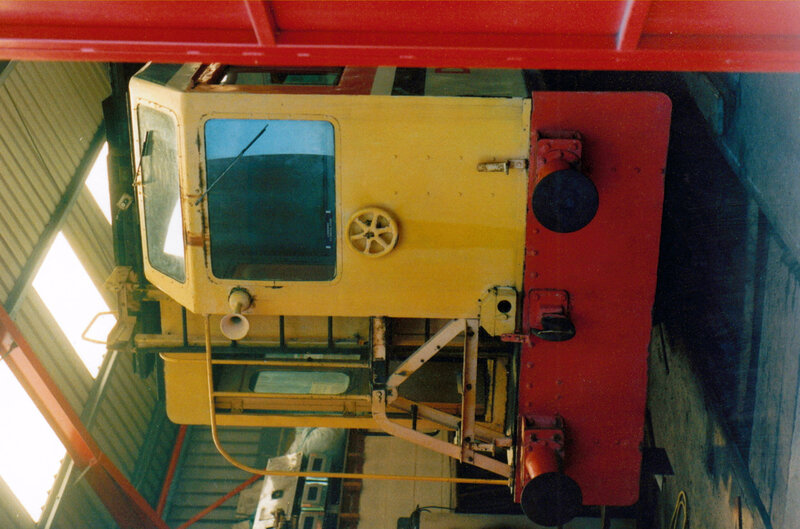 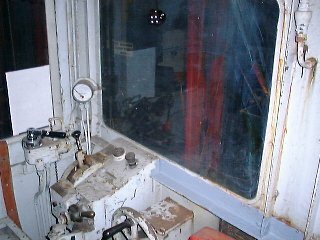 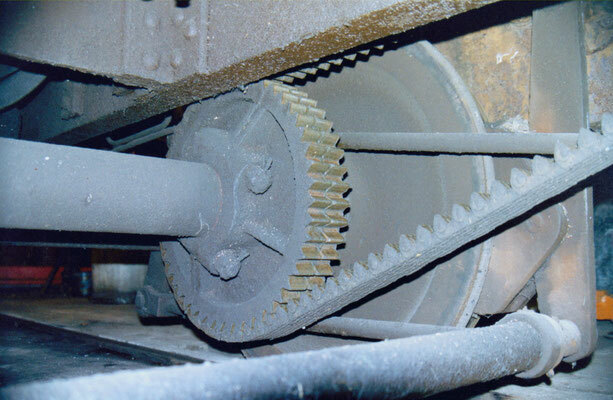 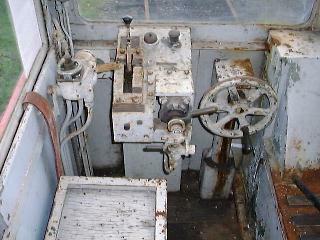 It was fitted with a hydraulically operated inspection tower for this purpose, though this has been removed in Society ownership. 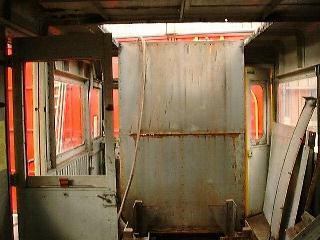 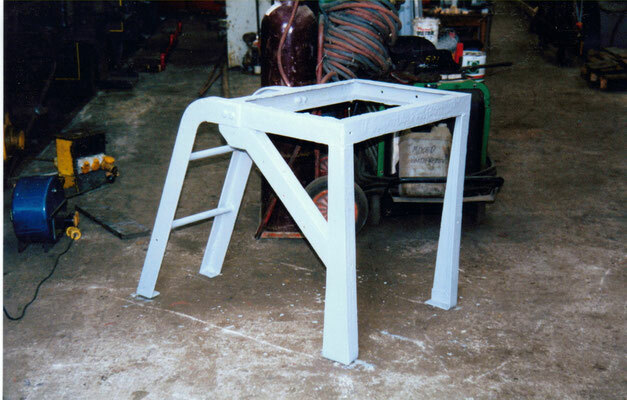 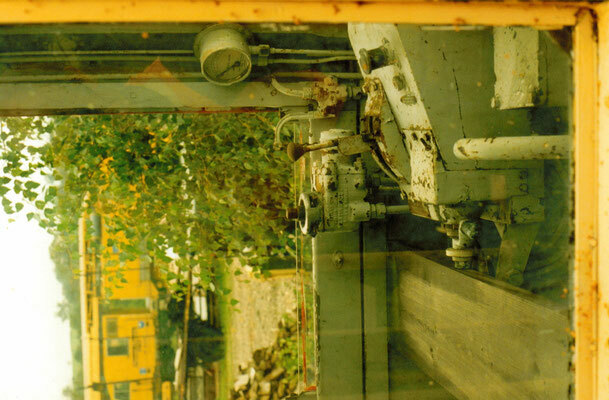 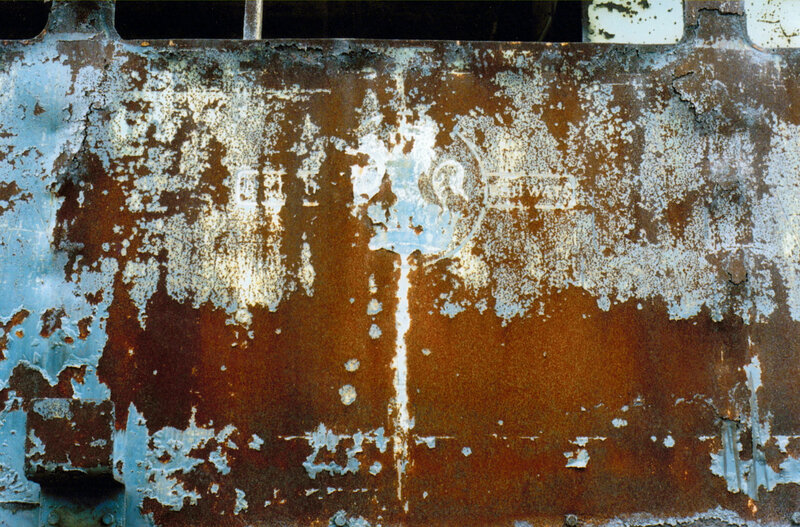 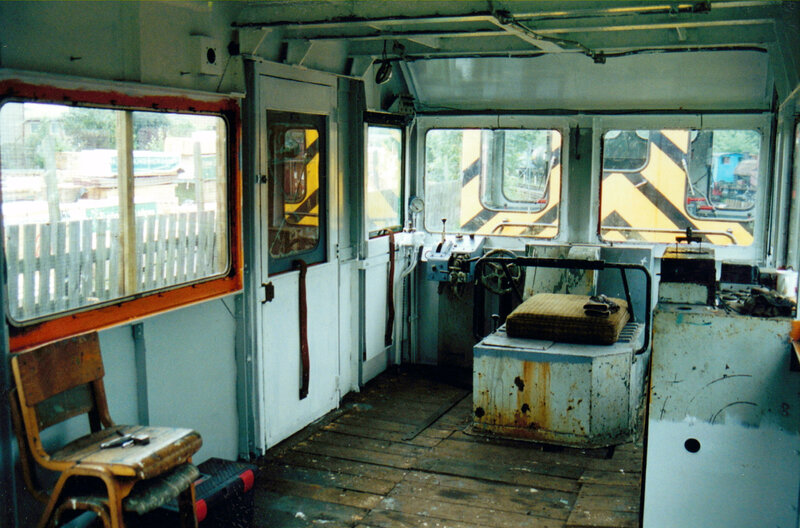 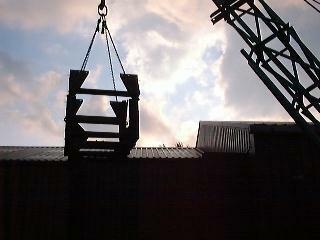 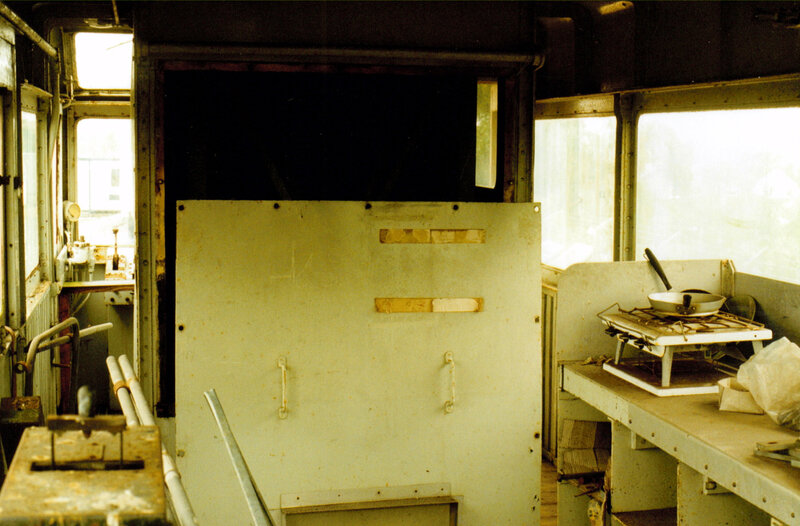 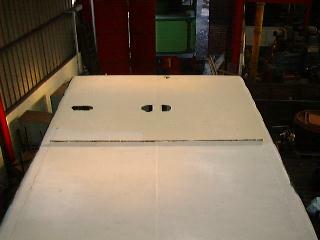 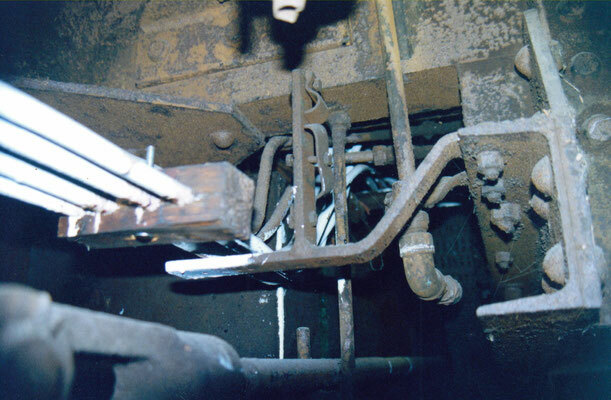 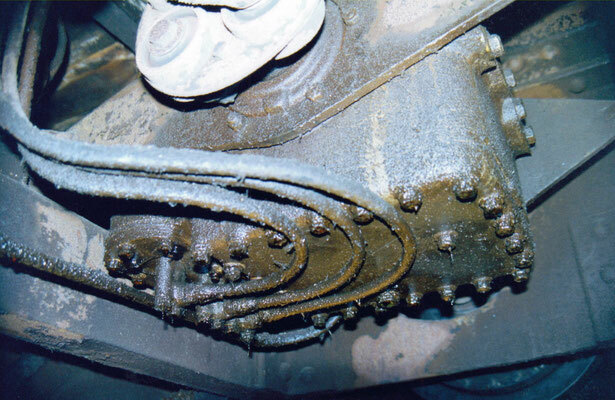 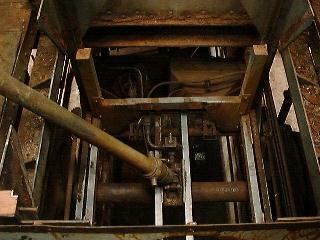 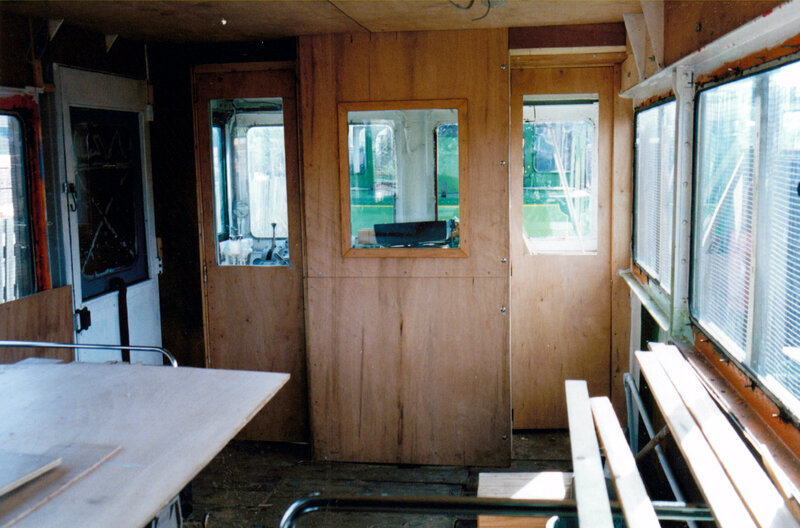 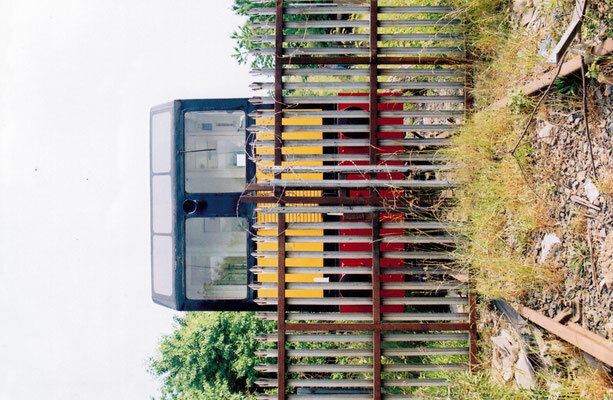 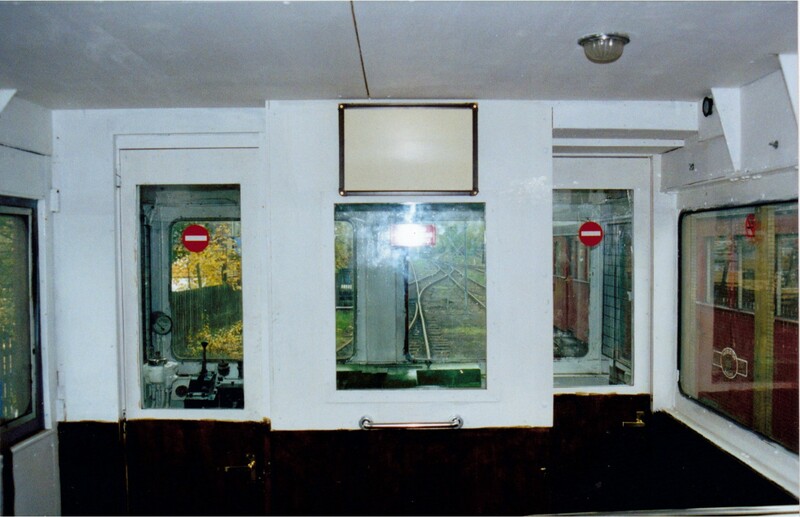 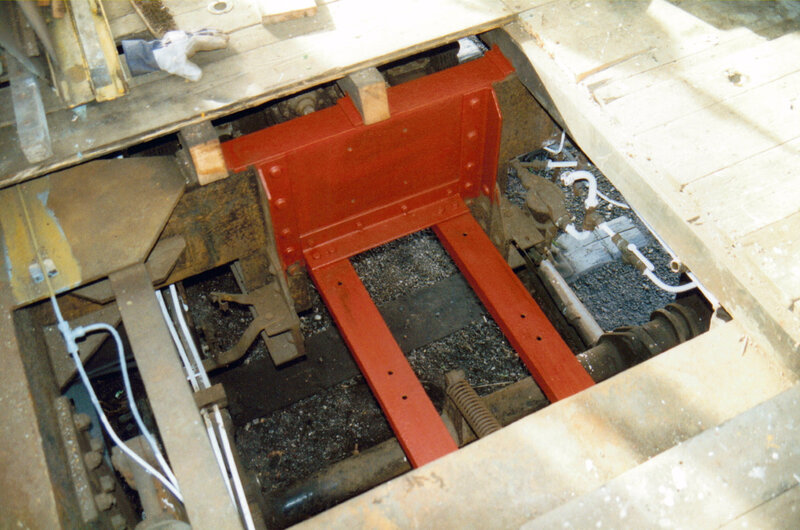 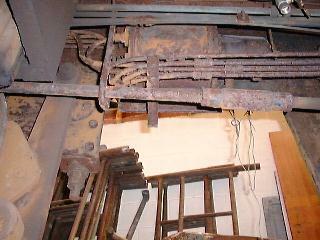 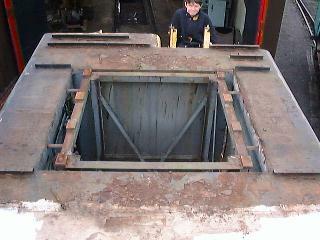 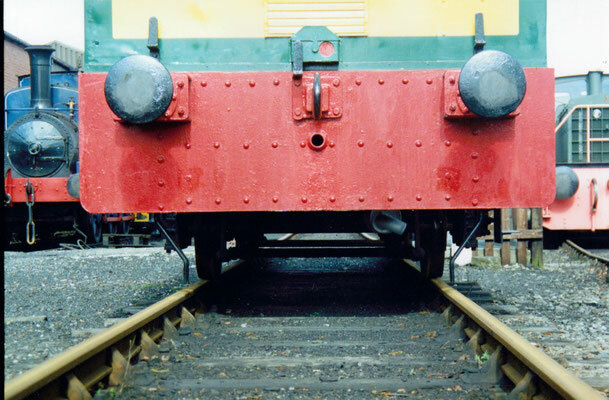 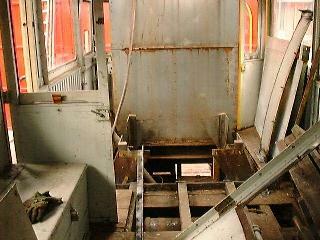 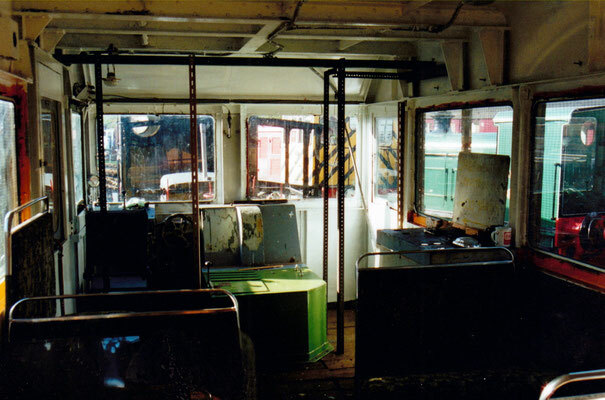 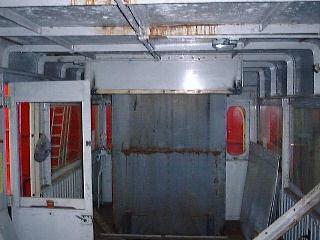 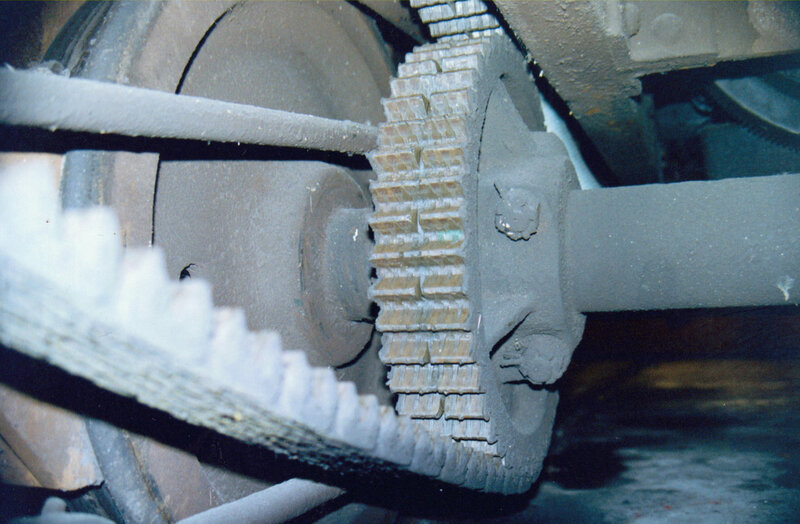 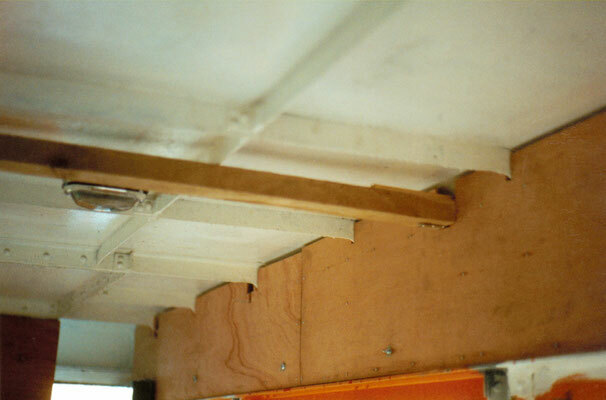 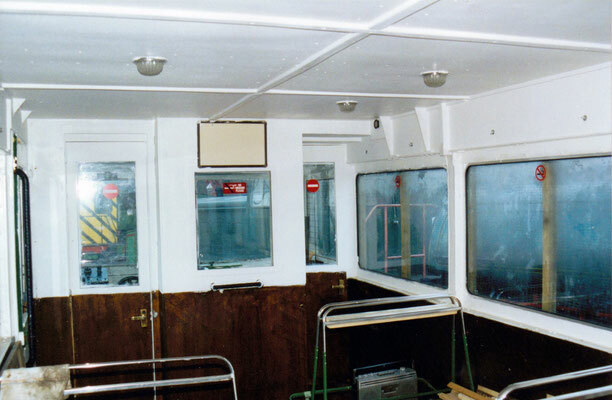 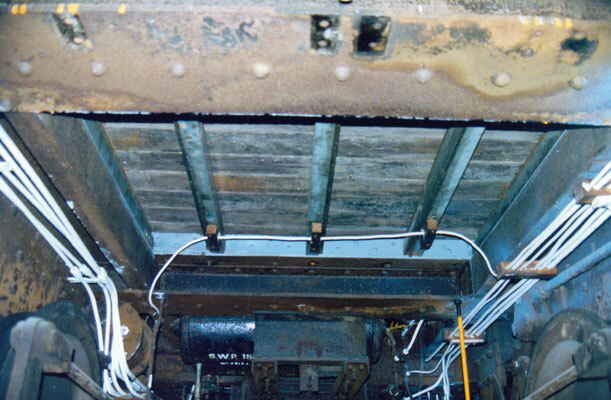 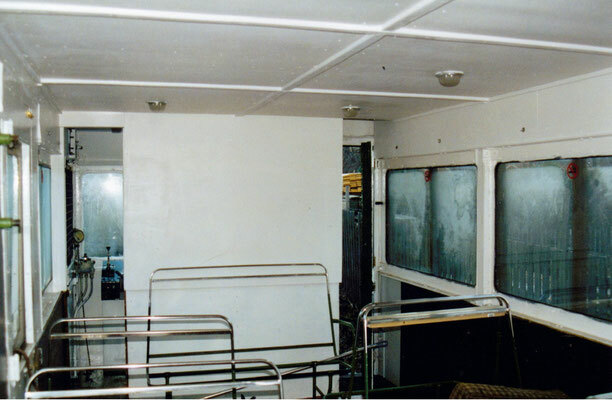 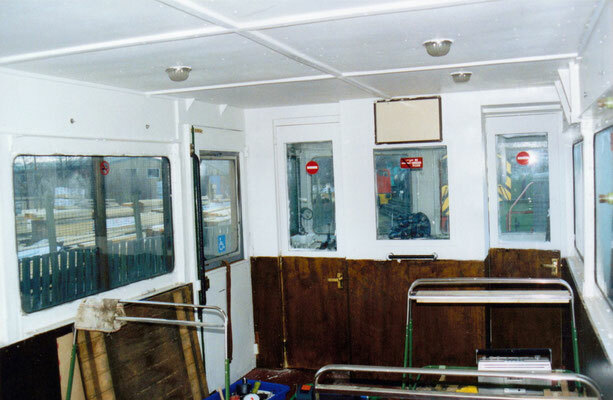 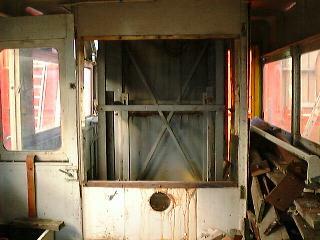 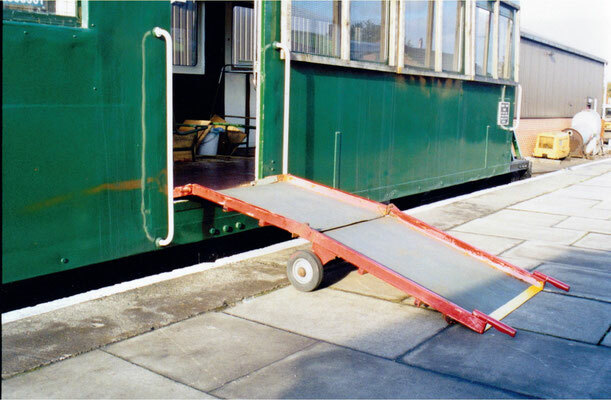 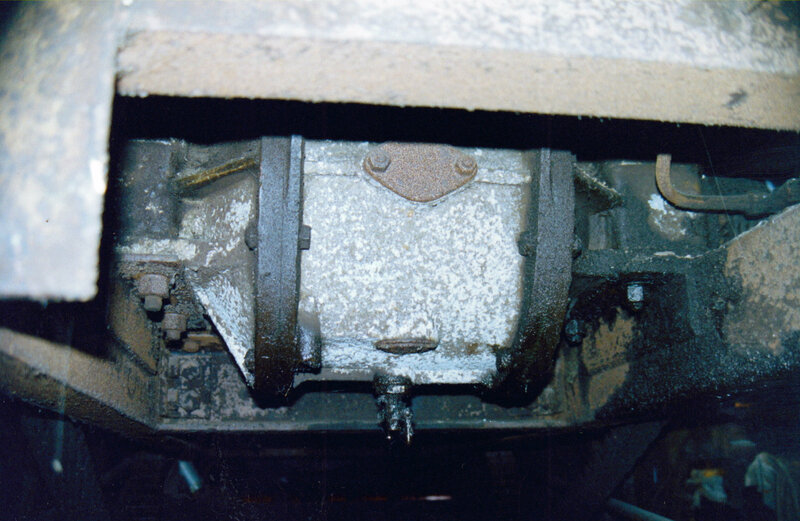 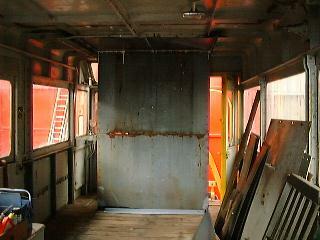 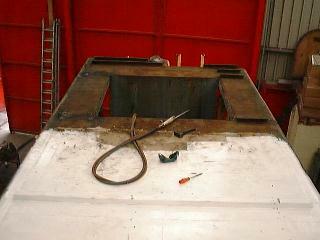 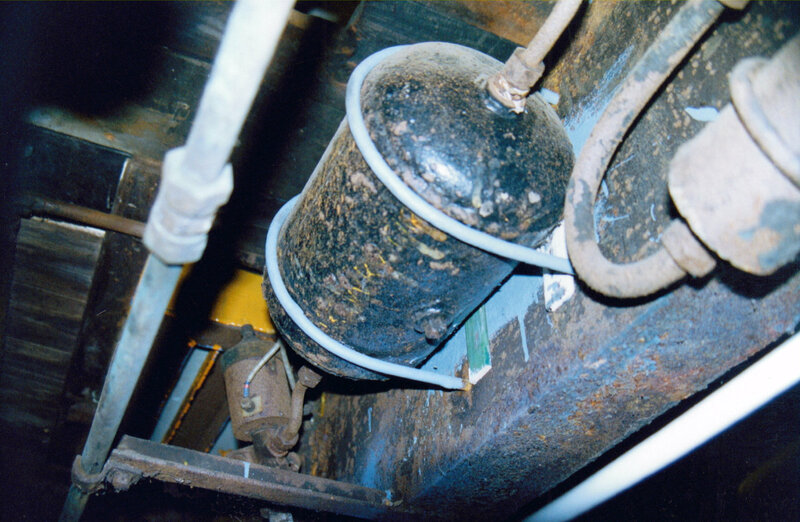 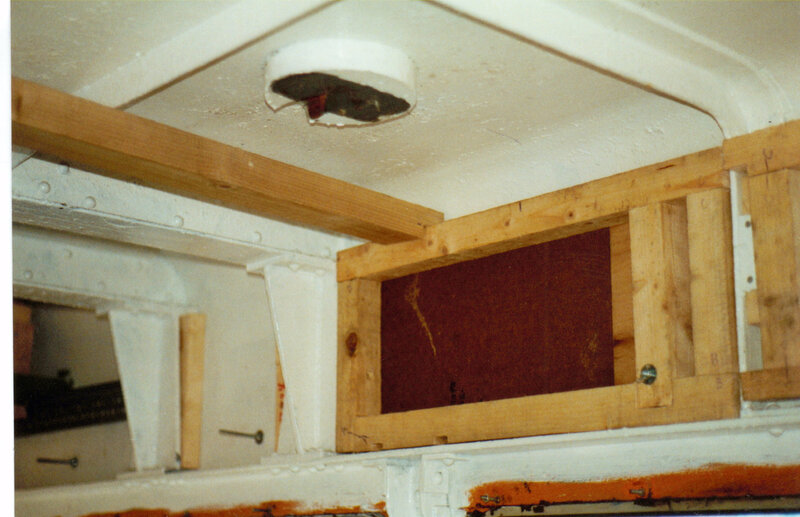 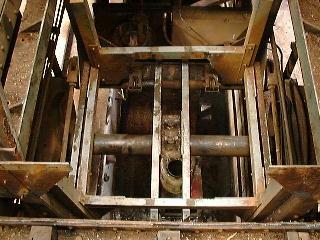 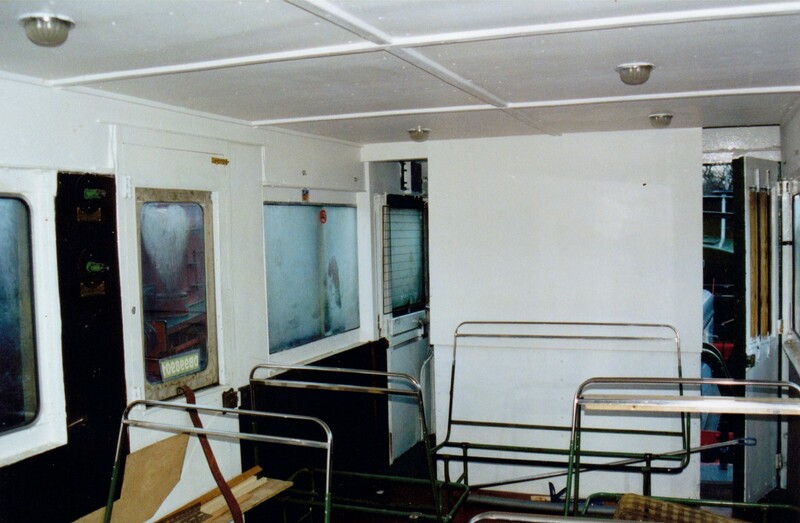 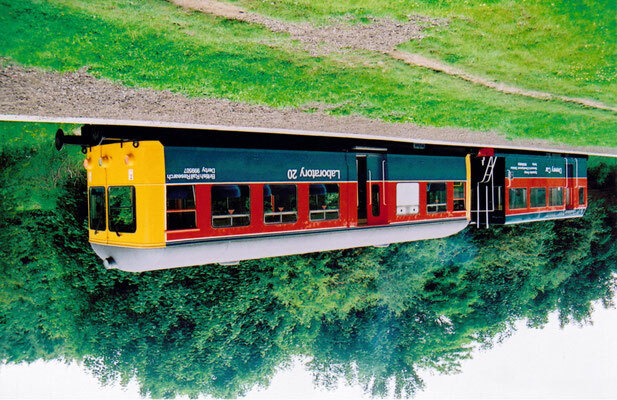 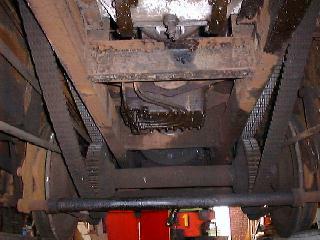 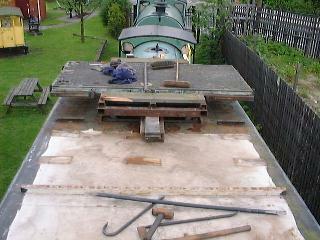 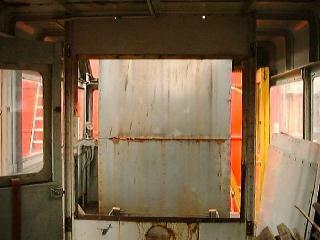 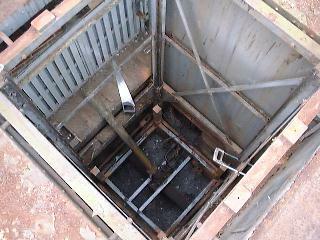 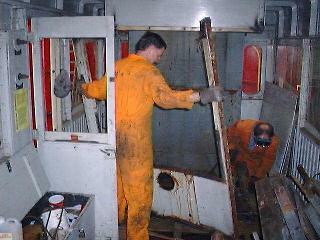 As can be seen from the pictures, the two ends of the vehicle are completely different, one end having a recess for the ladder to the inspection platform. 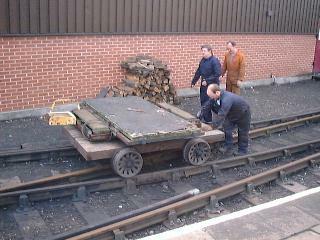 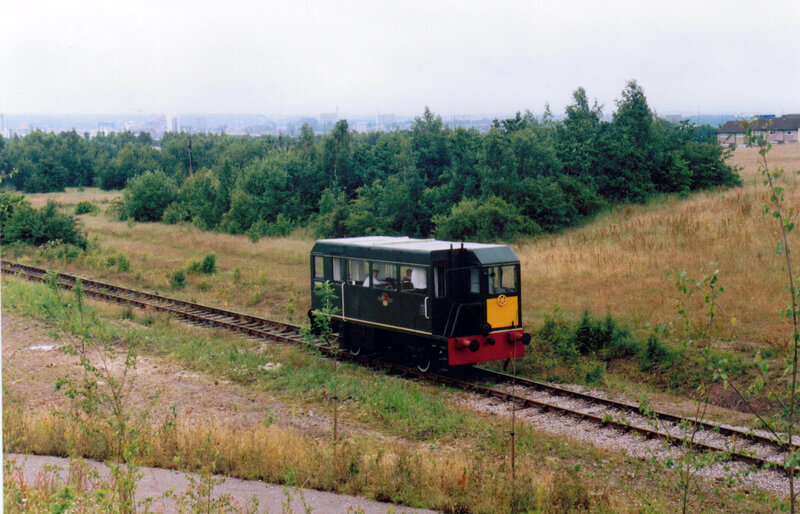 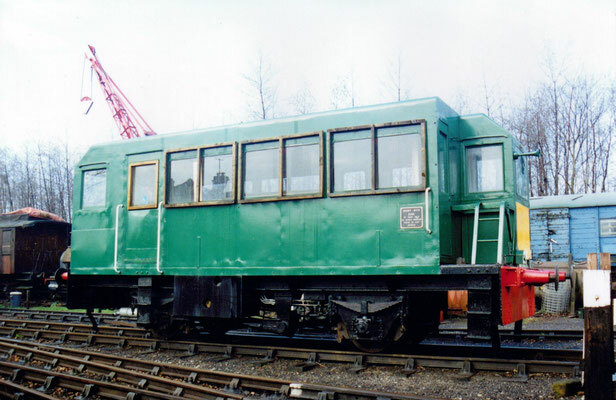 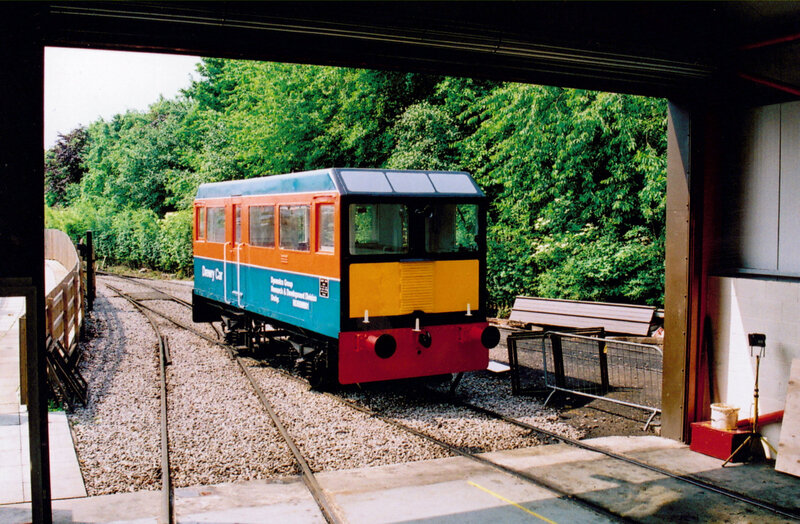 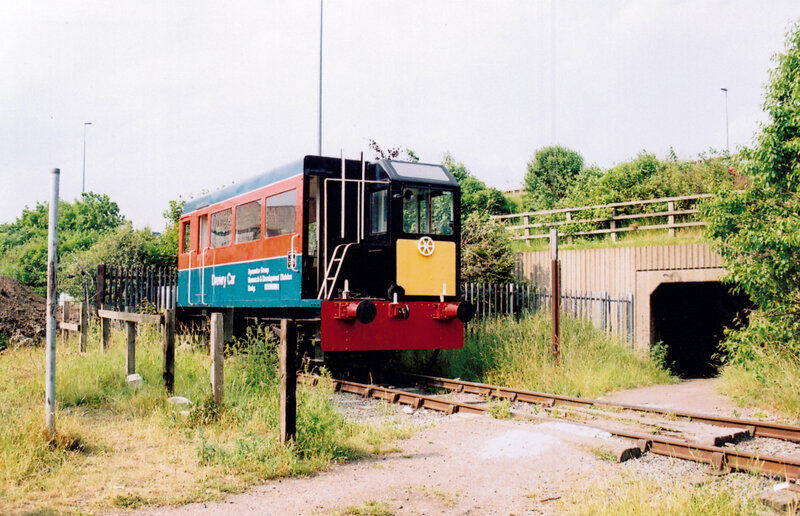 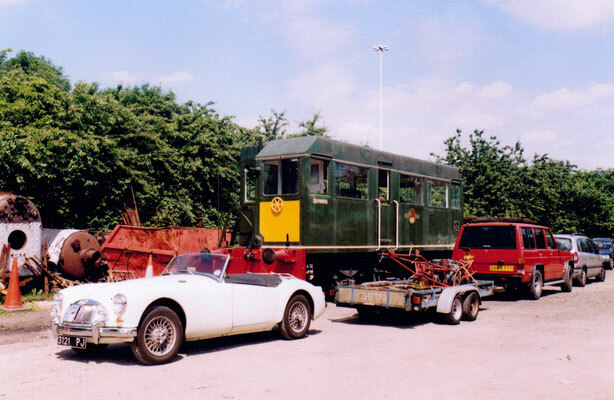 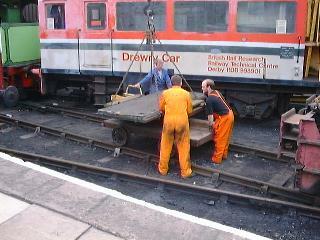 The vehicle is now at the Middleton Railway in Leeds, West Yorkshire, where it is hoped to convert the car, which weighs a mere 16.5 tons and is 29ft long, for use as a passenger carrying vehicle for public service. 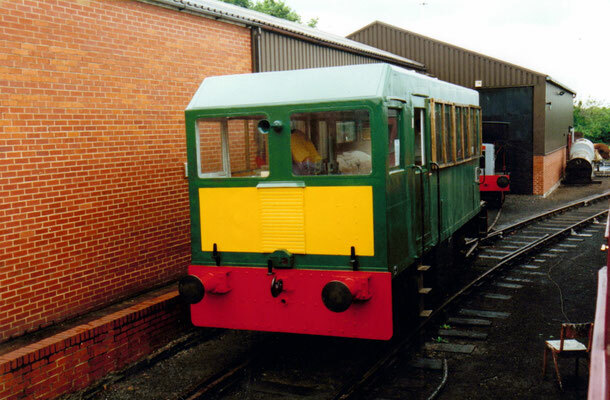 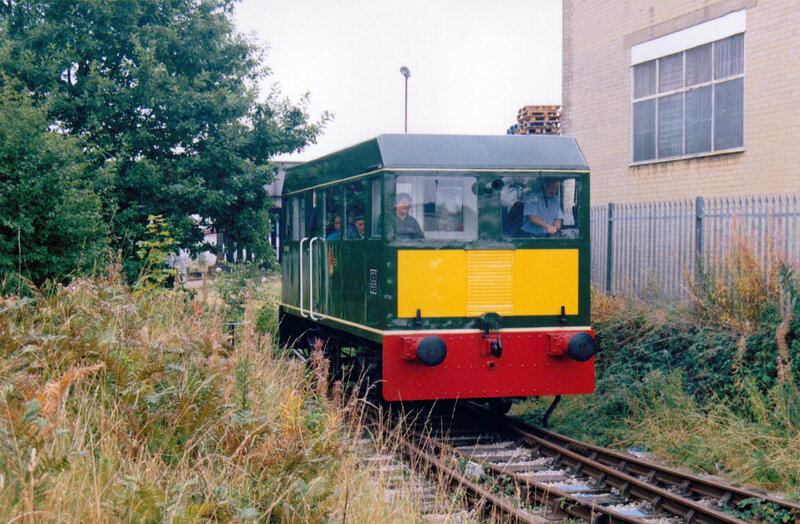 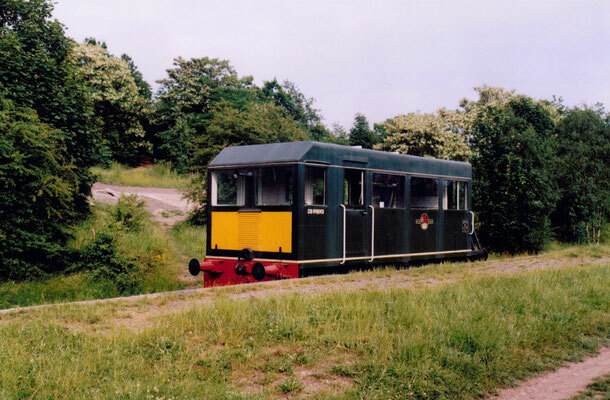 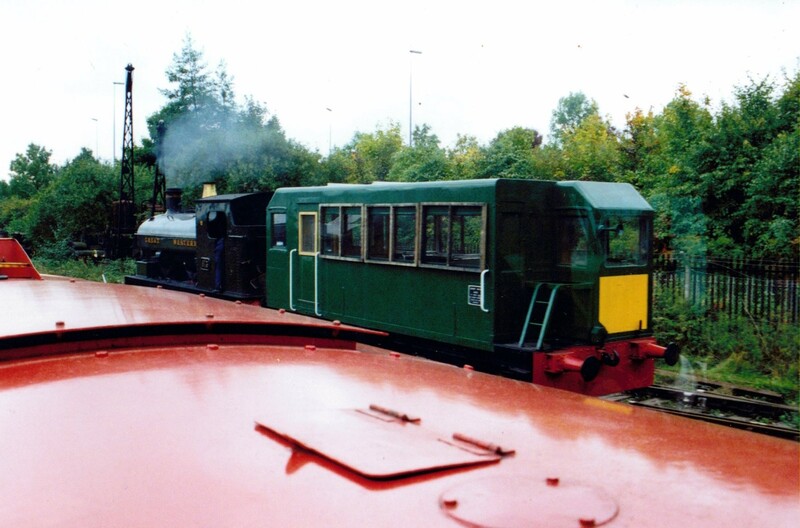 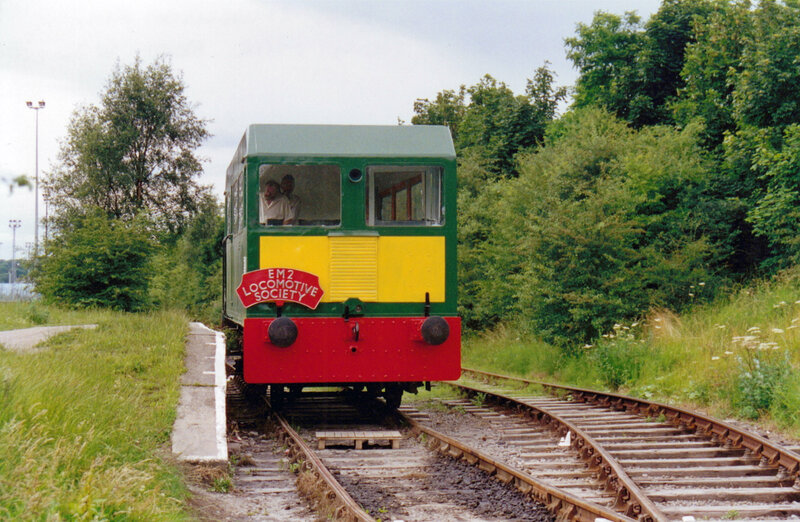 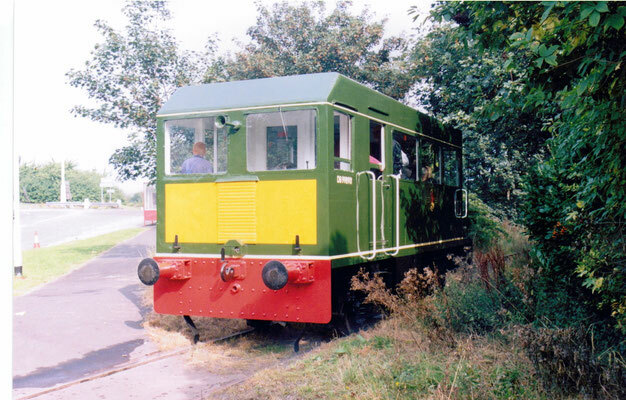 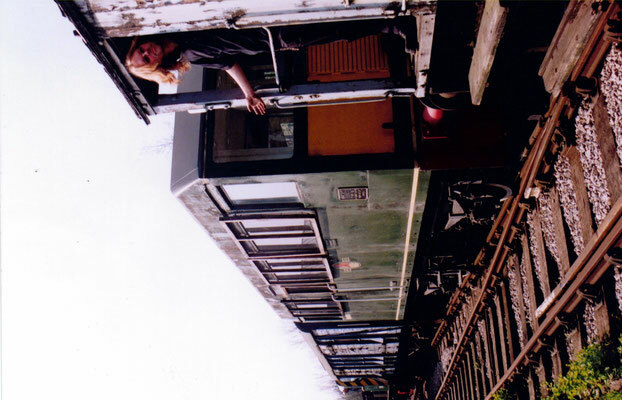 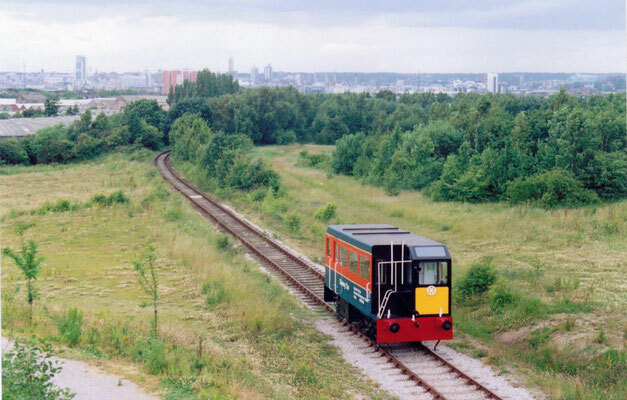 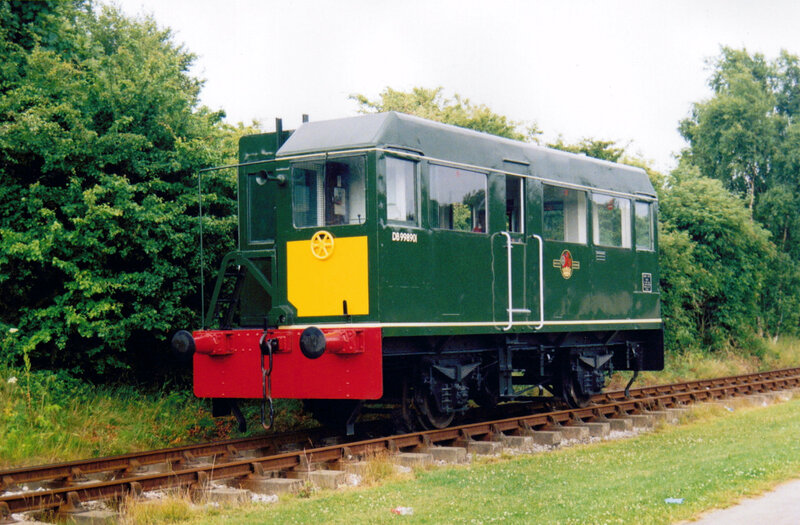 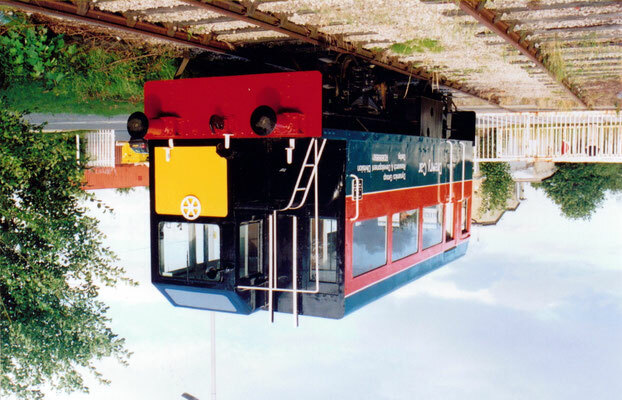 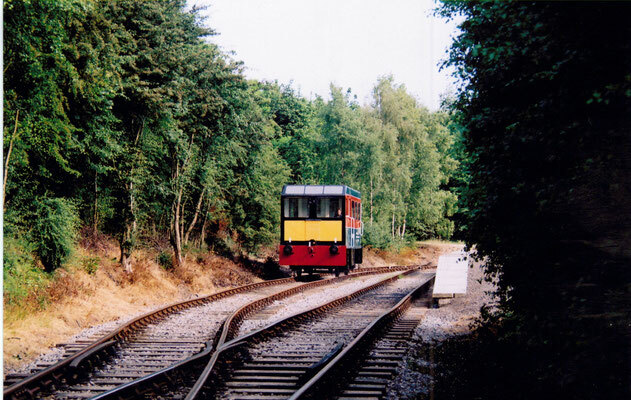 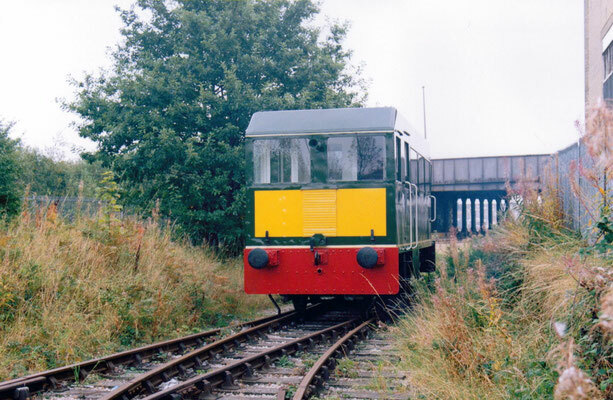 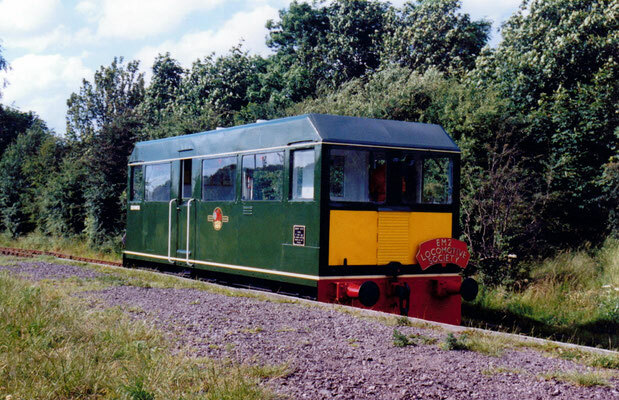 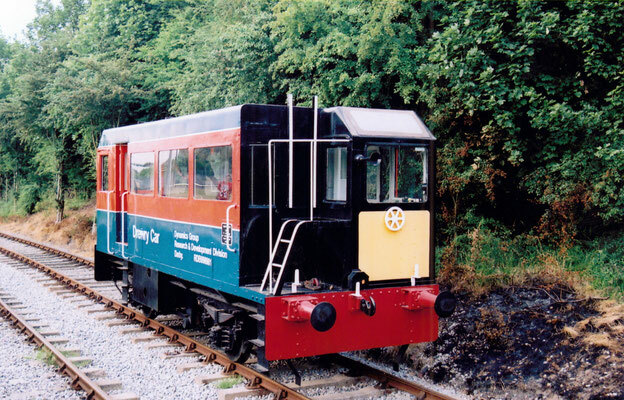 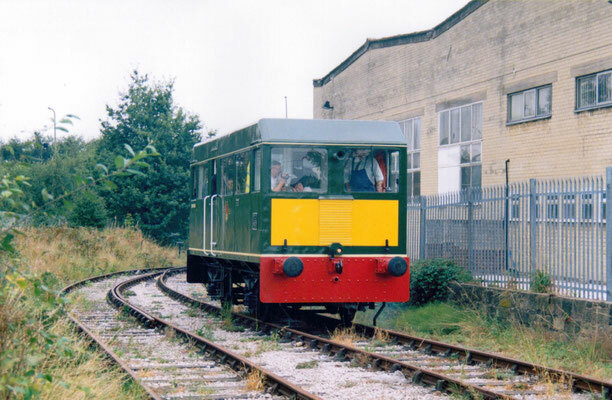 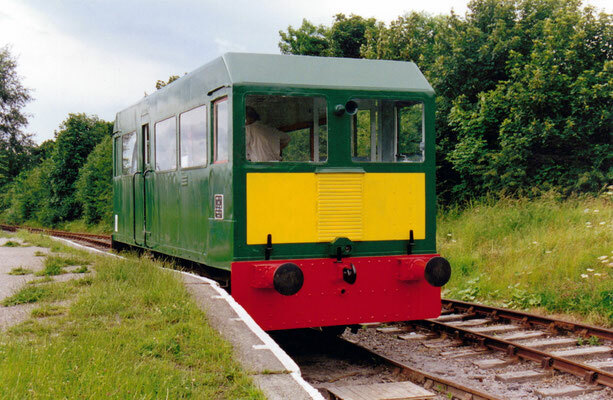 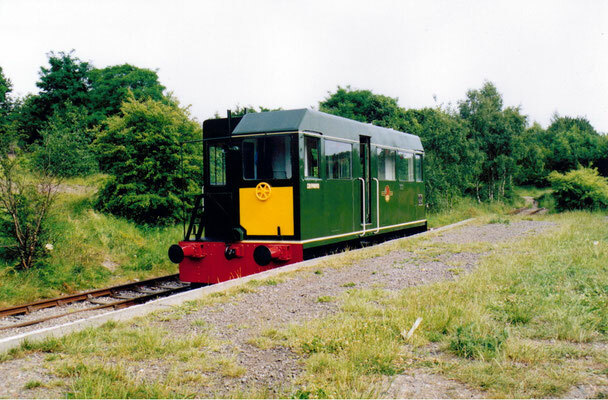 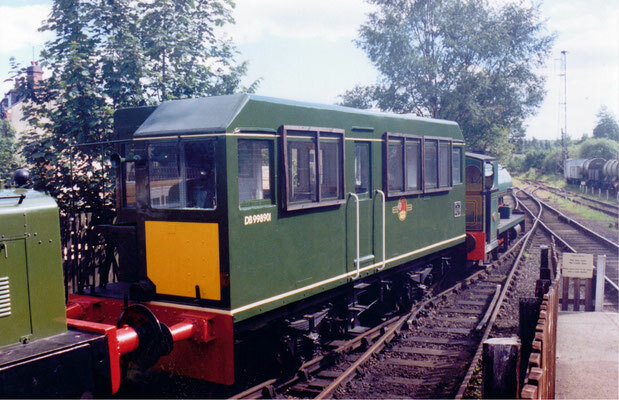 Since arrival she has acquired the nickname Olive (Overhead Line Inspection VEhicle) and on 27th June 1998 was successfully operated under her own power, probably for the first time in over 5 years! 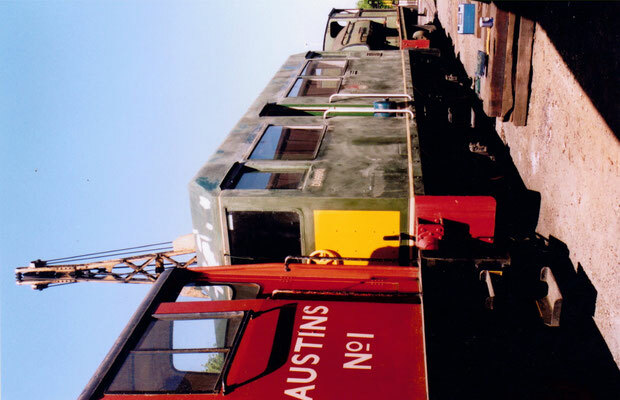 The big day finally arrived on 31st August 2002 when she was used in public service for the first time. 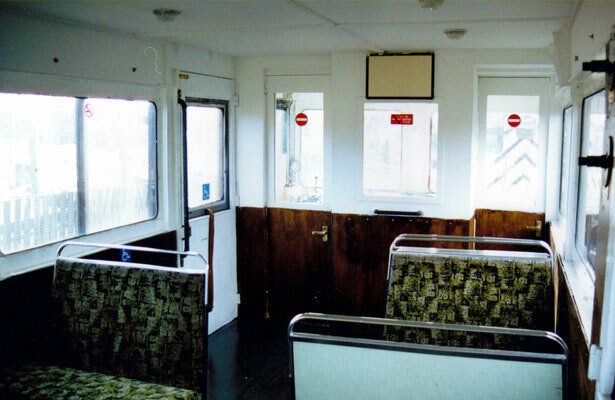 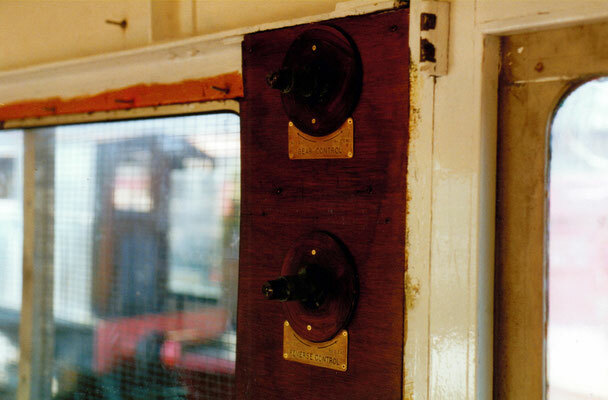 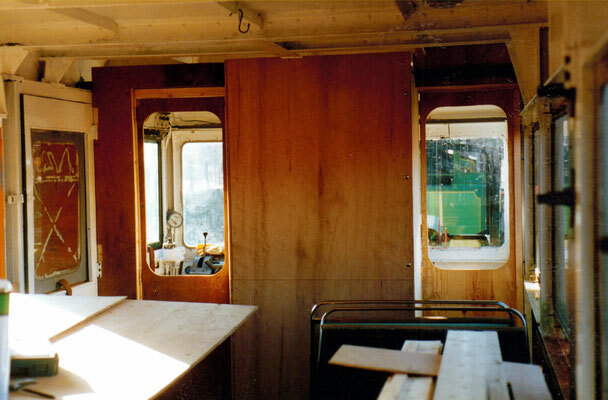 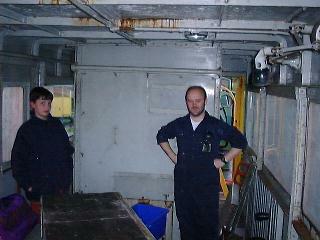 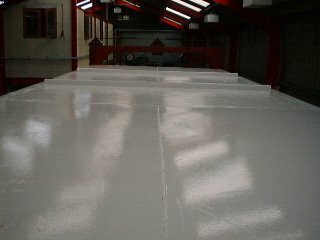 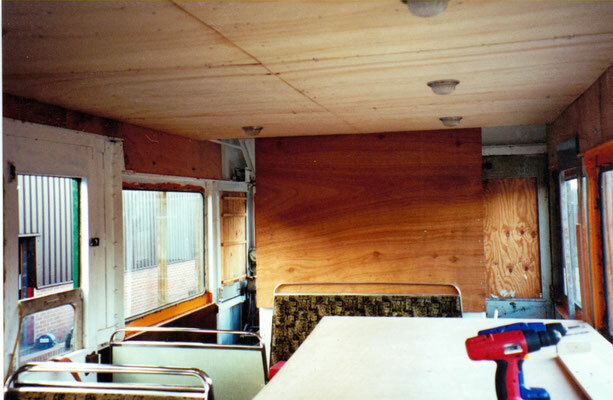 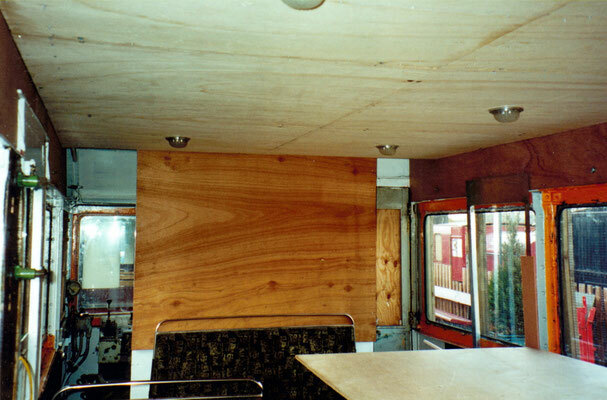 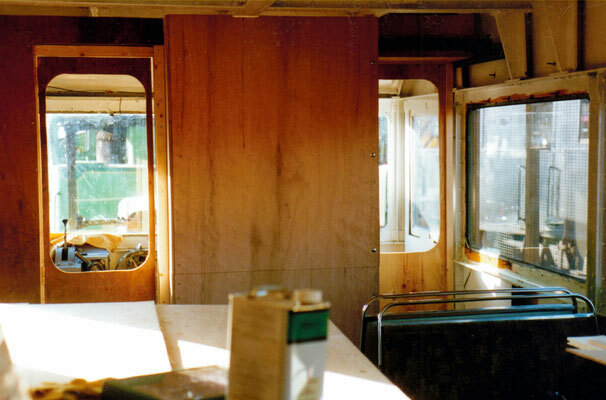 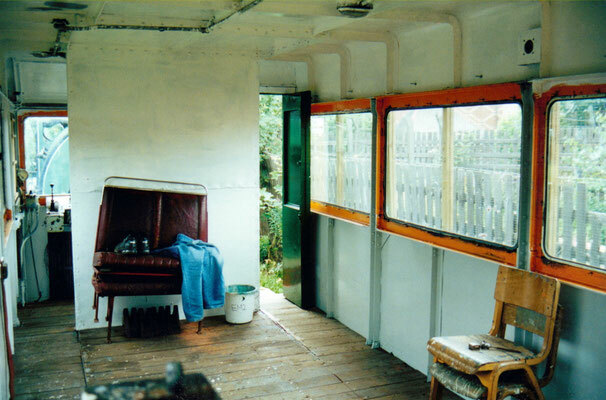 The two photos below taken on that day by Chris Nicholson clearly show the high standard of the refurbishment.